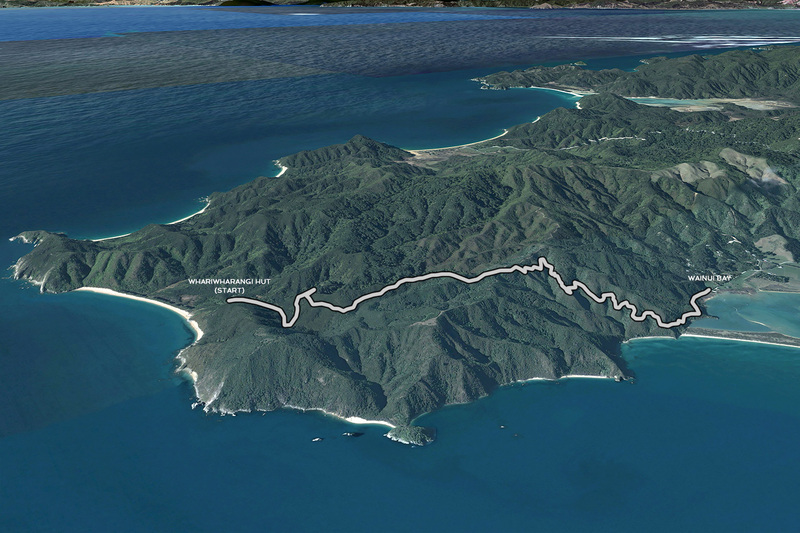 The 60 km Abel Tasman Coast Track is usually walked in 3 to 5 days. 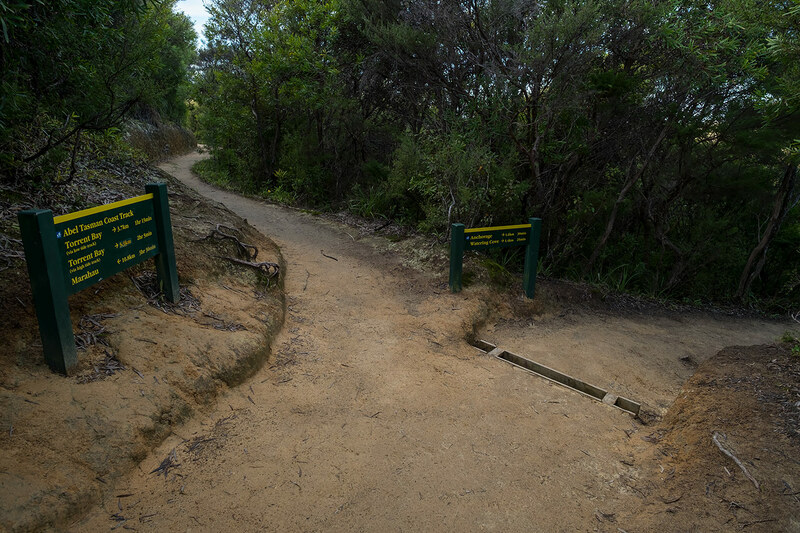 The track can be walked in either direction. 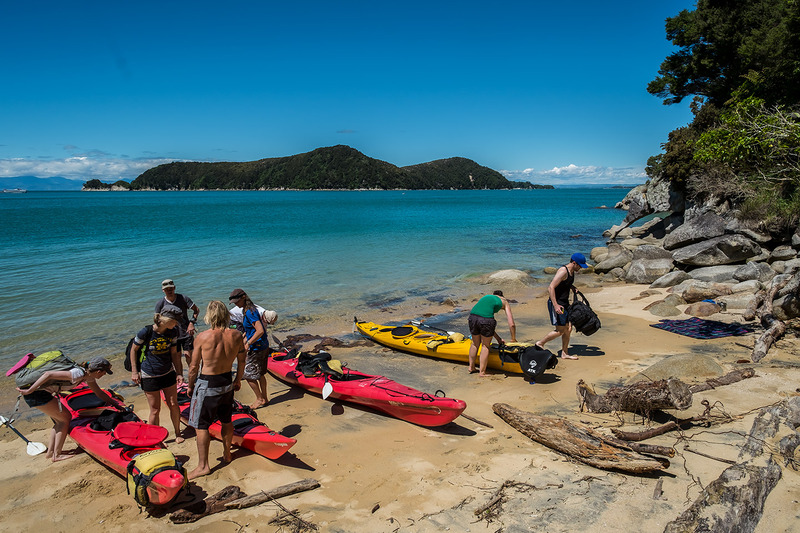 The main consideration is when Low Tide is on the day we need to cross Awaroa Inlet. 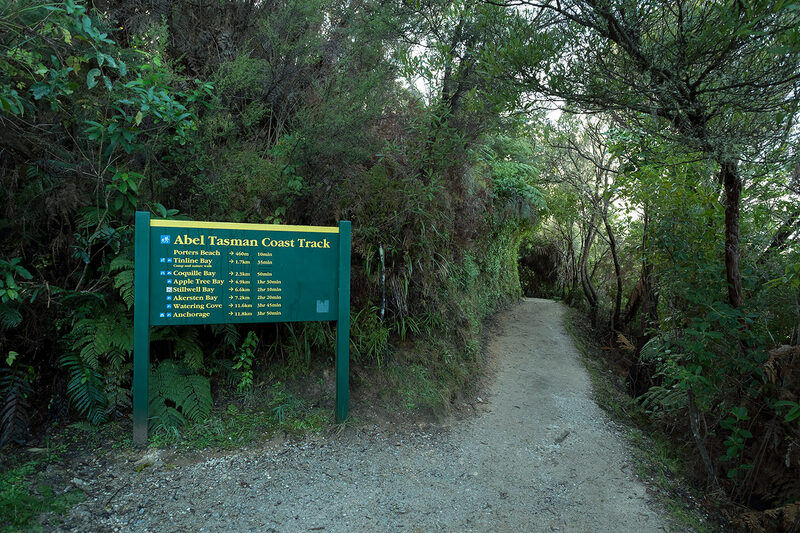 Talk with the Department of Conservation (DOC) and they will advise which direction to walk the track. 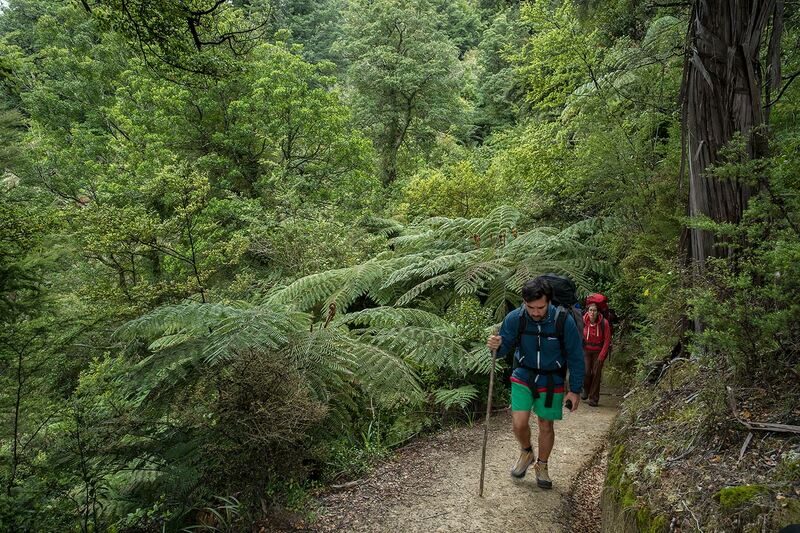 MARAHAU TO ANCHORAGE - An easy 4 hour 12.4 km walk. 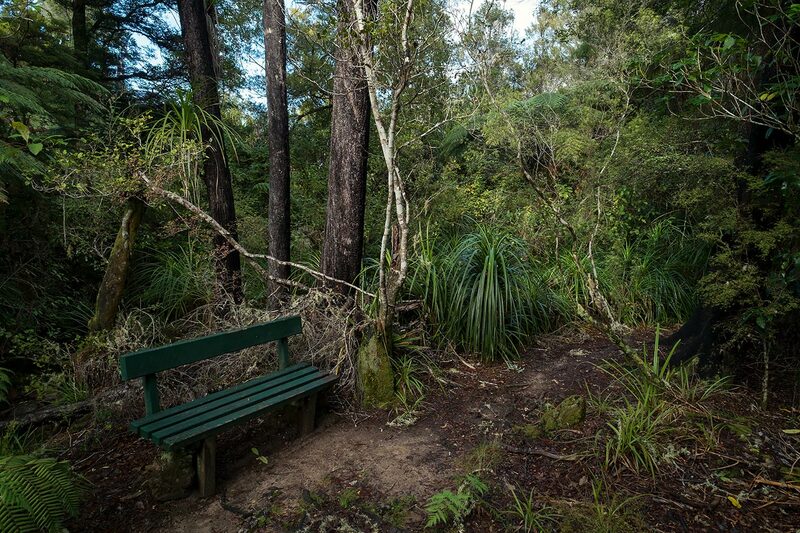 The walk begins here - at the Marahau Shelter. 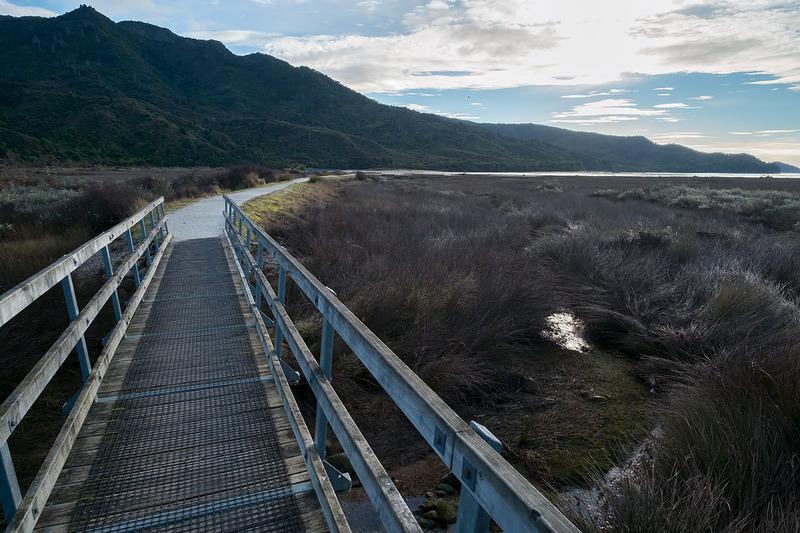 The track crosses bridges and follows a causeway across the Marahau Estuary. 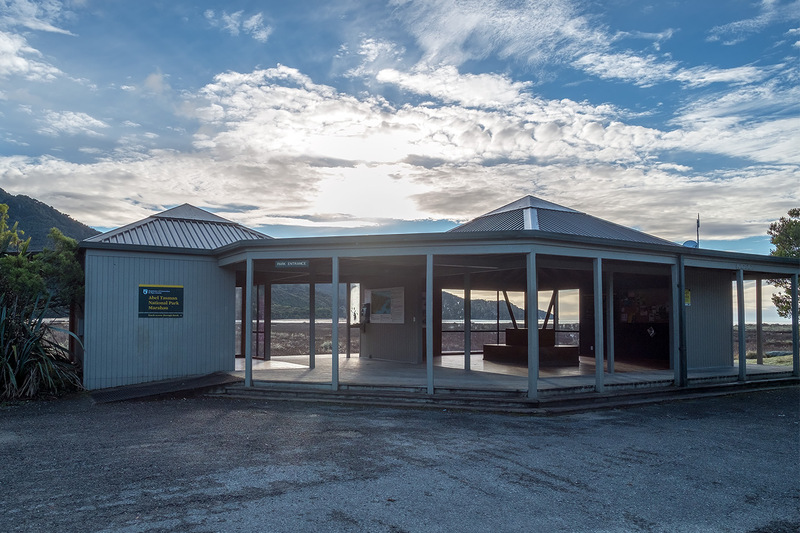 Stu's Lookout gives us our first glimpse of Adele Island and the Astrolabe Roadstead. 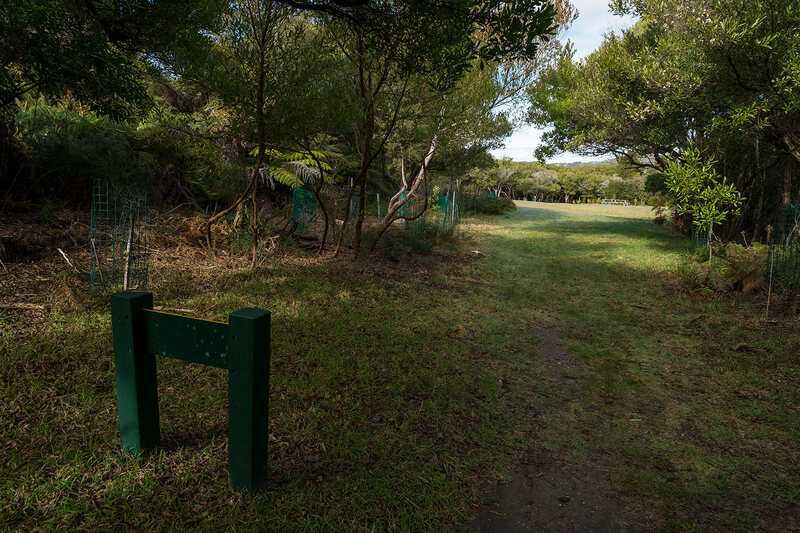 TINLINE CAMPSITE - 15 non-powered tent sites. 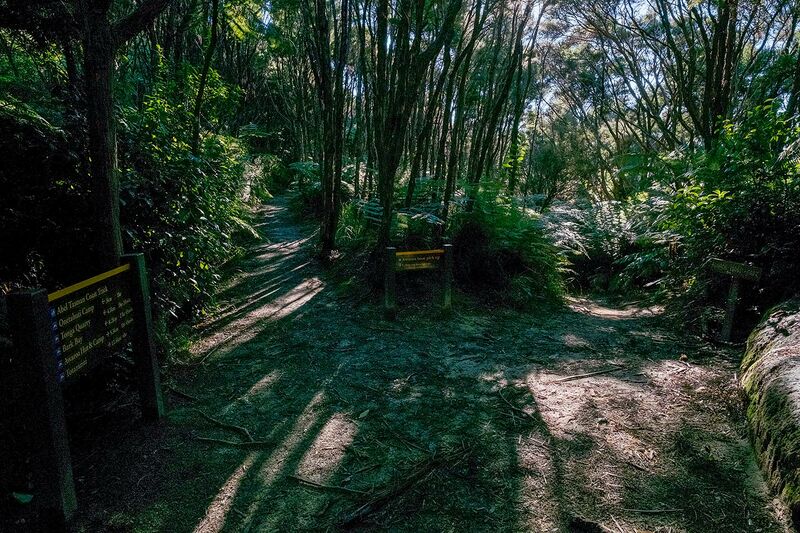 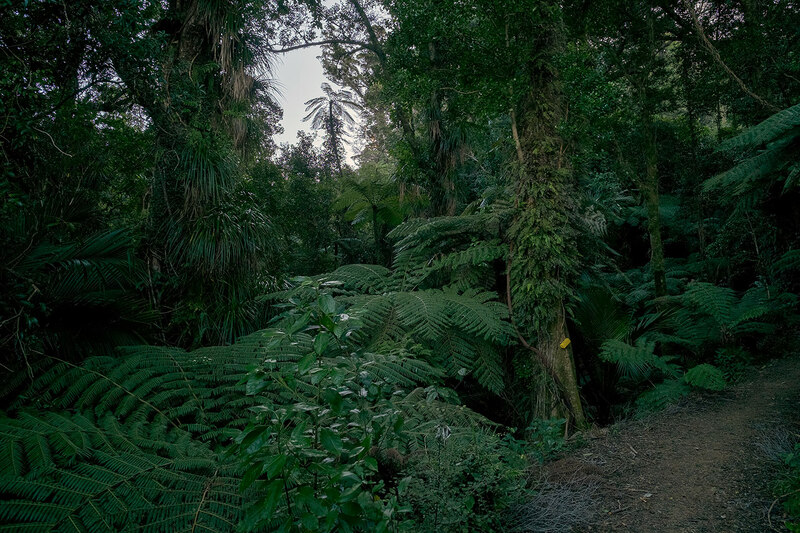 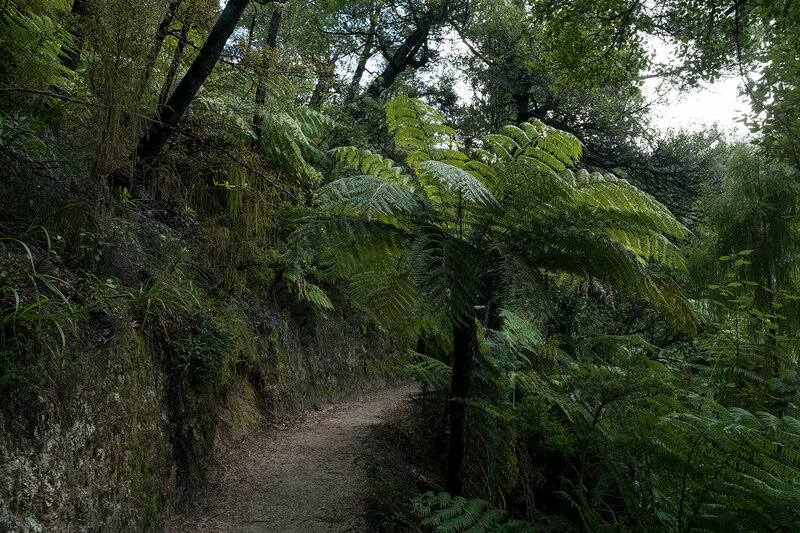 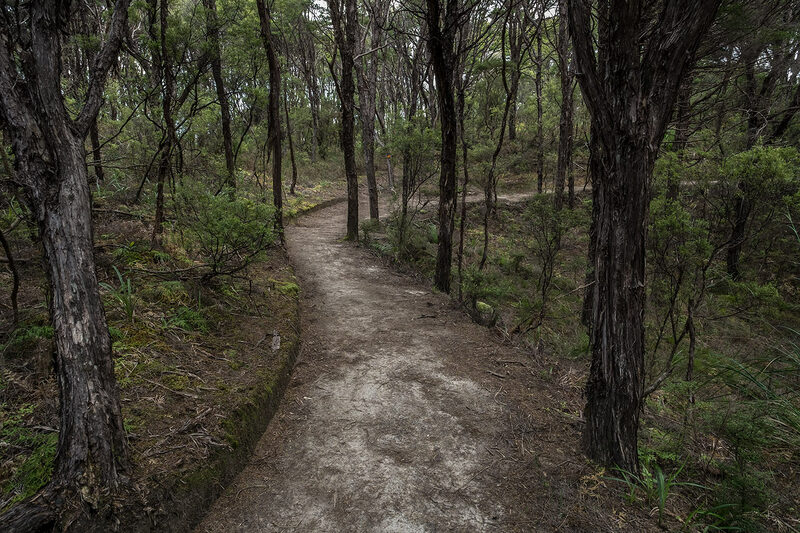 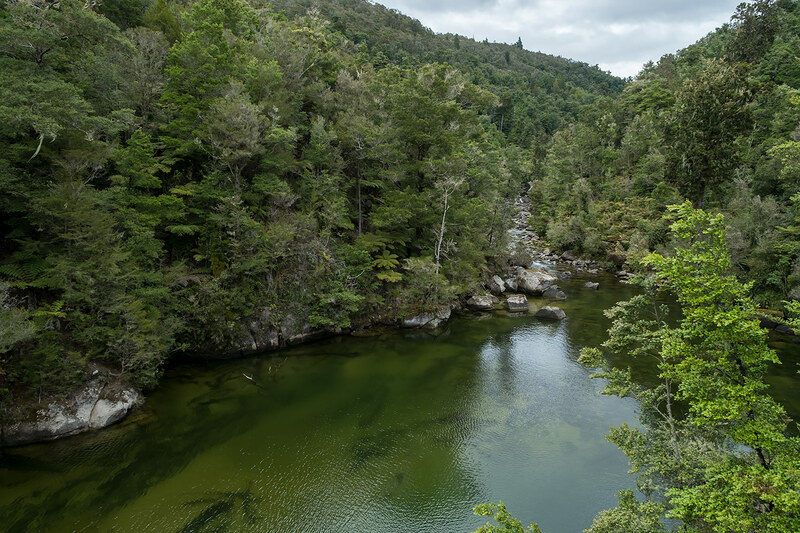 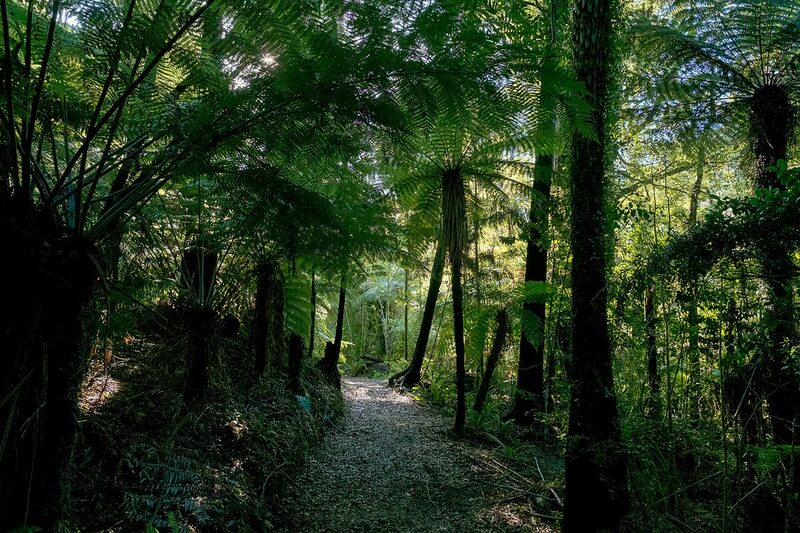 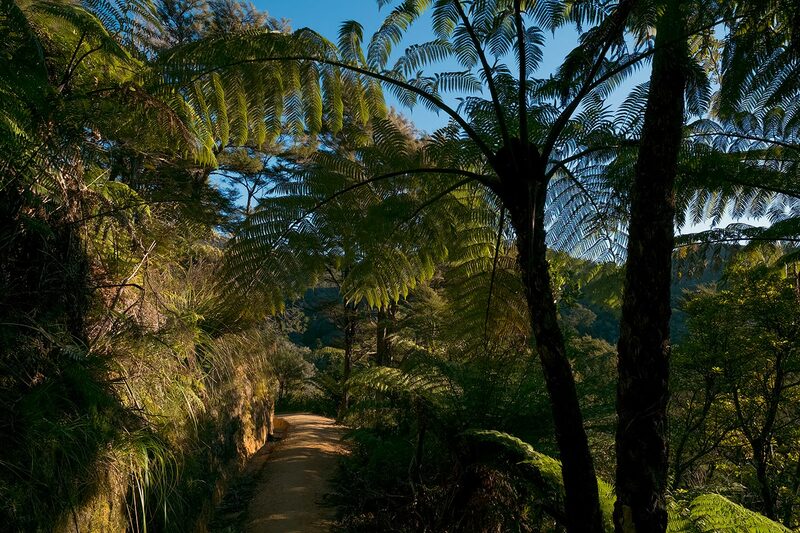 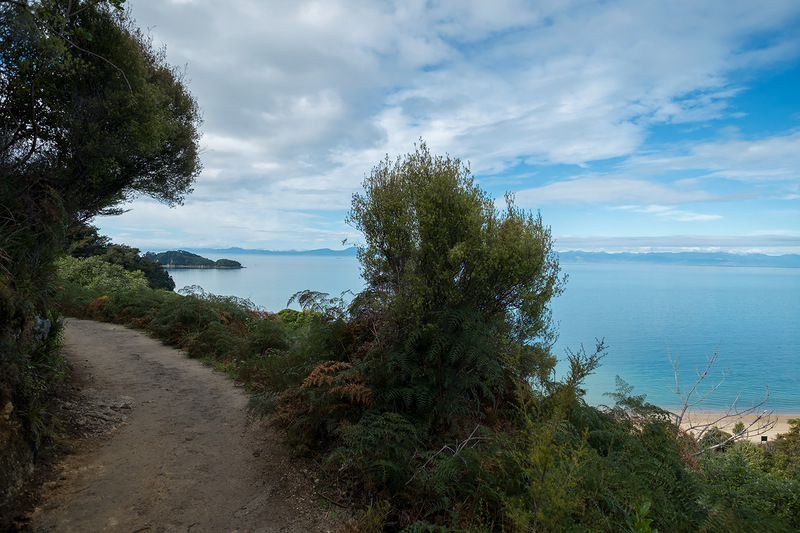 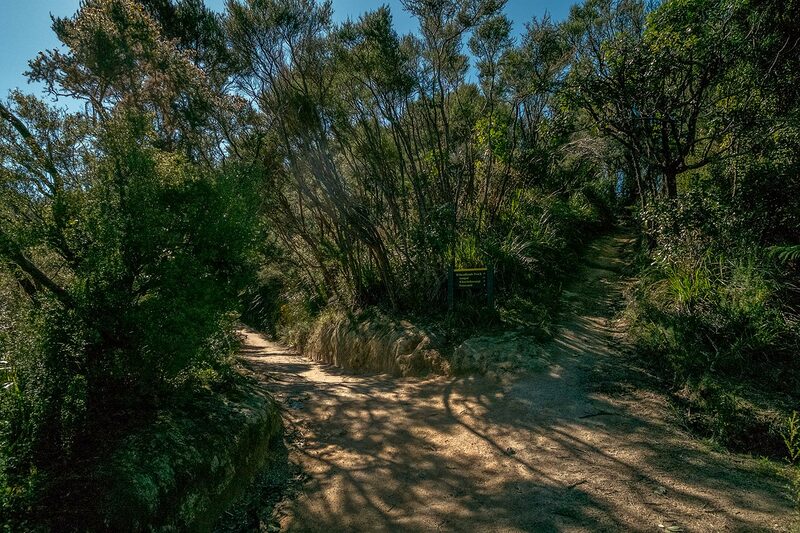 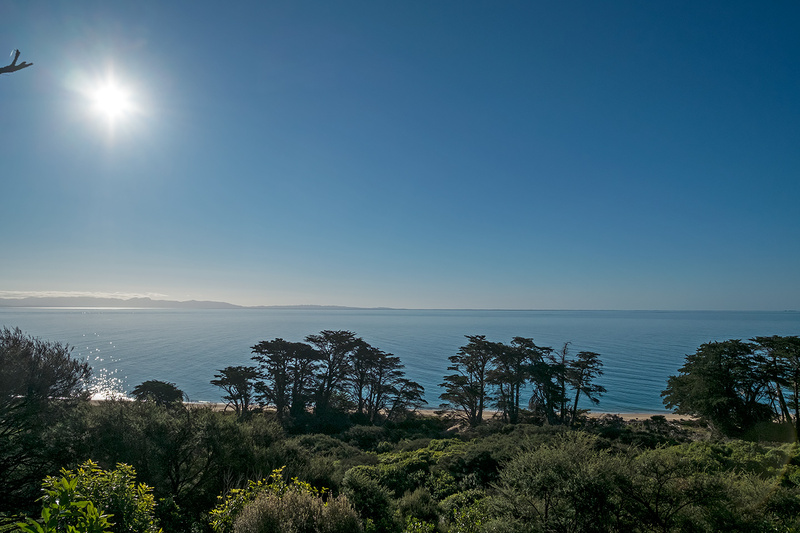 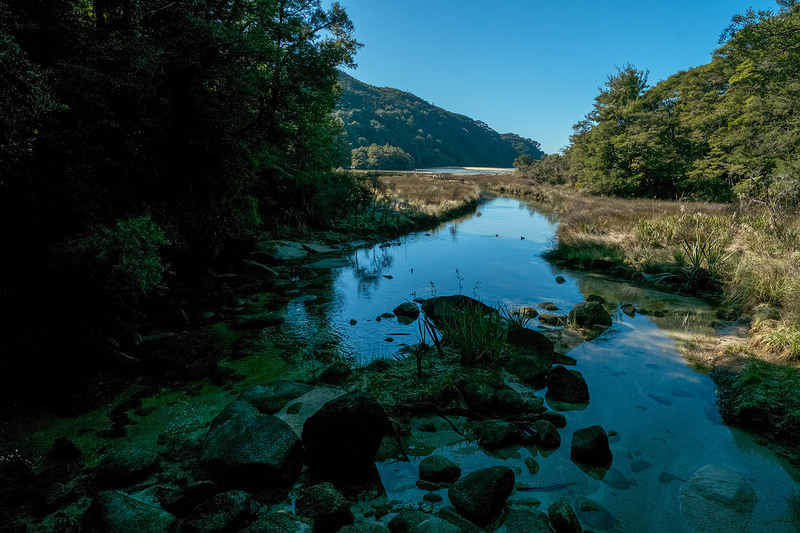 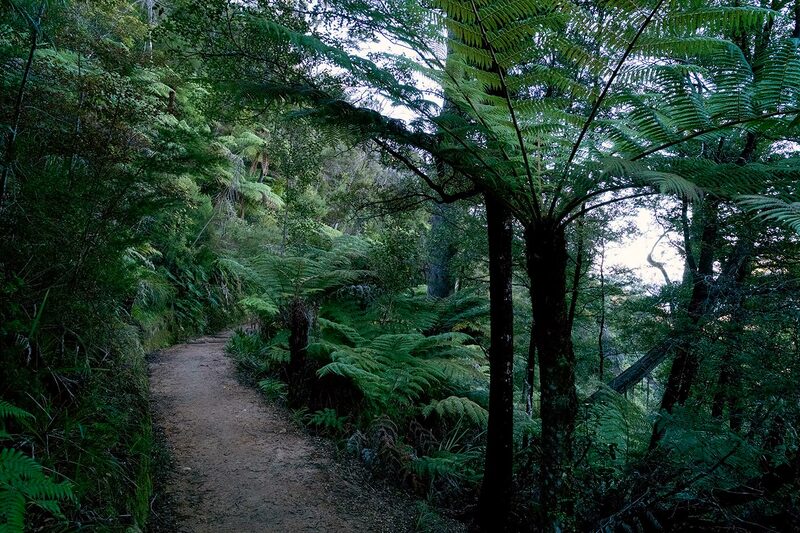 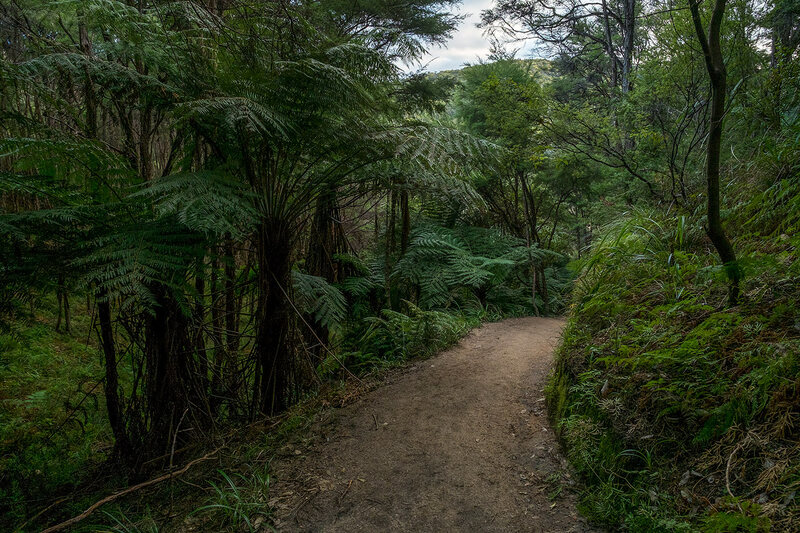 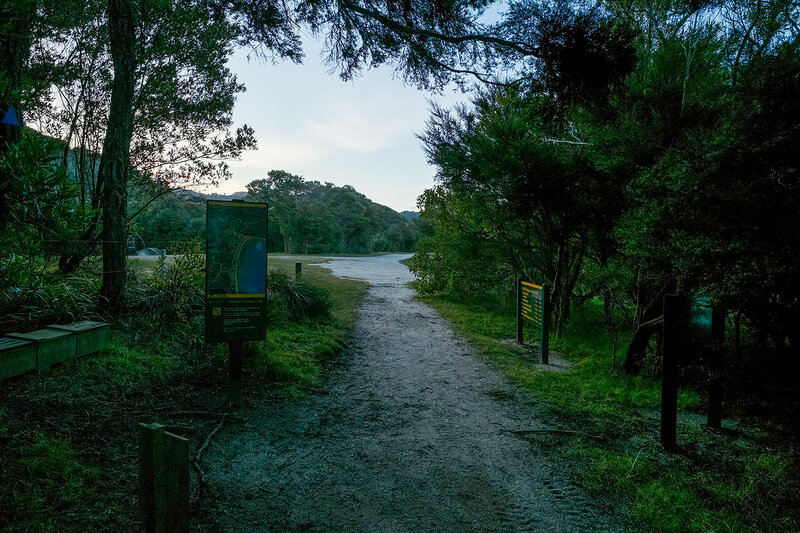 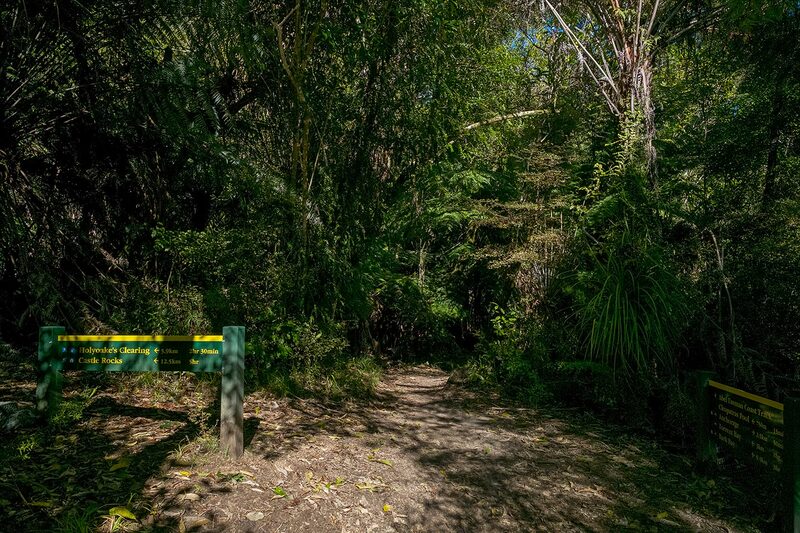 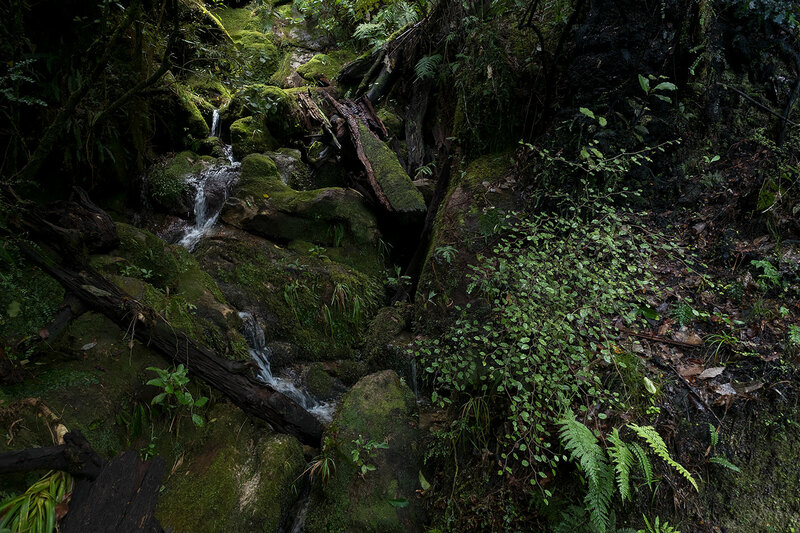 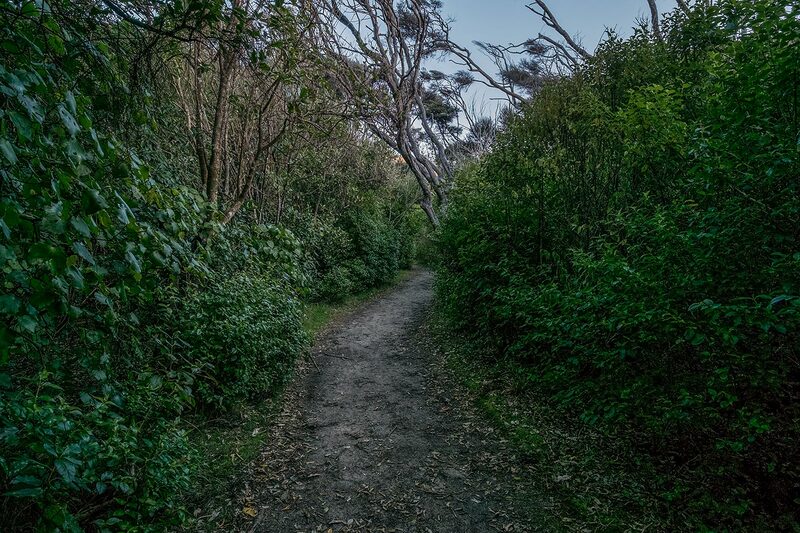 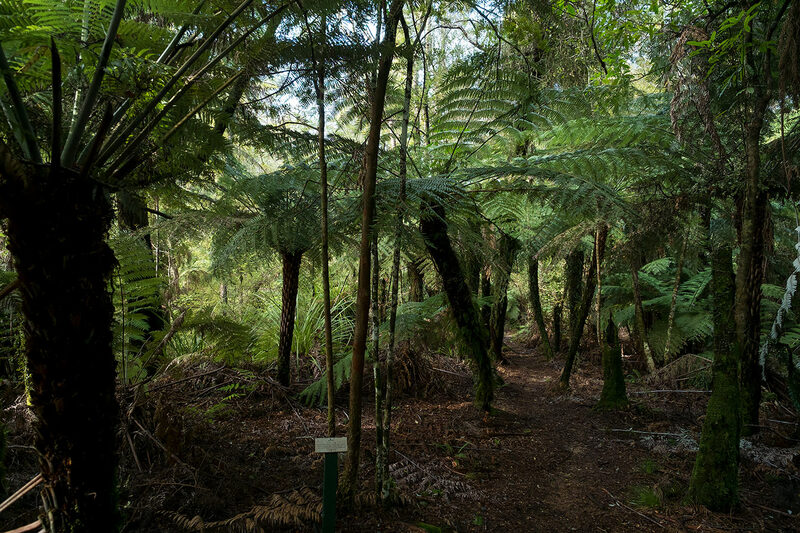 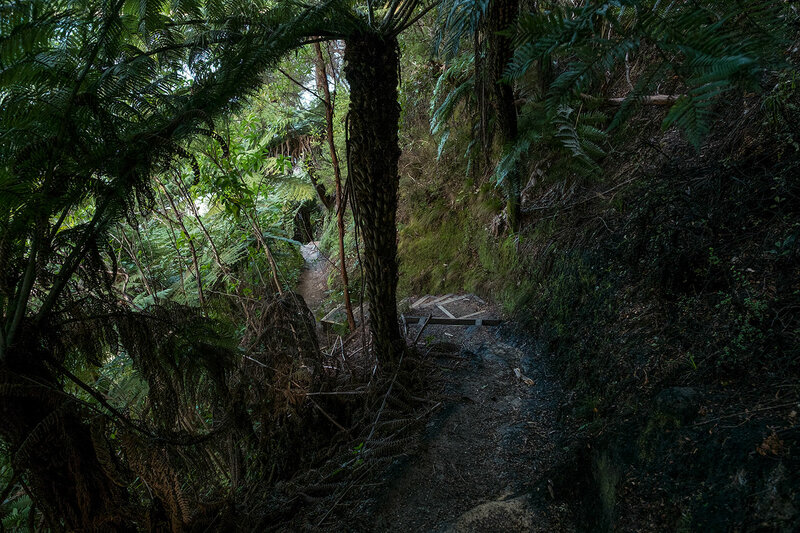 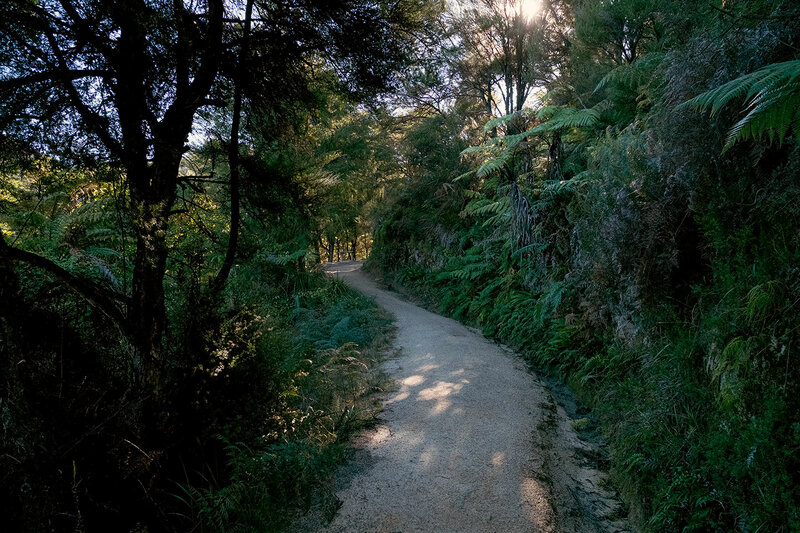 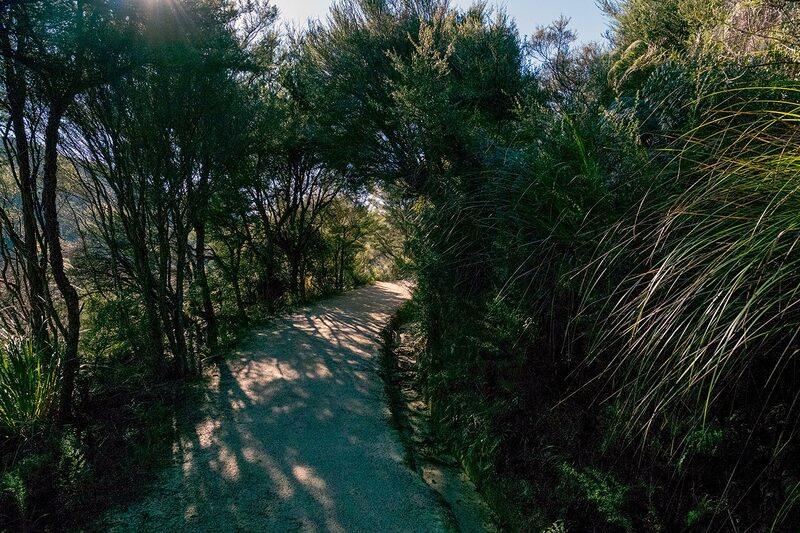 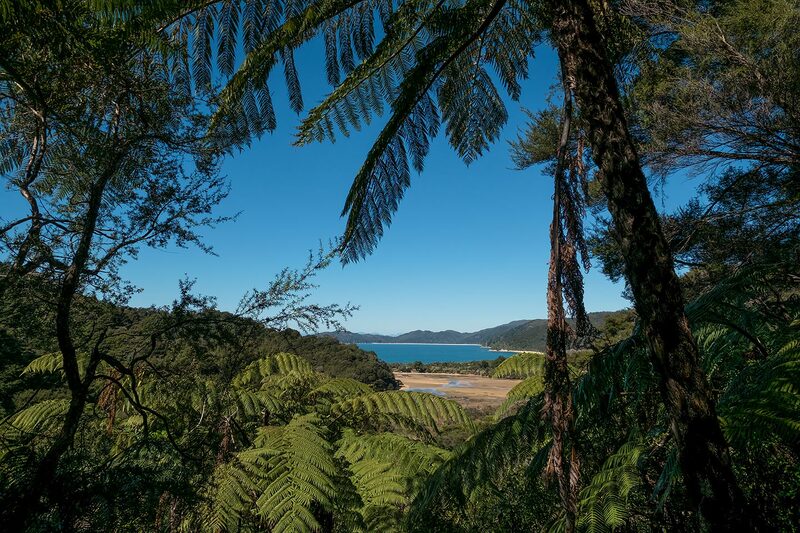 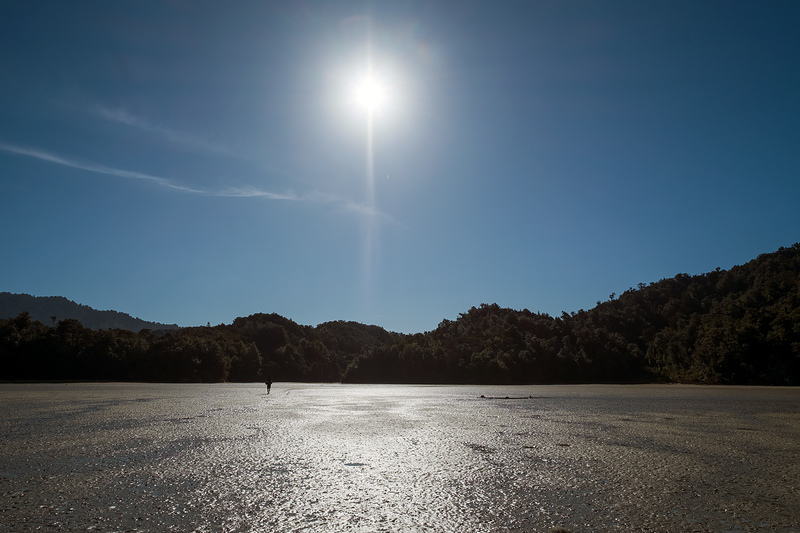 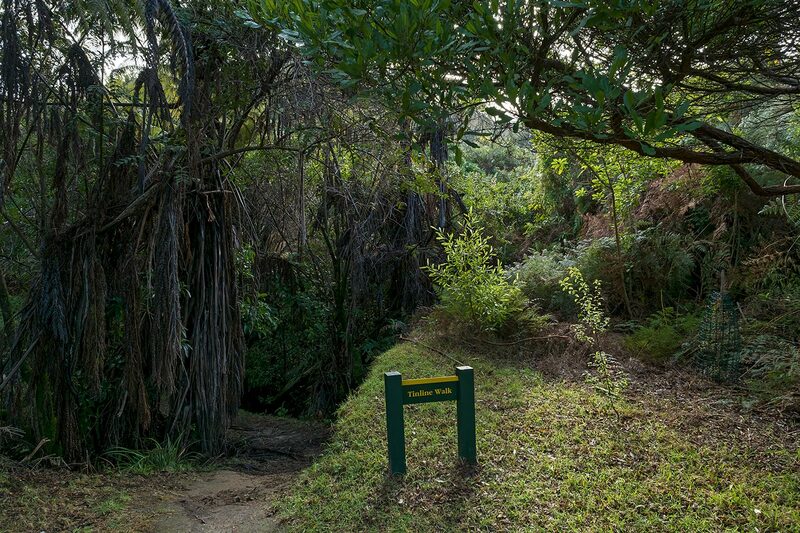 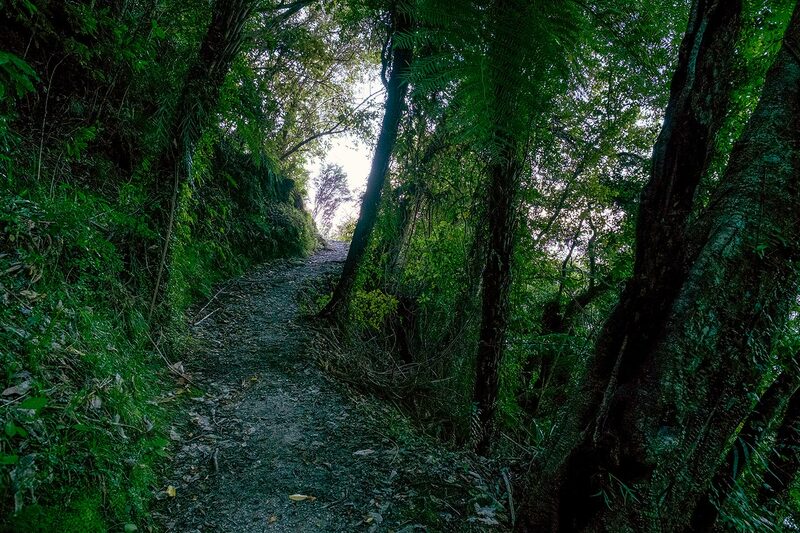 TINLINE NATURE WALK - a 20 minute loop track we can add onto our Abel Tasman experience. 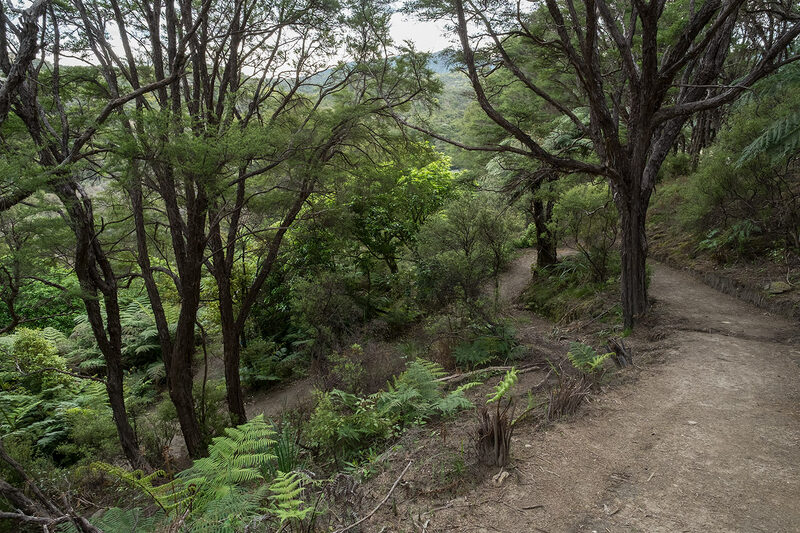 Looking back towards Marahau and the start of the track. 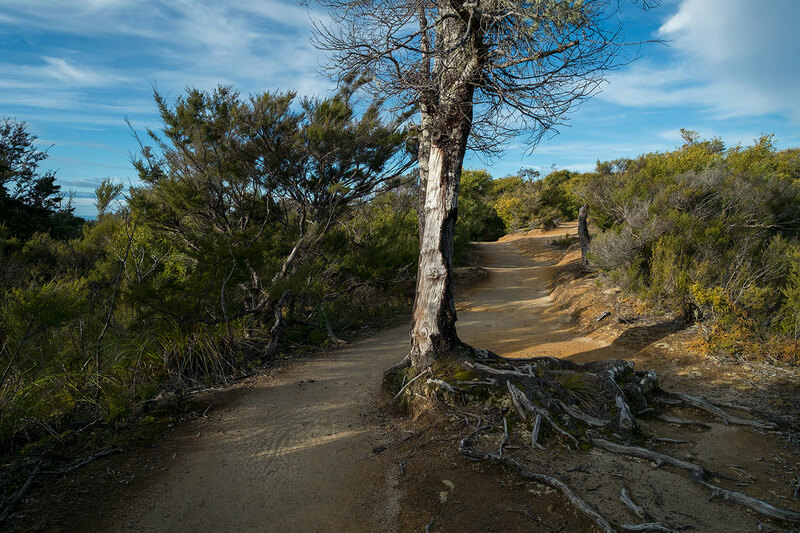 The turnoff for the Inland Track. 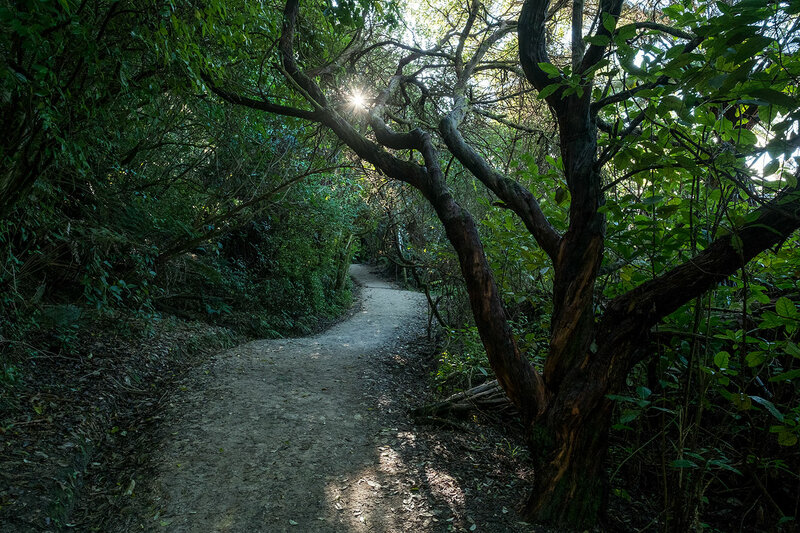 We carry on straight ahead. 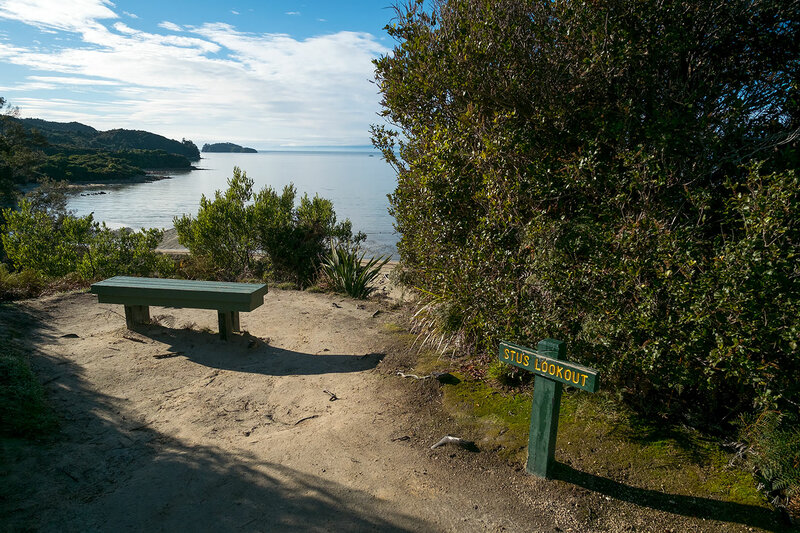 COQUILLE BAY - 6 non-powered tent sites. 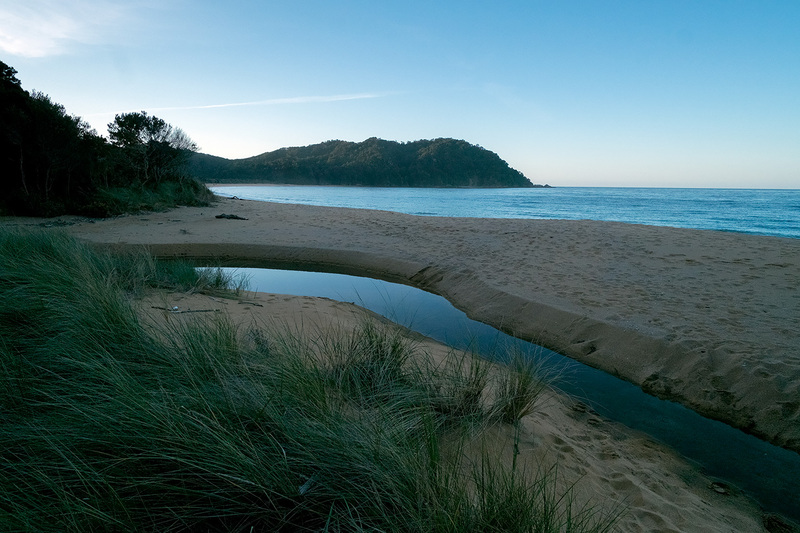 APPLE TREE BAY - 15 non-powered tent sites. 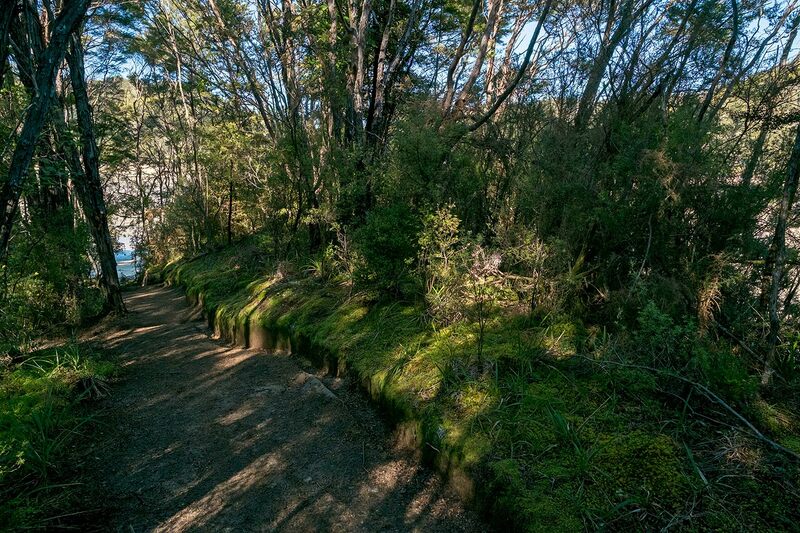 This small mossy waterfall next to the track marks the halfway point between Marahau and Anchorage. 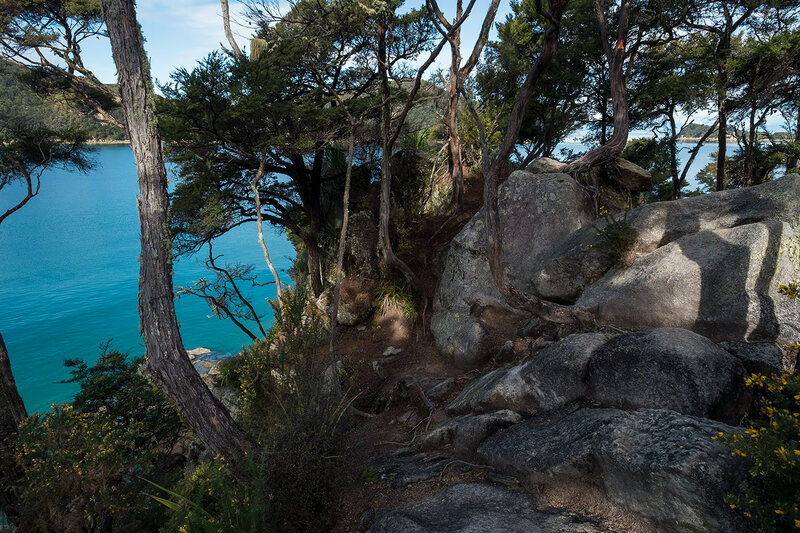 Looking back down on Stilwell Bay. 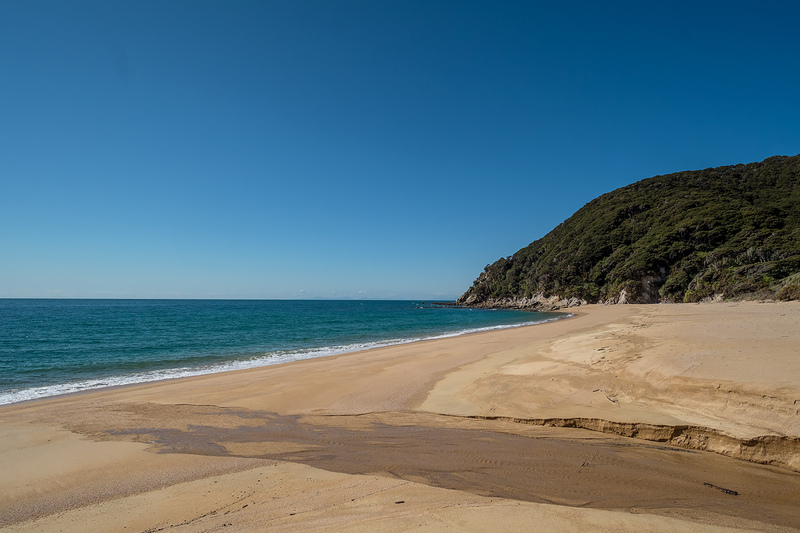 The side tracks to Yellow Point and Akersten Bay. 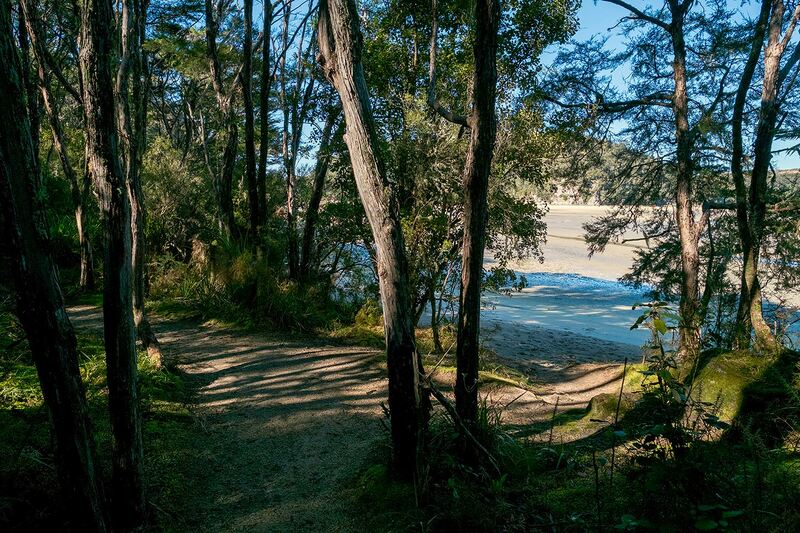 The 4 minute 220 metre walk to Yellow Point is pretty rough in places but it's beautiful. 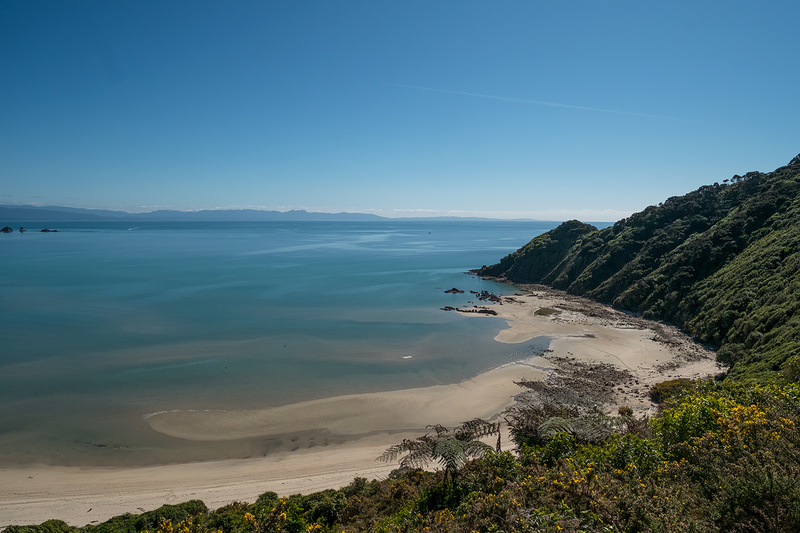 View from Yellow Point. 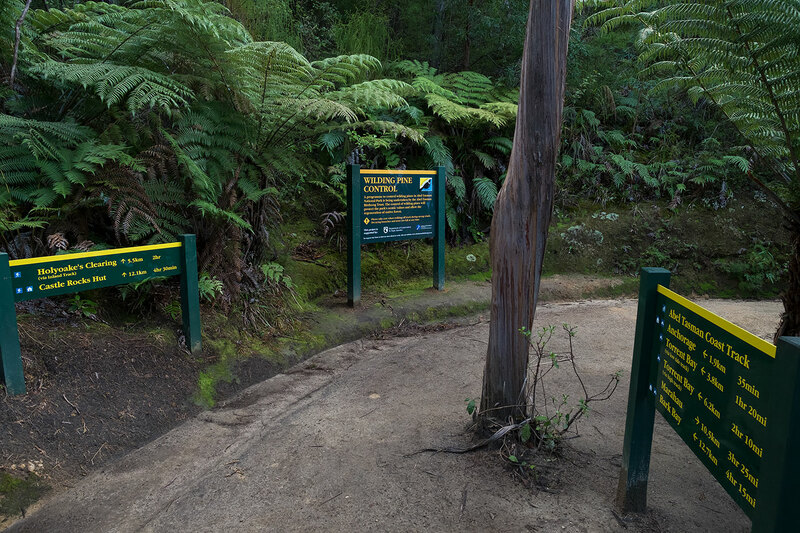 The track to this point is very uncivilised by Great Walk standards. 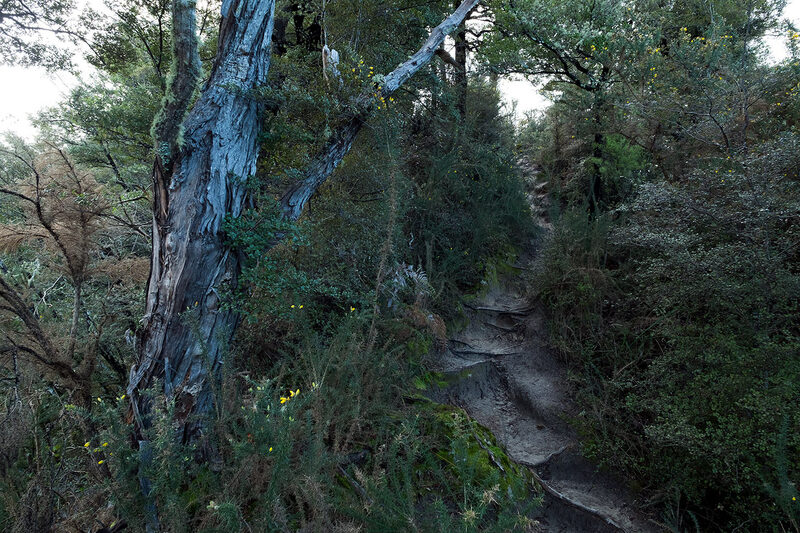 A steep descent brings us to Akersten Bay. 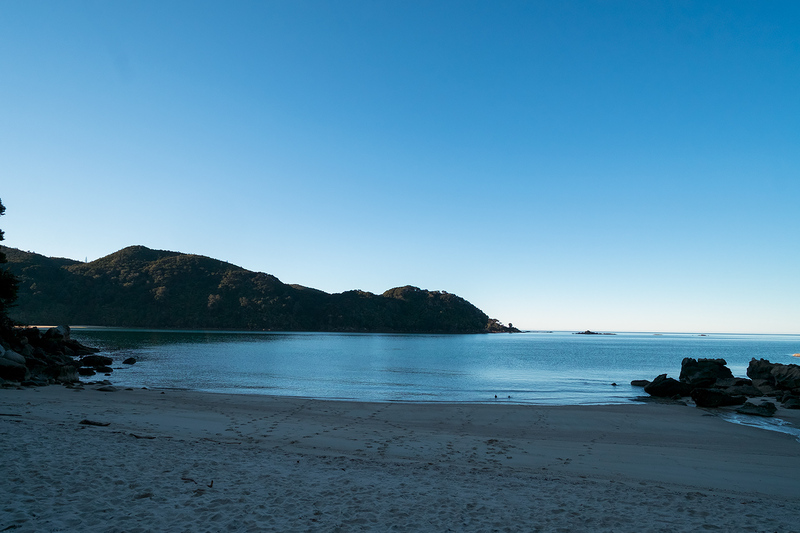 AKERSTEN BAY - 3 non-powered tent sites. 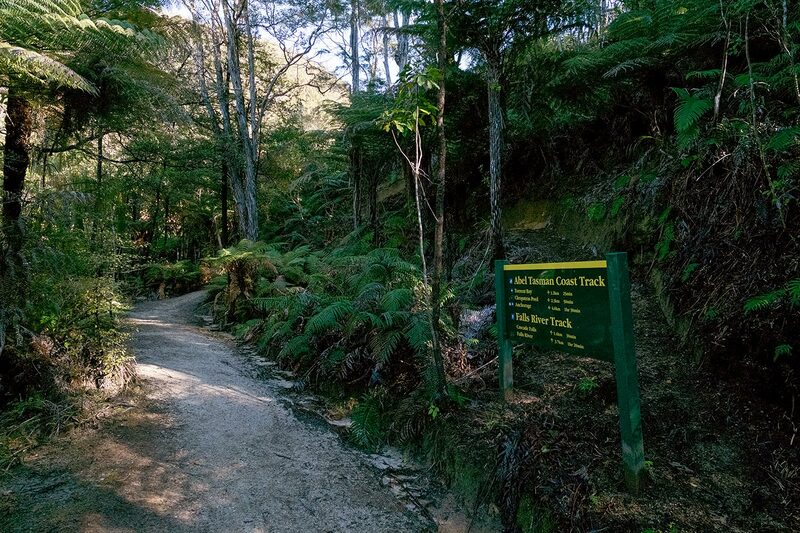 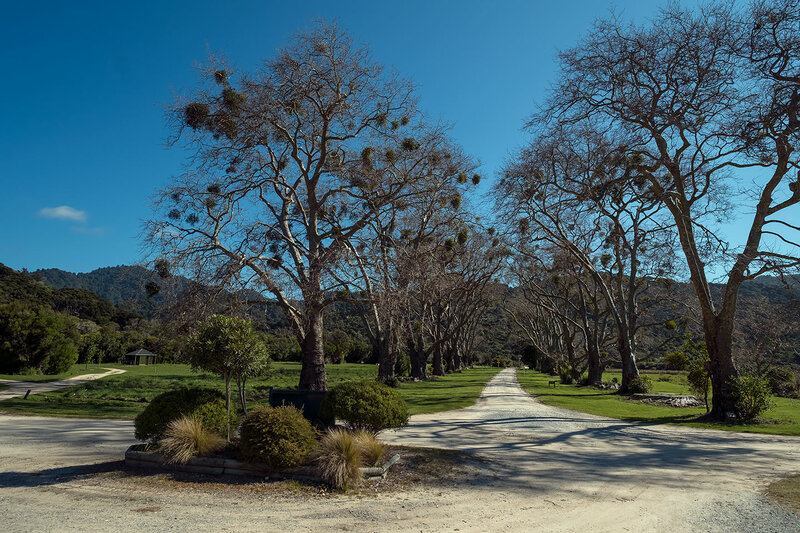 Another track leading to the Inland Track. 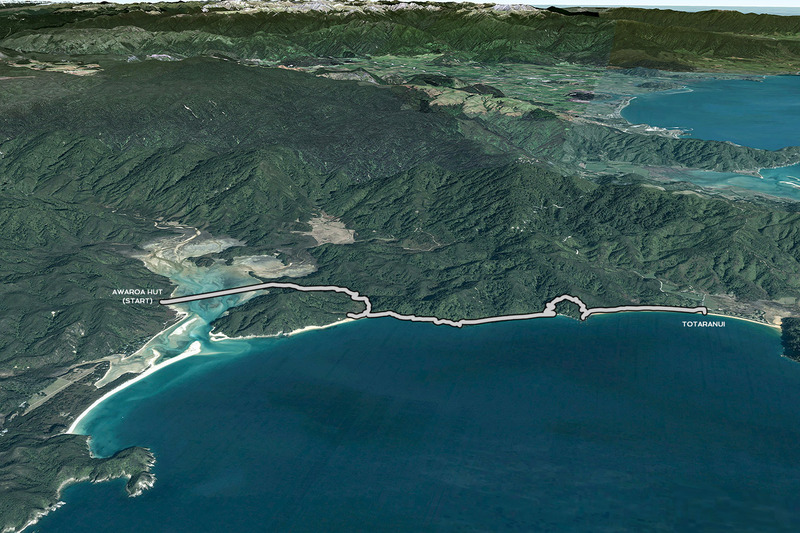 Here we take the turnoff to the right and head to Anchorage. 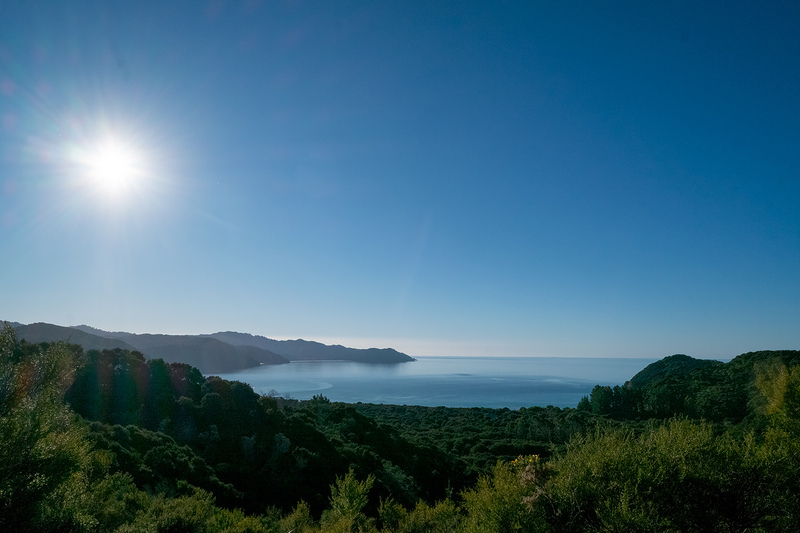 View over Astrolabe Roadstead. 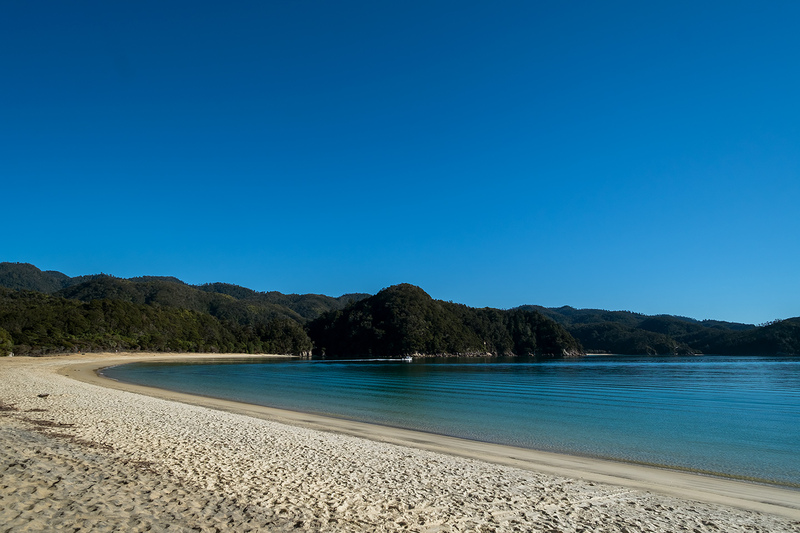 Adele Island (the big island) was named after Abel Tasman's wife. 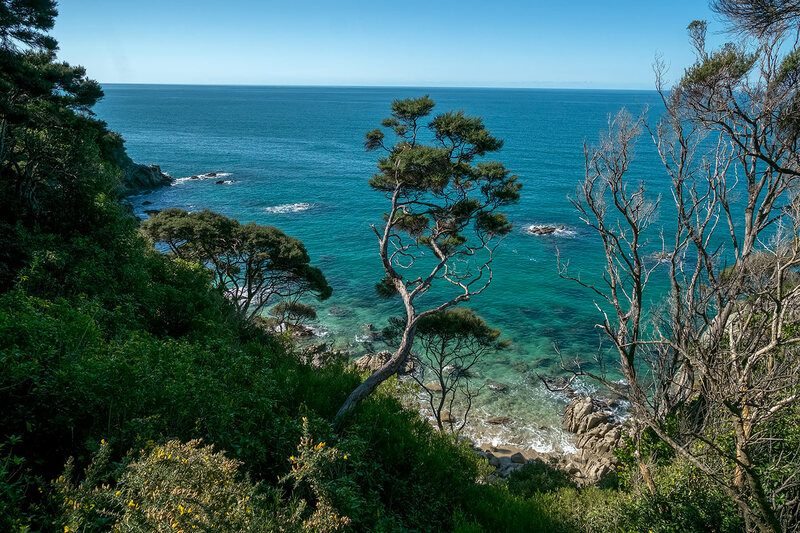 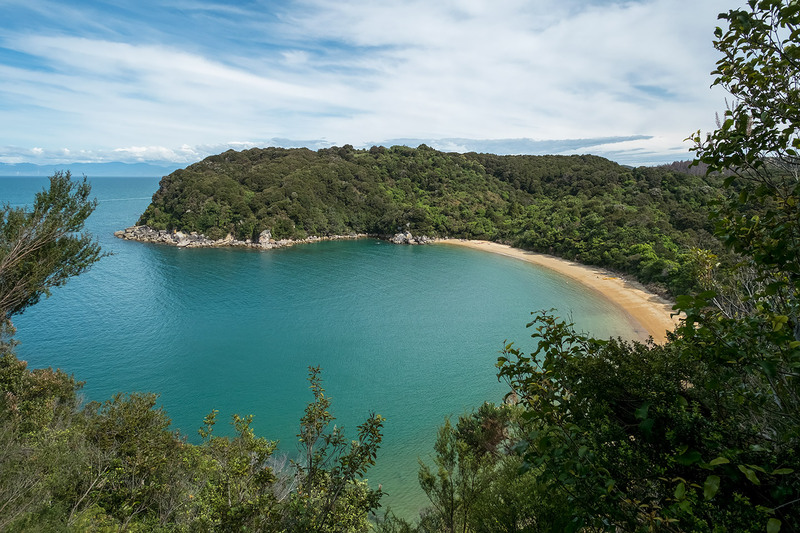 The tiny rocky outcrop on the lefthand end of the island is Abel Point - the only landform in the Abel Tasman National Park that is actually named after Abel Tasman. 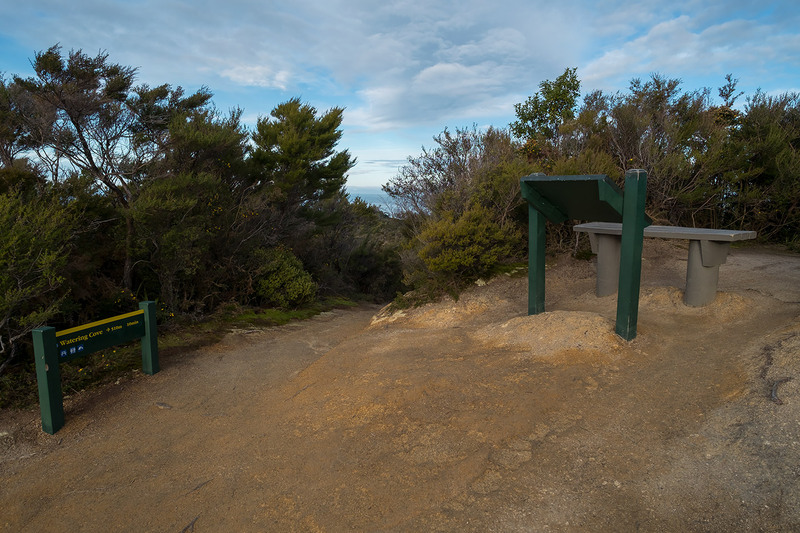 Seat and interpretative panels by the turnoff to Watering Cove. 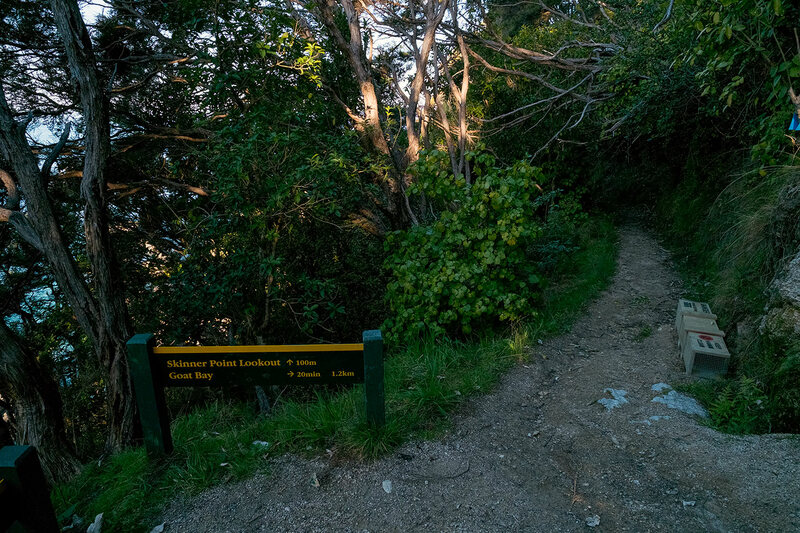 The descent to Watering Cove is fairly easy 10 minutes 510 metres each way. 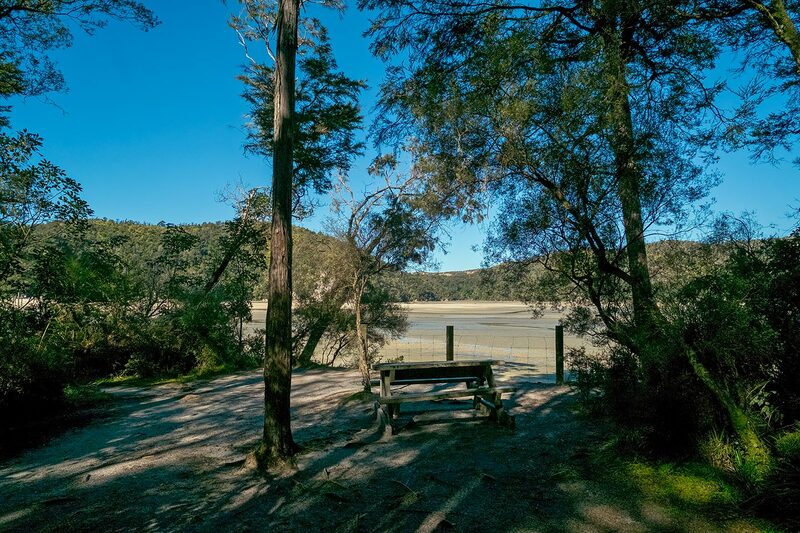 WATERING COVE CAMPSITE - 5 non-powered tent sites. 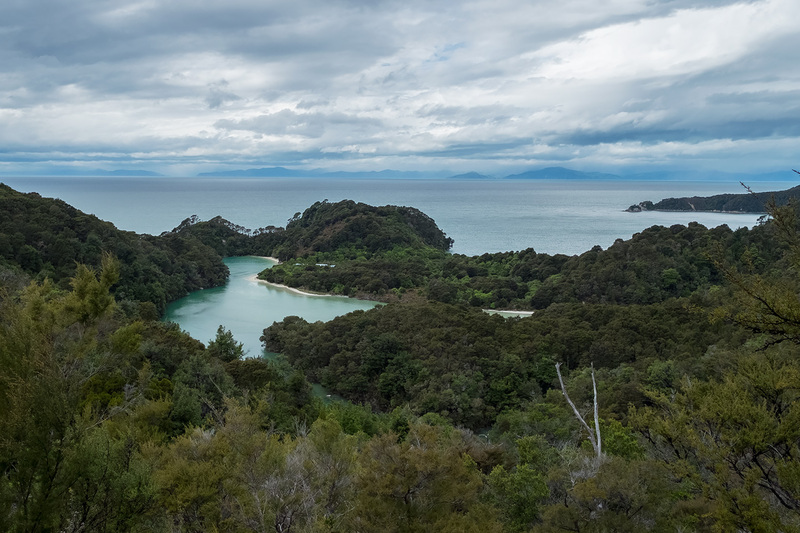 As the track descends to Anchorage, we get this stunning view over Torrent Bay. 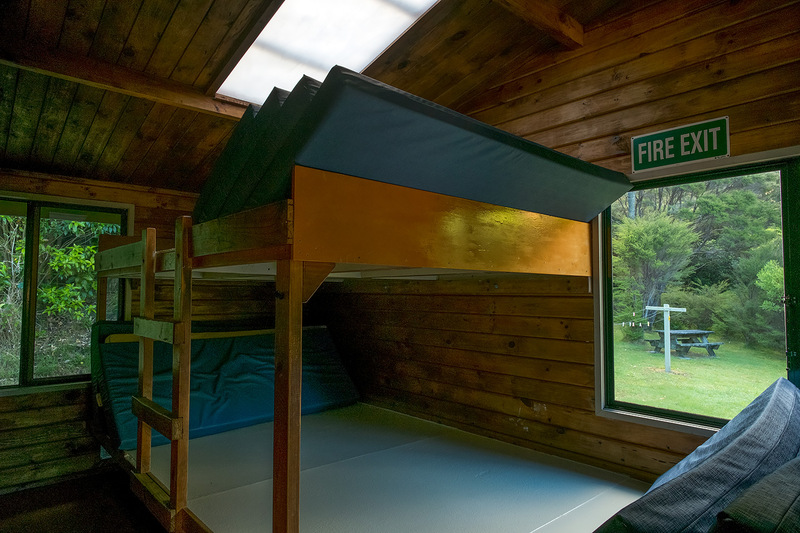 ANCHORAGE HUT - 34 bunk beds, lighting, Woodburner for heating Kitchen / Dining Room. 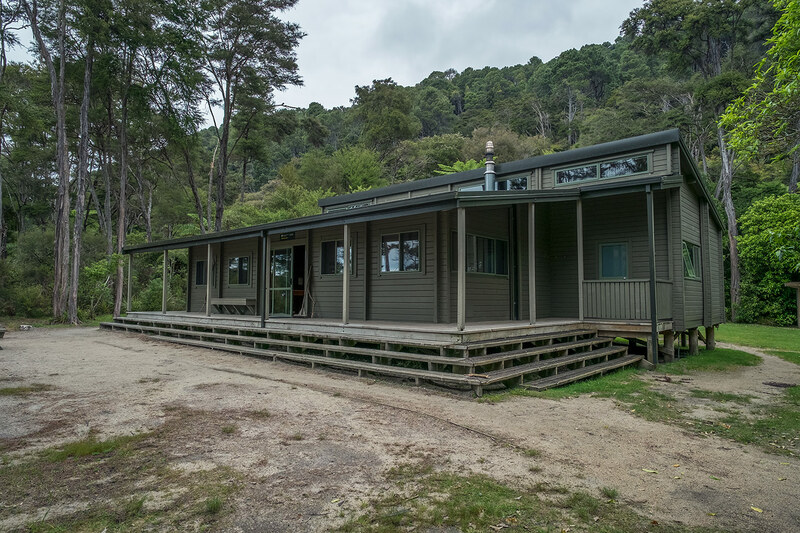 ANCHORAGE HUT - Deck outside Kitchen / Dining Room and Bunkrooms. 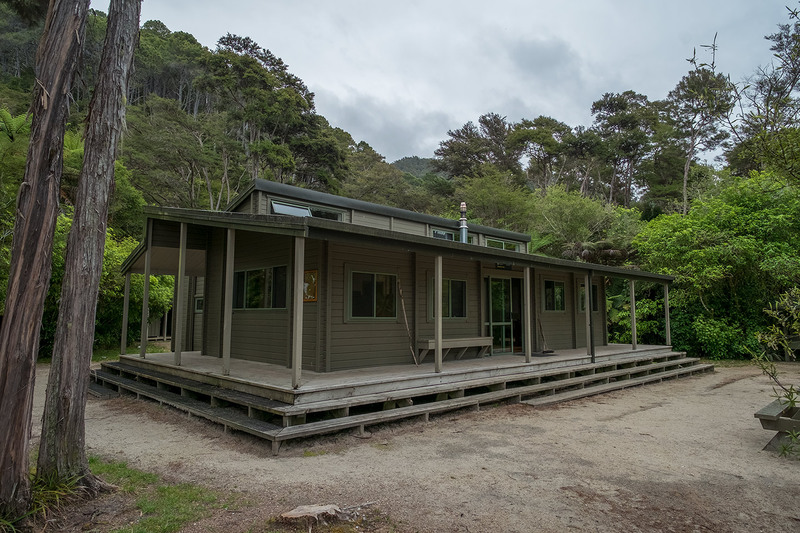 ANCHORAGE HUT - Kitchen / Dining Room. 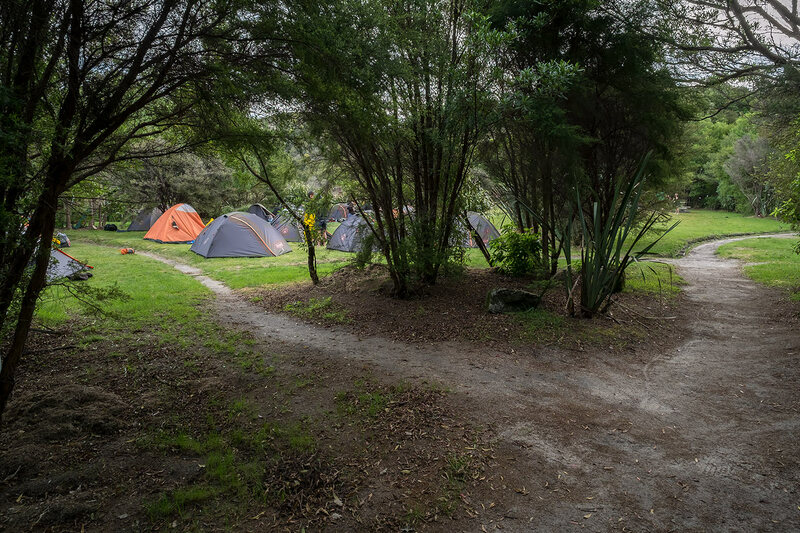 ANCHORAGE CAMPSITE - 50 non-powered tent sites. 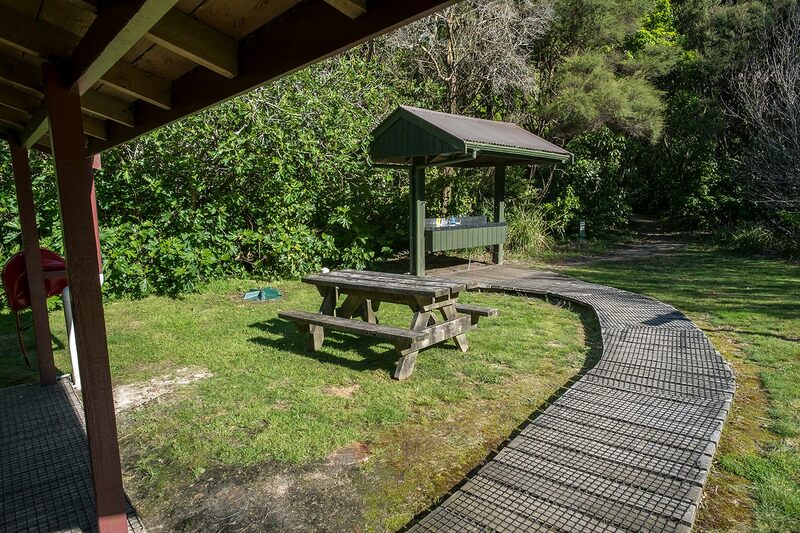 ANCHORAGE CAMPSITE - Cooking Shelter. 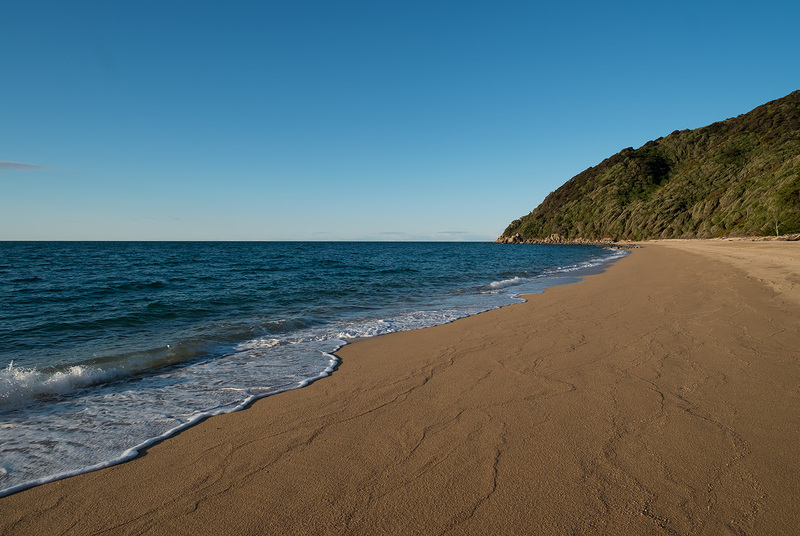 TE PUKATEA BAY - An easy 1 hour 30 minutes 4 km loop walk from Anchorage brings us to this gorgeous crescent-shaped beach. 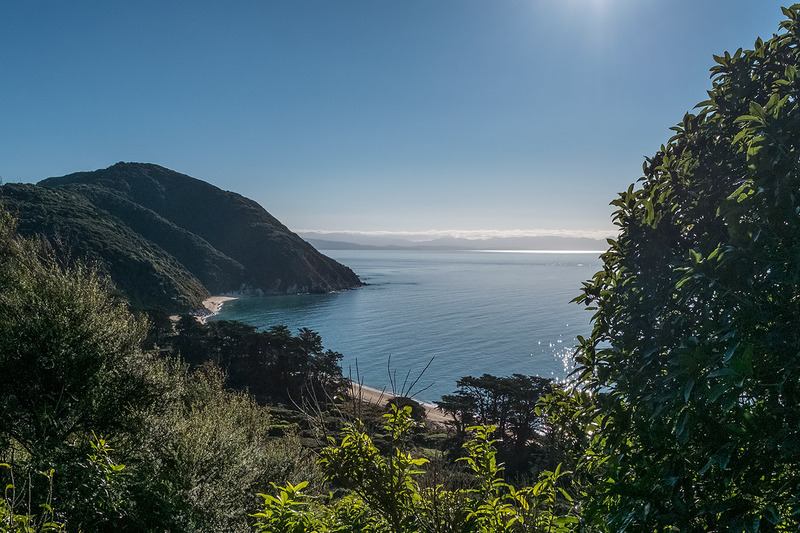 Looking back down on Te Pukatea Bay. 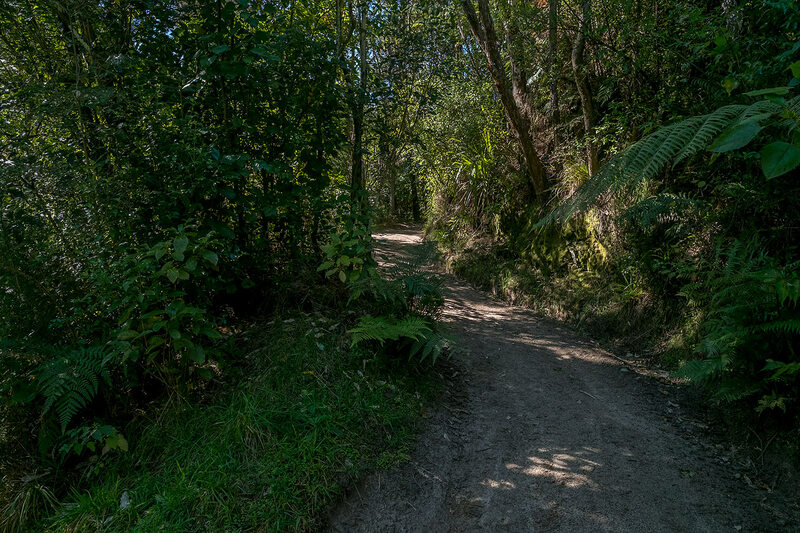 Now we follow the track up to Pitt Head. 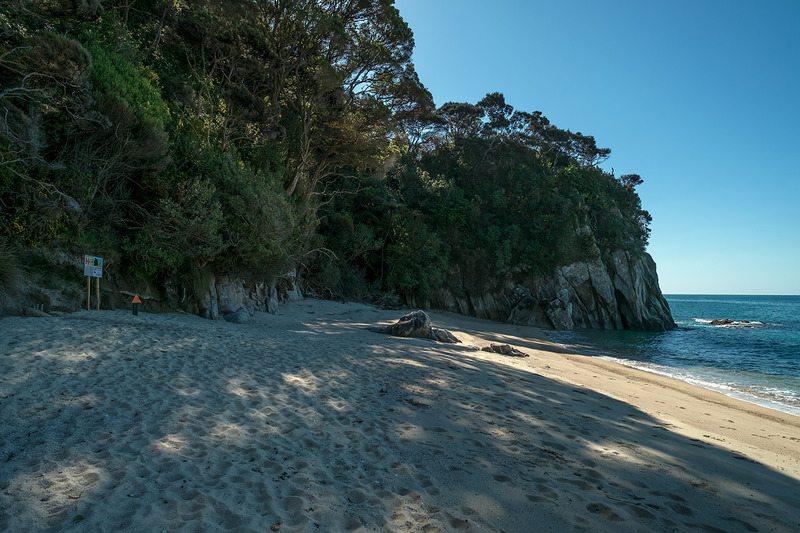 PITT HEAD - Now we head back to Anchorage. 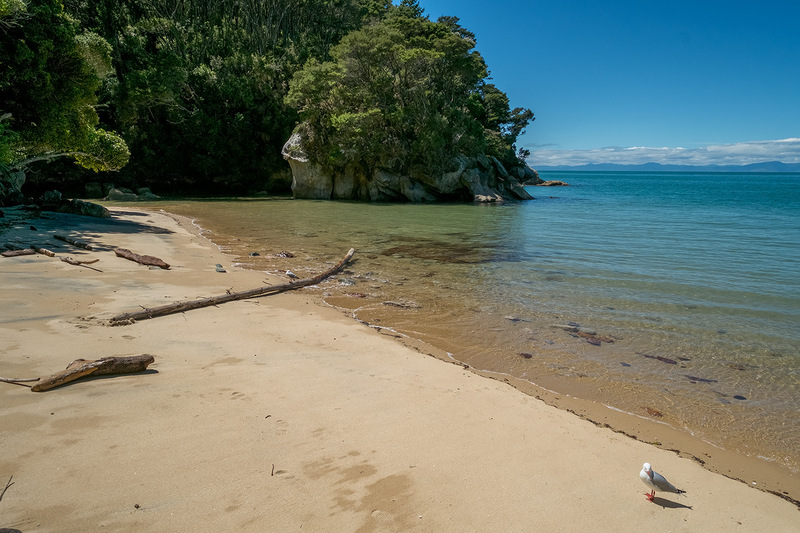 ANCHORAGE TO BARK BAY - Torrent Bay estuary can be crossed within 2 hours either side of low tide, or we can take the all-tide track around it. 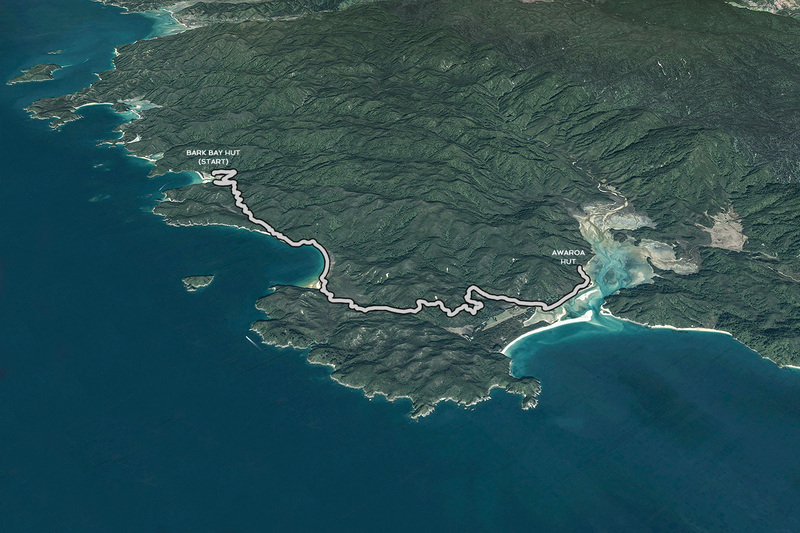 Anchorage to Bark Bay via All-Tide Track: 4 hours, 11.5 km. 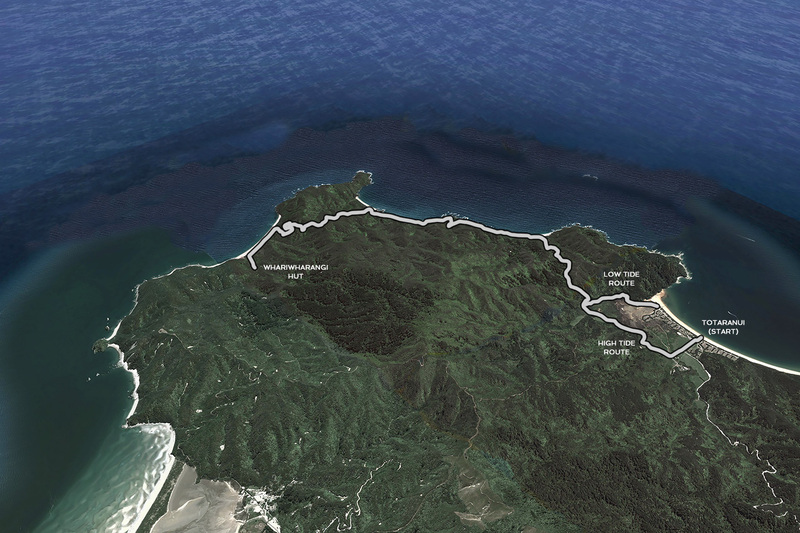 Via Low Tide Track: 3 hours, 8.4 km. 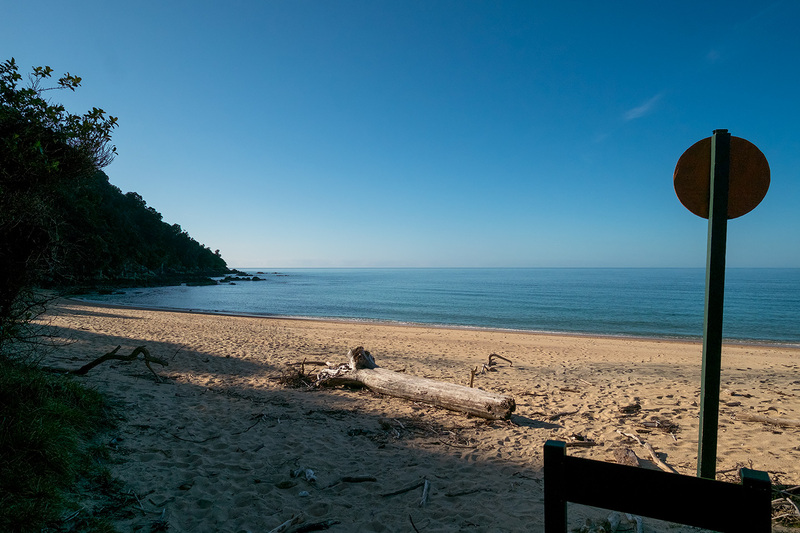 ANCHORAGE TO BARK BAY - Anchorage Beach. 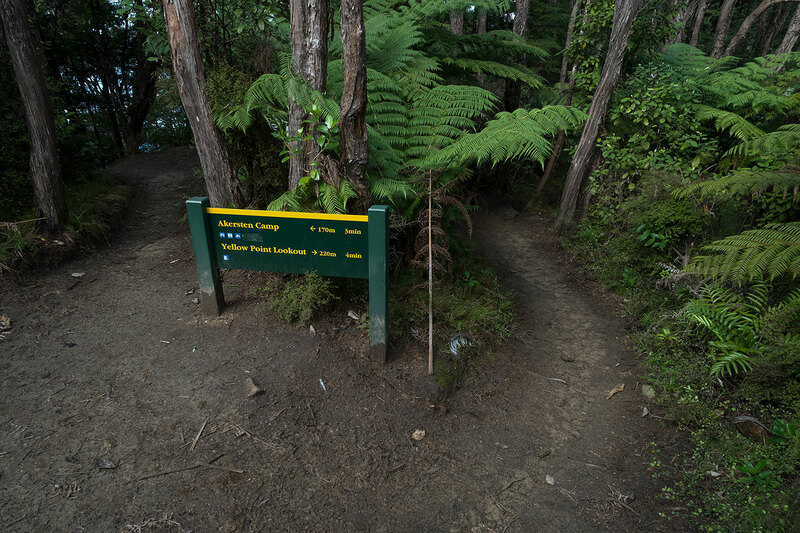 ANCHORAGE TO BARK BAY - The track climbs to this low saddle and here we have a decision to make. 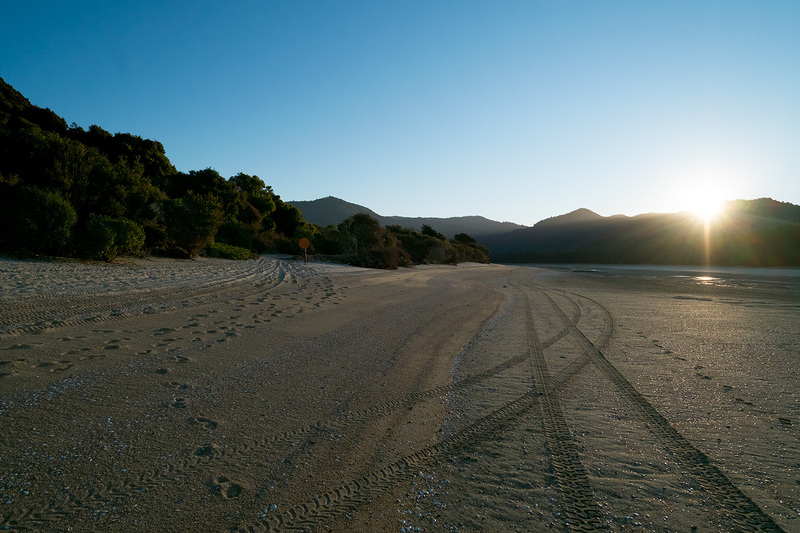 Low Tide track or All-Tide Track? 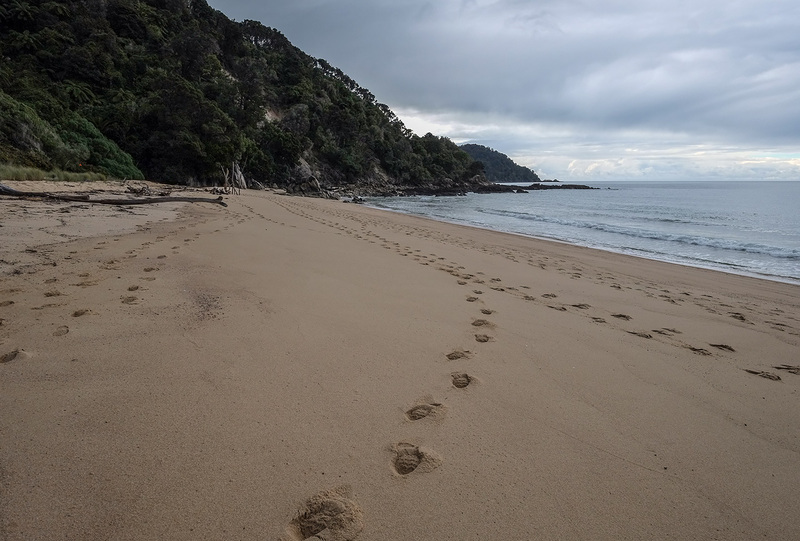 The All-Tide track is nice and we can go to Cleopatra's Pool on the way - and the Low Tide Track is much easier and takes an hour less. 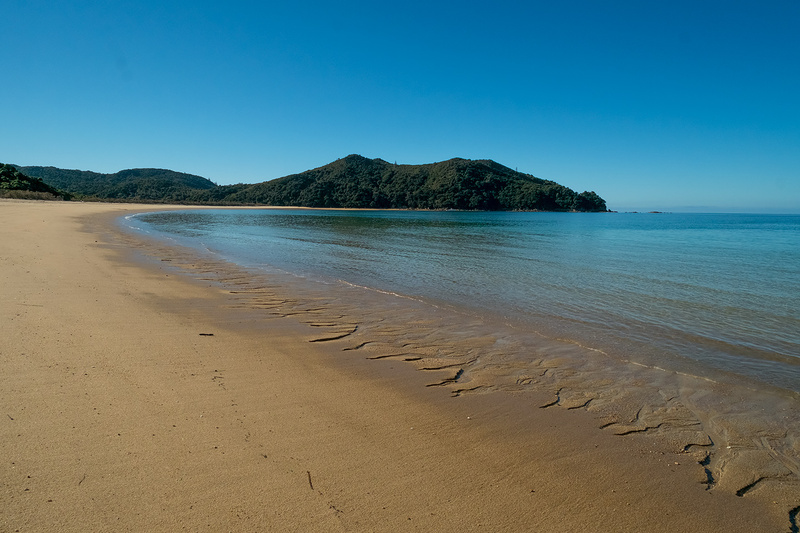 It also depends on tide. 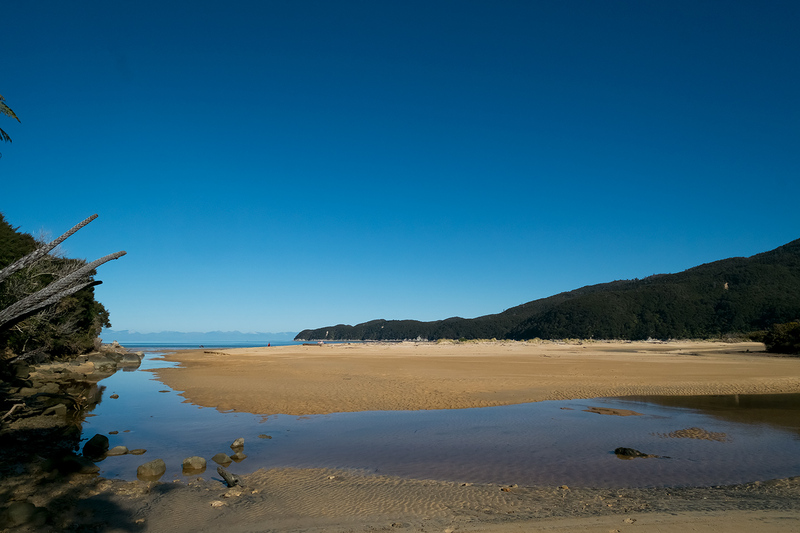 We can only use the Low Tide Track within 2 hours either side of low tide. 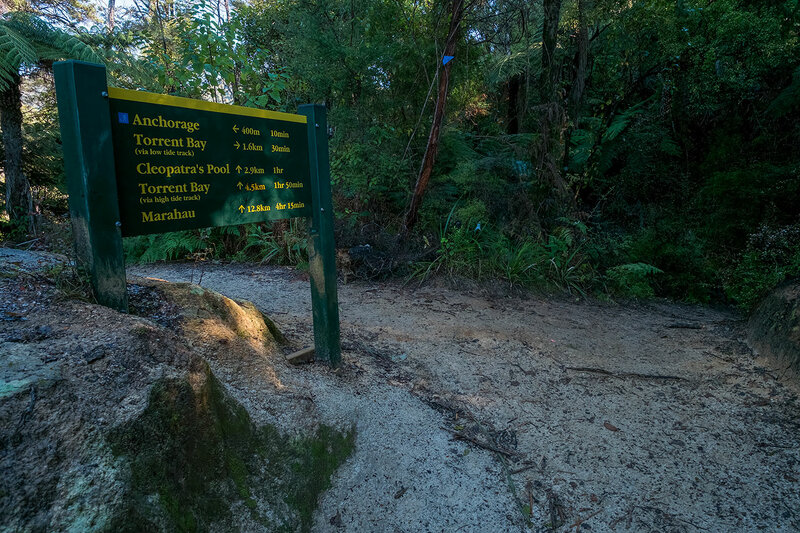 ANCHORAGE TO BARK BAY - All-Tide Track. 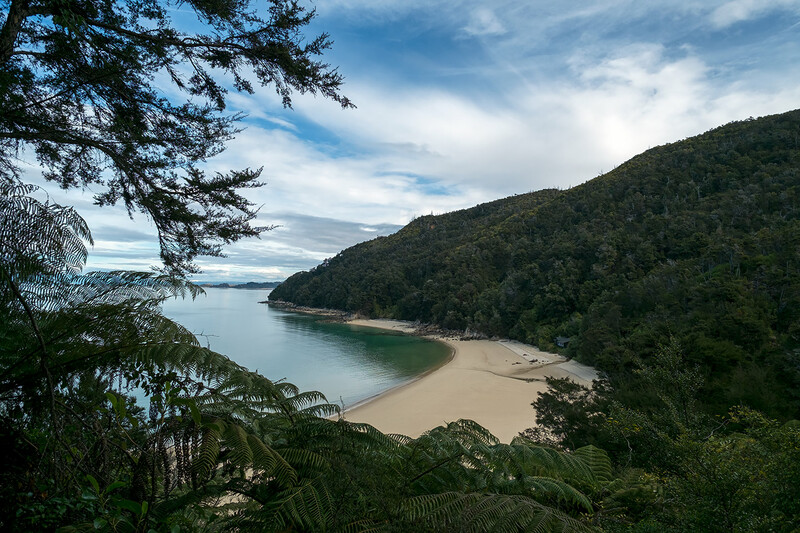 ANCHORAGE TO BARK BAY - All-Tide Track. 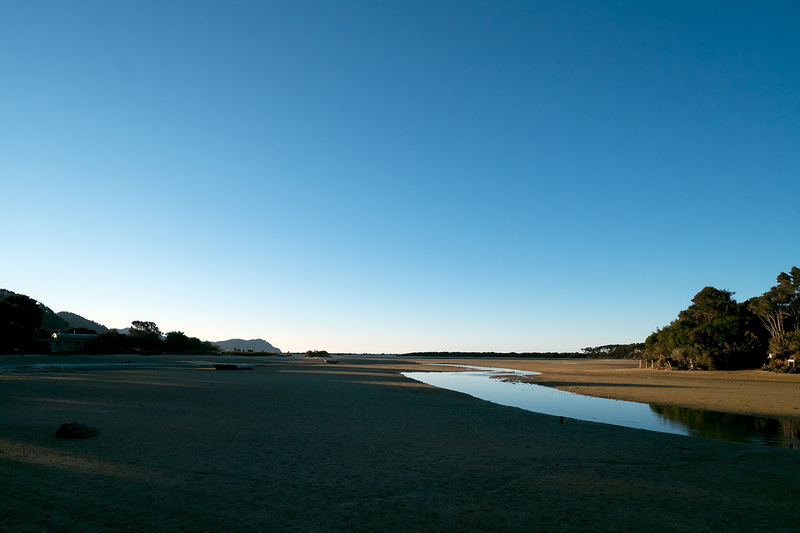 View over Torrent Lagoon at Low Tide. 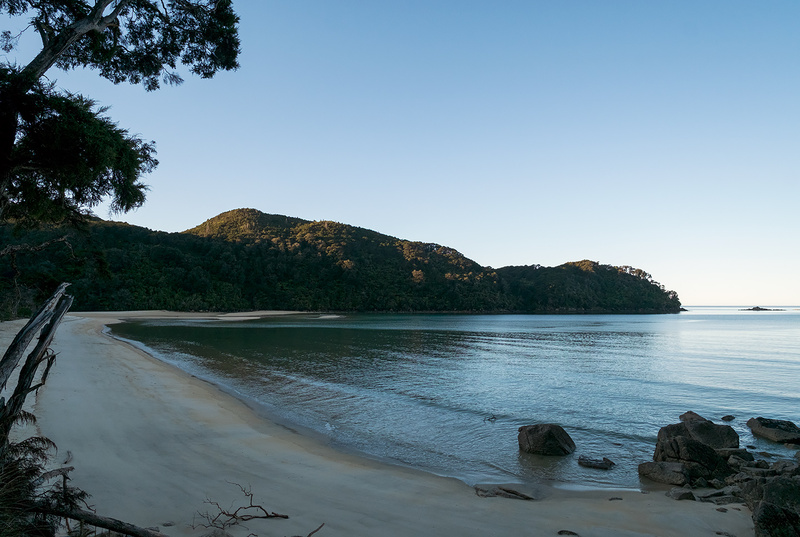 ANCHORAGE TO BARK BAY - All-Tide Track. 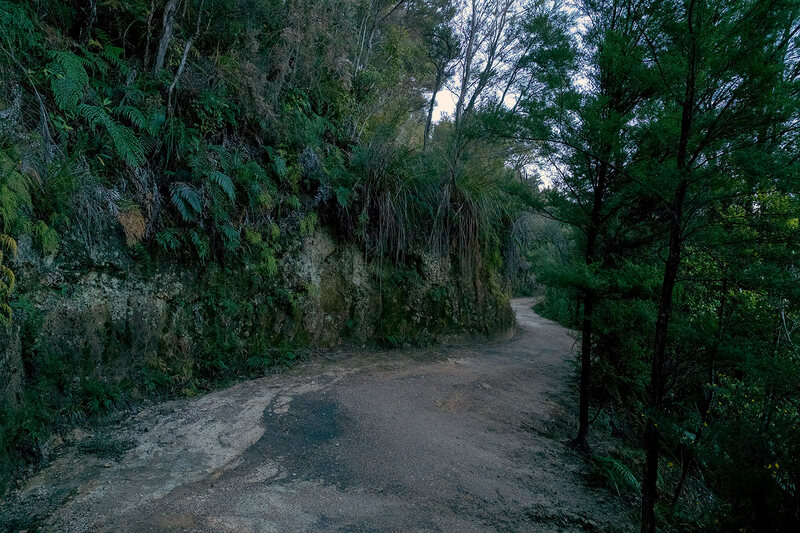 The side track to the left heads to the Inland Track. 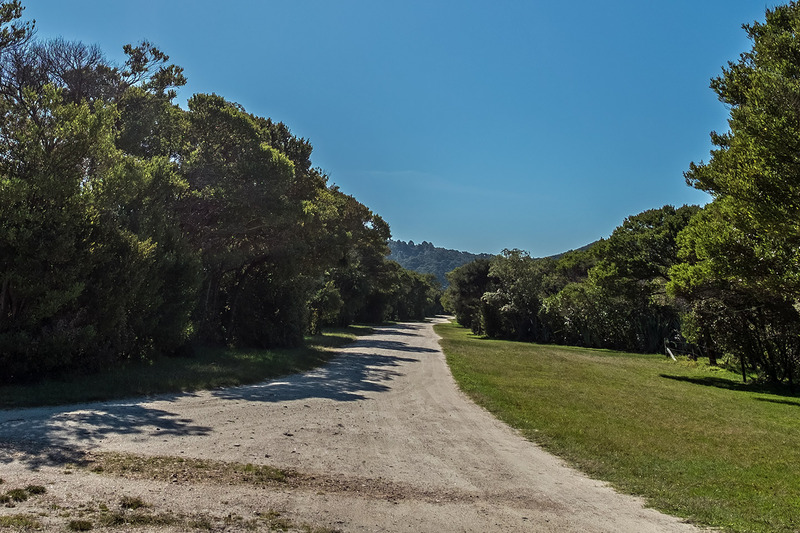 We continue on straight ahead. 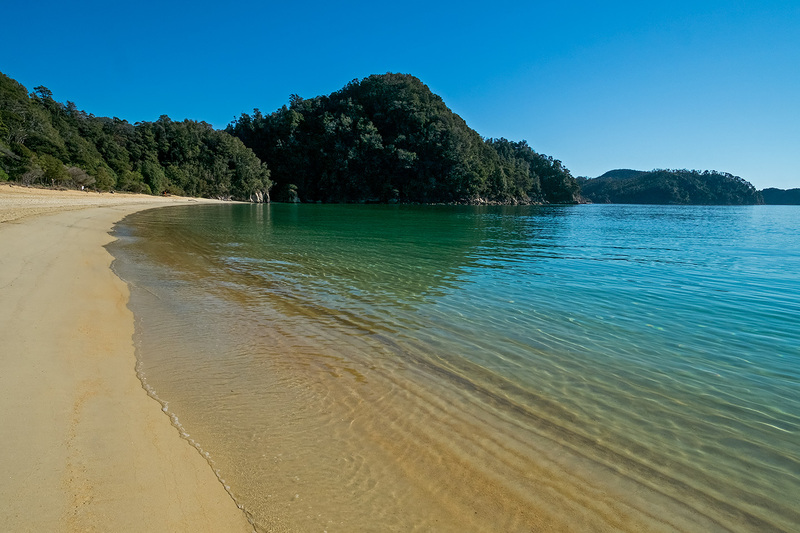 ANCHORAGE TO BARK BAY - Cleopatra's Pool. 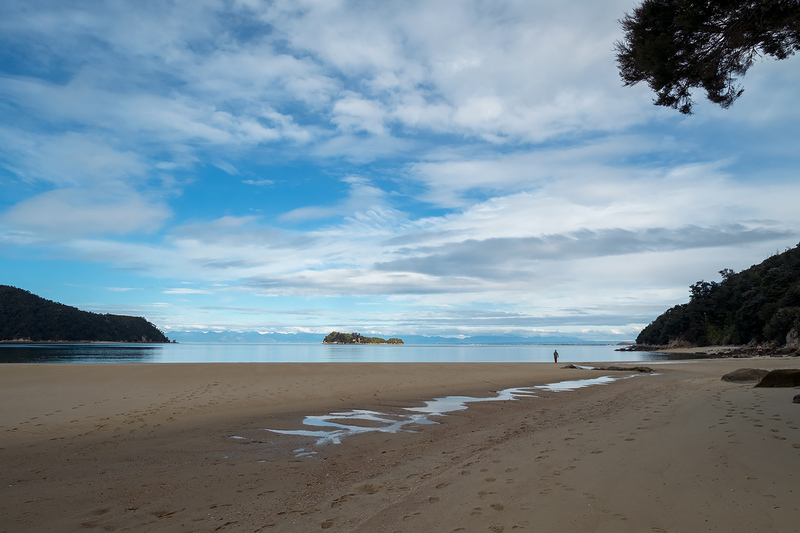 ANCHORAGE TO BARK BAY - All-Tide Track. 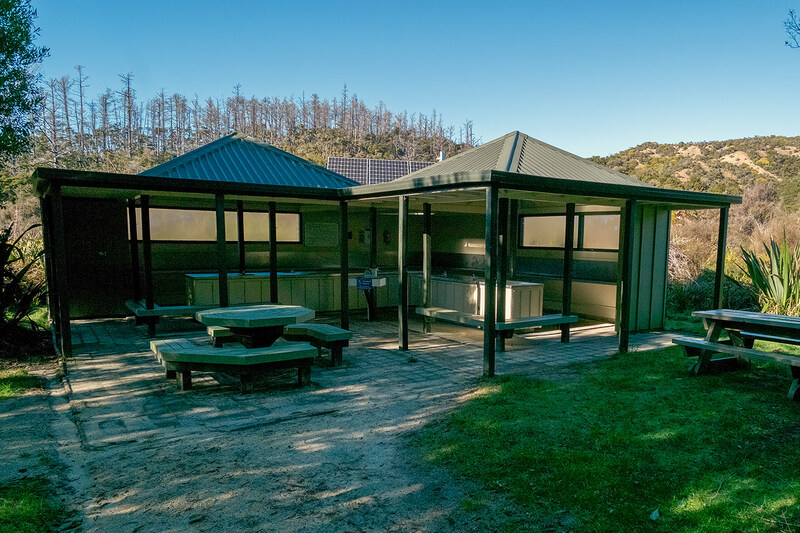 Picnic area on site of the now-removed Torrent Bay Hut. 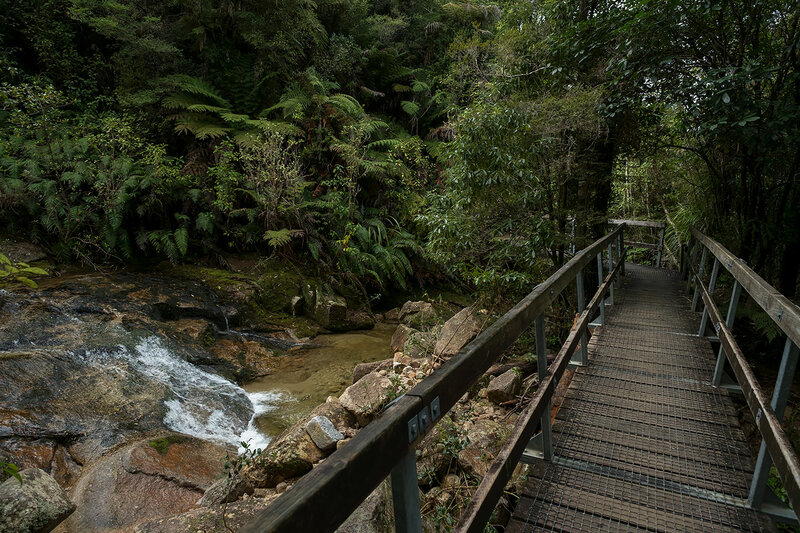 ANCHORAGE TO BARK BAY - Falls River Track. 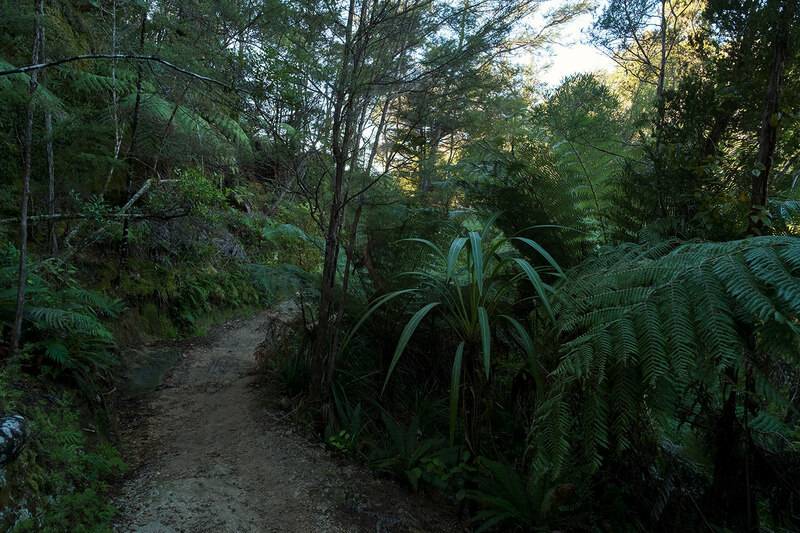 Now the track heads down hill quite steeply to Torrent Bay. 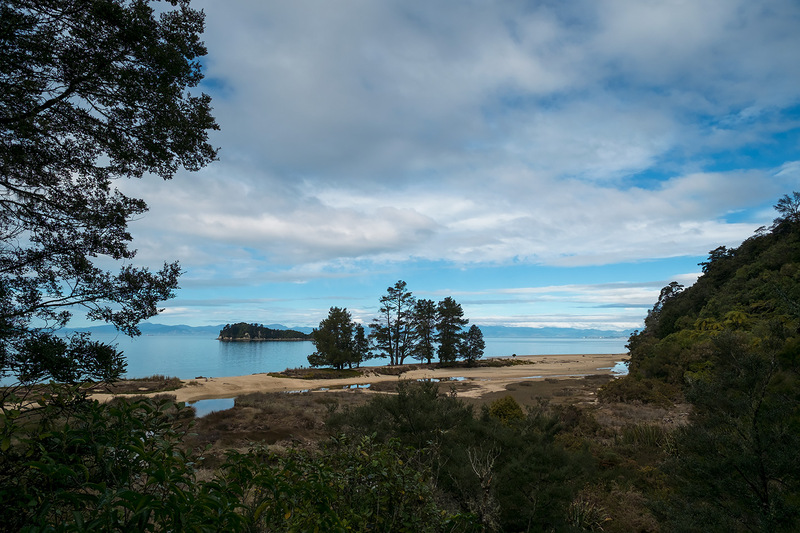 ANCHORAGE TO BARK BAY - Torrent Bay. 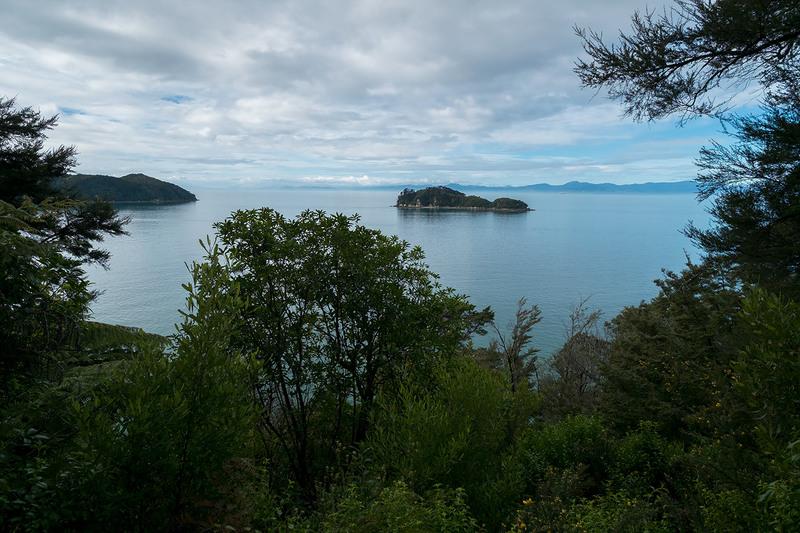 ANCHORAGE TO BARK BAY - TORRENT BAY CAMPSITE - 10 nonpowered tent sites. 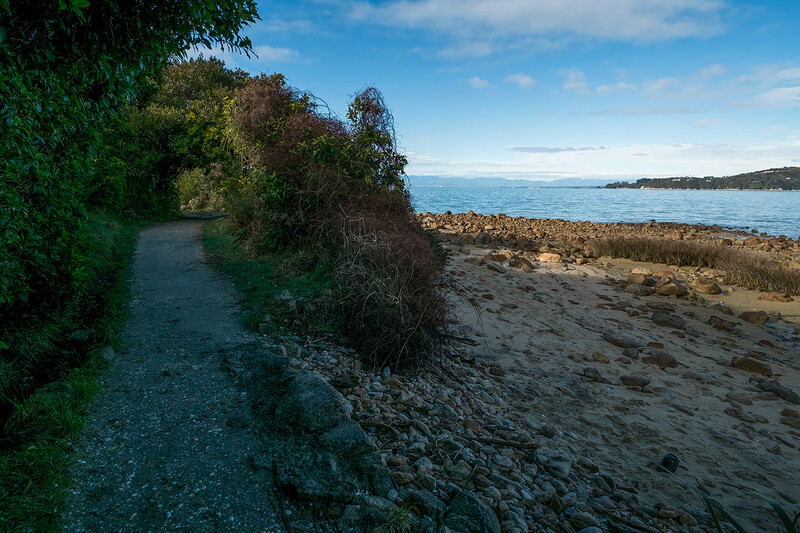 ANCHORAGE TO BARK BAY - End of the Low Tide Track. 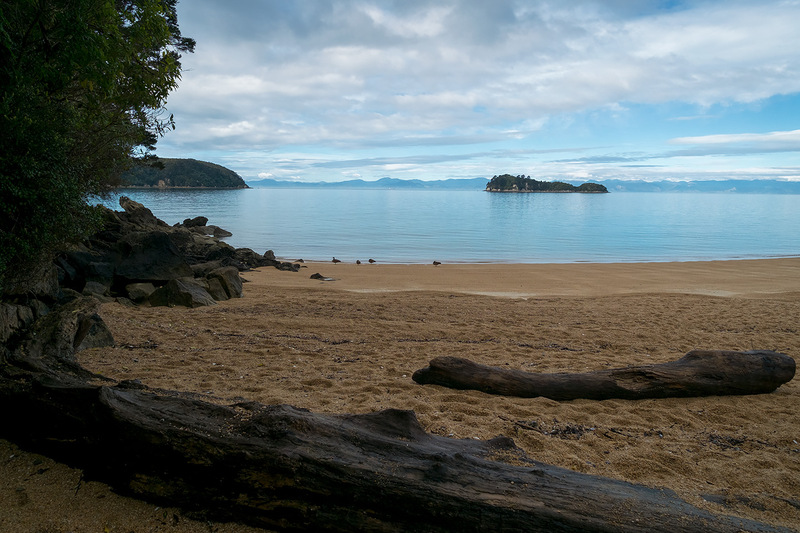 ANCHORAGE TO BARK BAY - Torrent Bay beach. 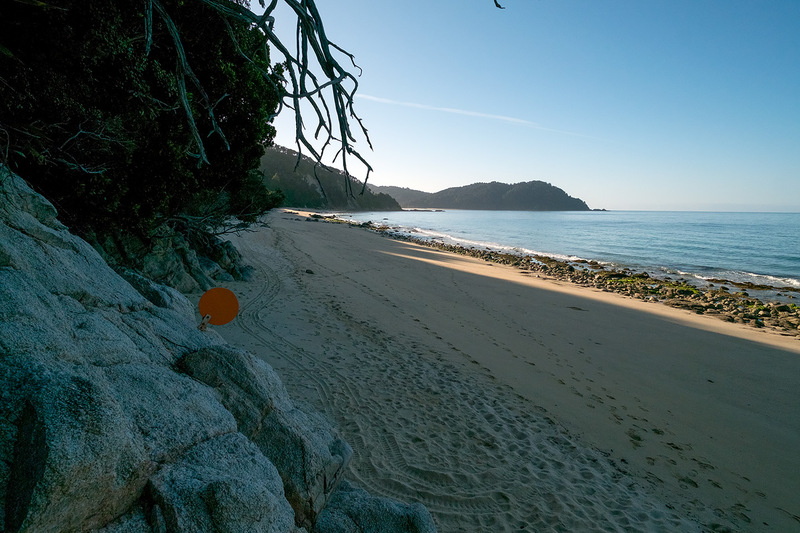 That tiny island is Ballon Rock. 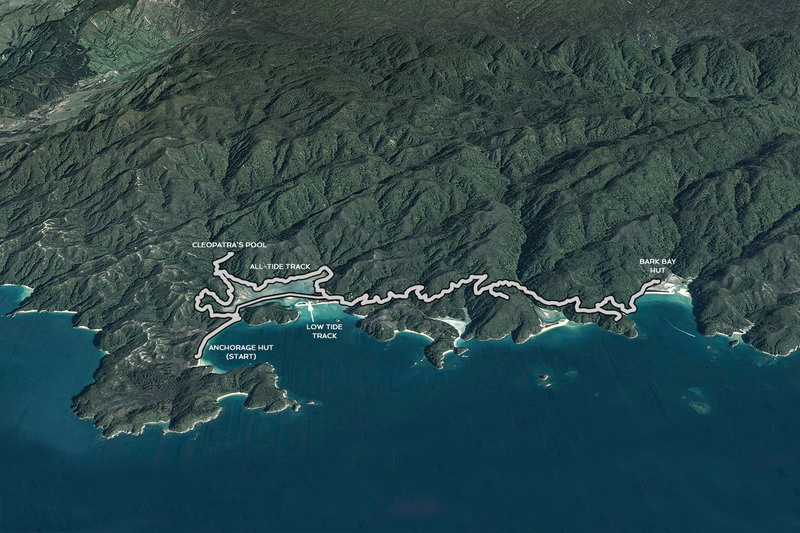 ANCHORAGE TO BARK BAY - Now the track climbs steeply. 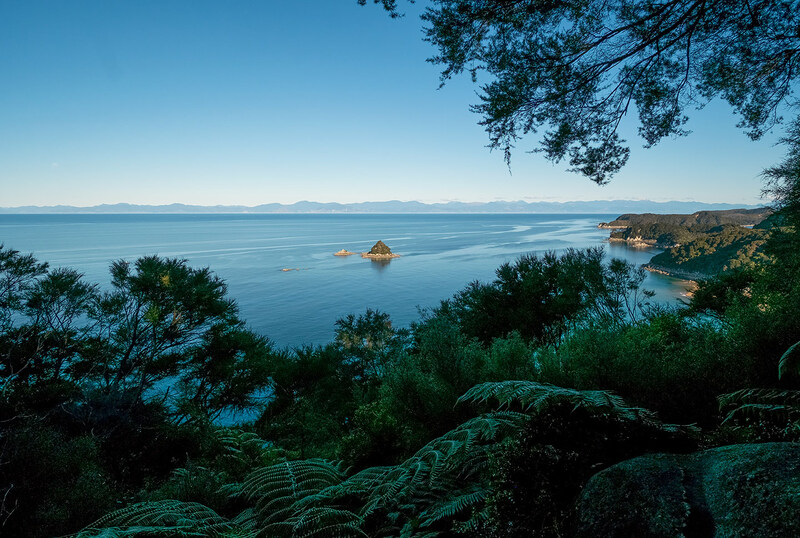 Near the top, we are rewarded with this view over the small village of holiday homes at Torrent Bay. 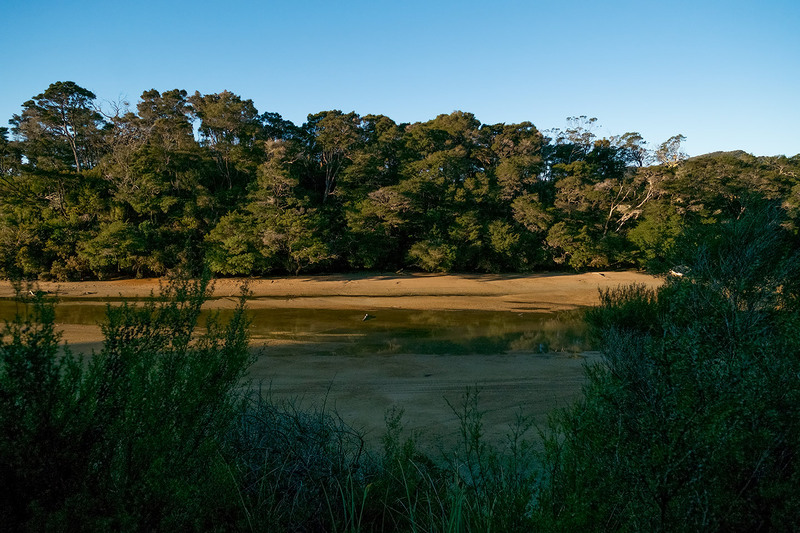 ANCHORAGE TO BARK BAY - Halfway Pool. 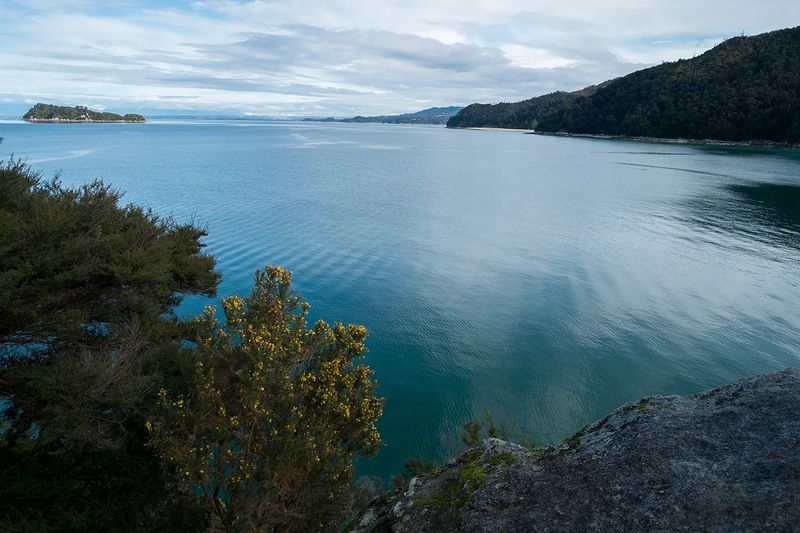 ANCHORAGE TO BARK BAY - View over Frenchman Bay. 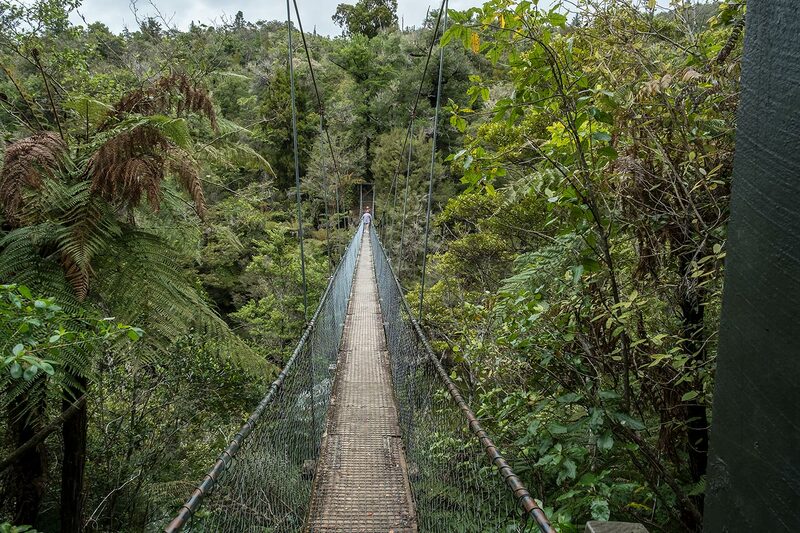 ANCHORAGE TO BARK BAY - The 47 metre high suspension bridge over Falls River. 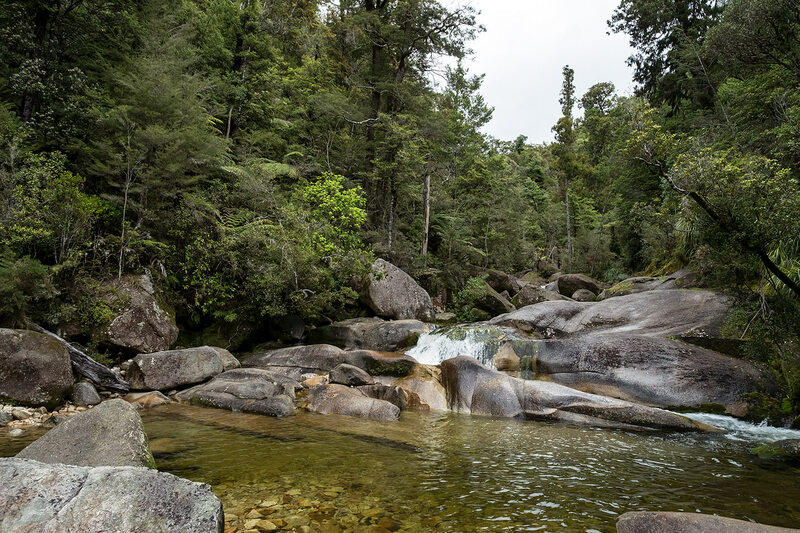 ANCHORAGE TO BARK BAY - View of waterfall upstream from Falls River suspension bridge. 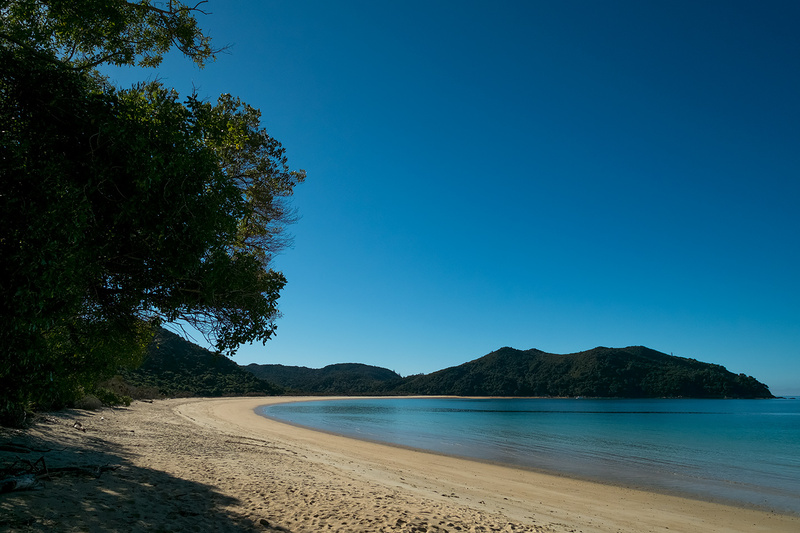 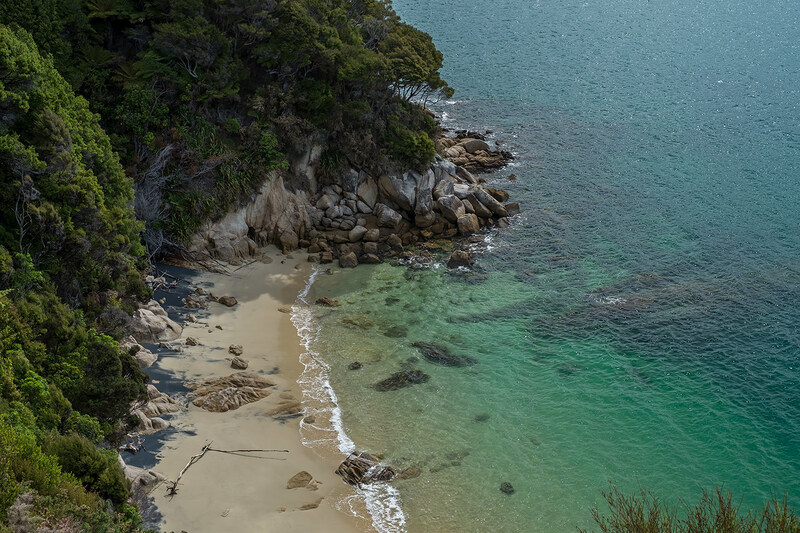 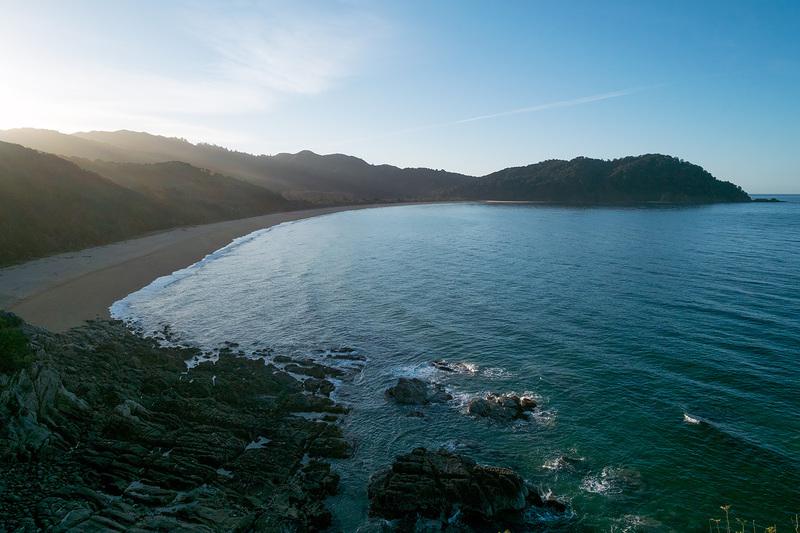 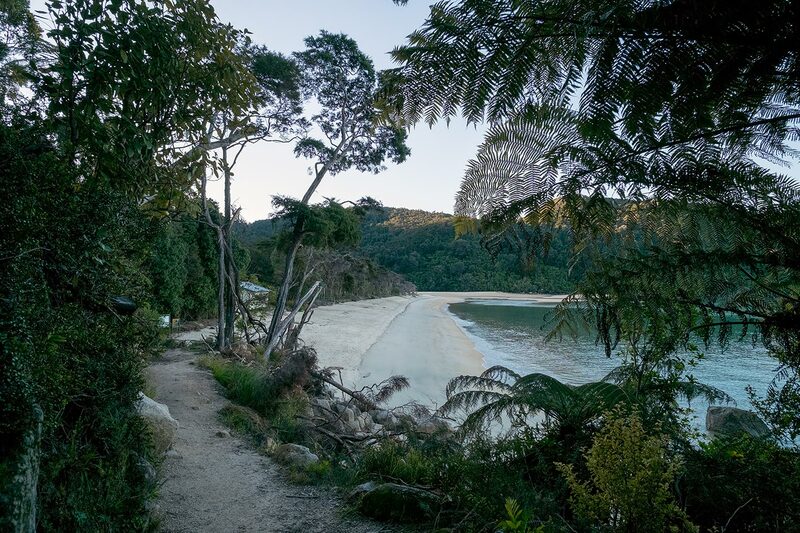 ANCHORAGE TO BARK BAY - A steep and uncivilised track brings us down to Sandfly Bay. 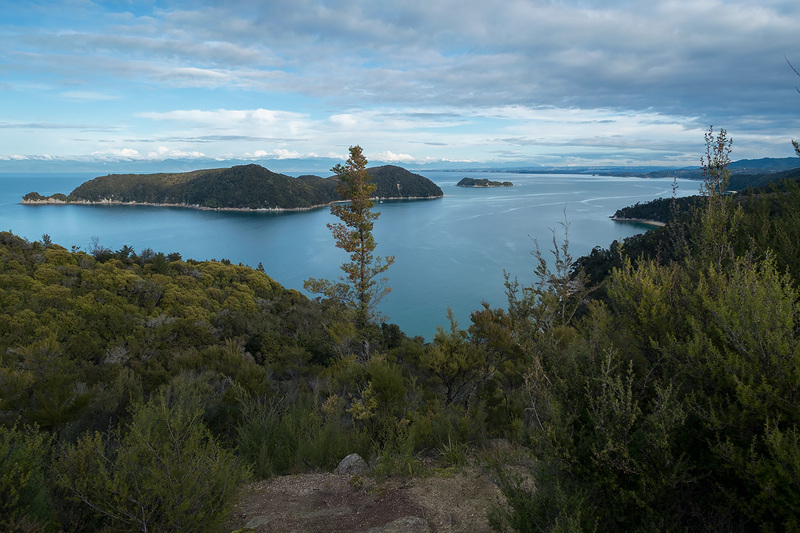 ANCHORAGE TO BARK BAY - View from South Head Lookout - a 10 minutes return side track. 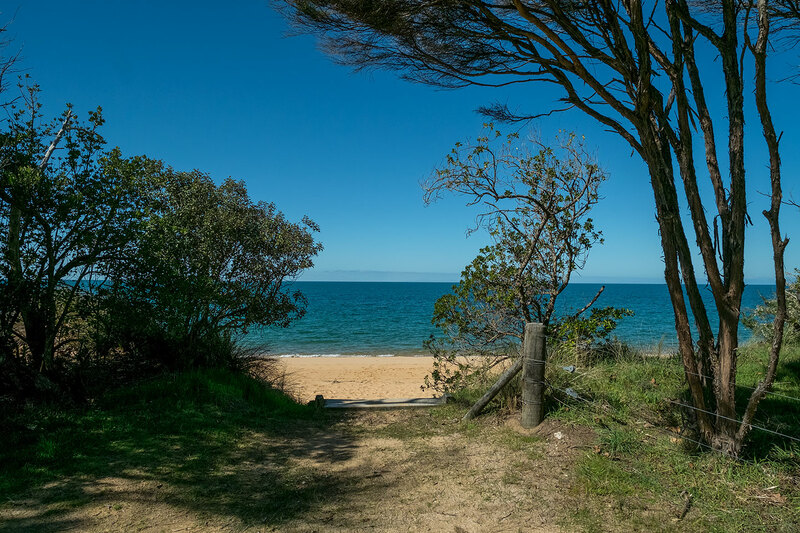 ANCHORAGE TO BARK BAY - Medlands Beach. 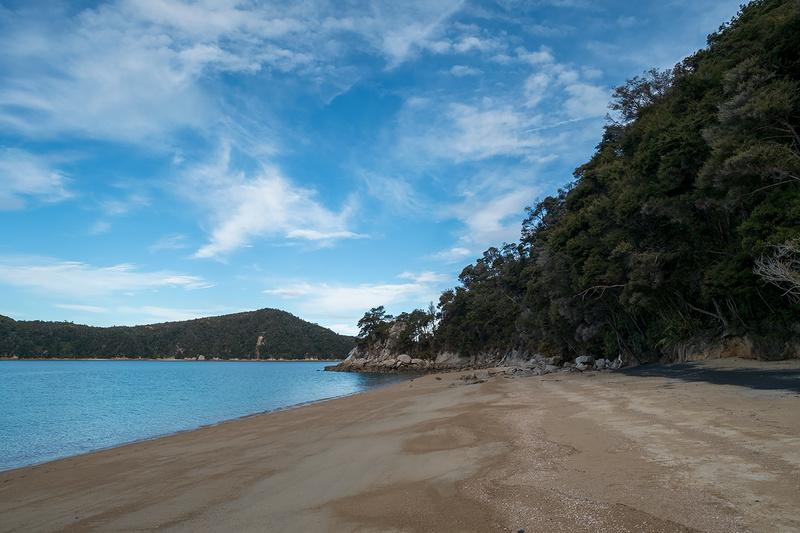 ANCHORAGE TO BARK BAY - Bark Bay. 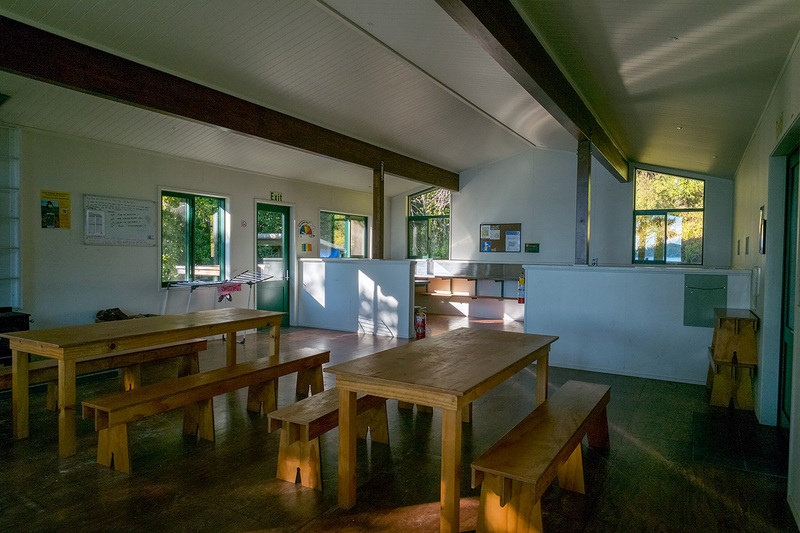 BARK BAY HUT - 40 bunk beds, Woodburner for heating Kitchen / Dining Room and two of the three Bunkrooms. 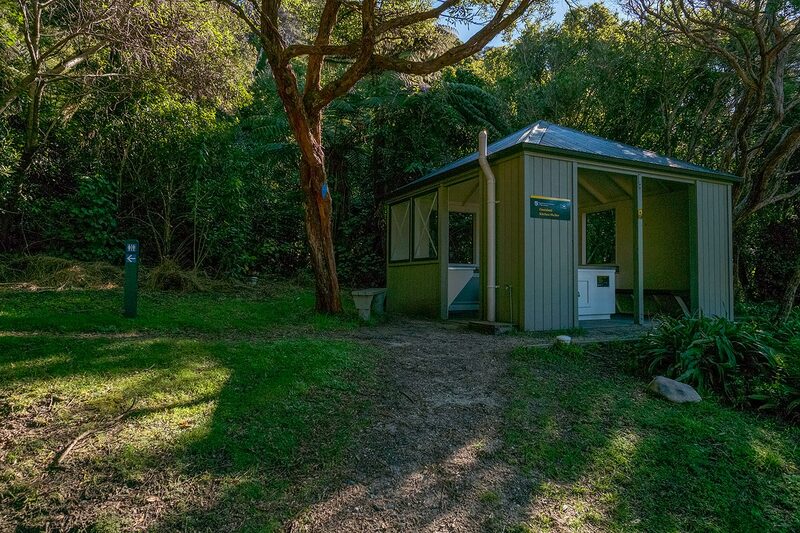 BARK BAY HUT - Okay... 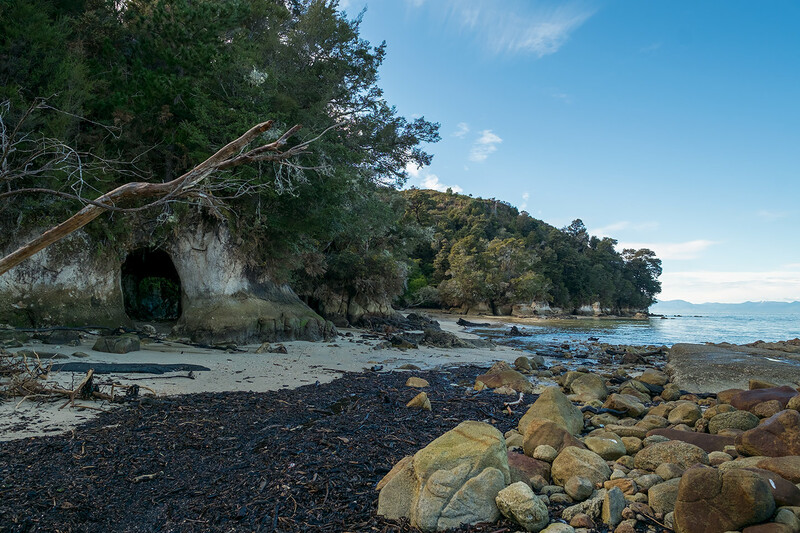 Here's the big secret about Bark Bay Hut. 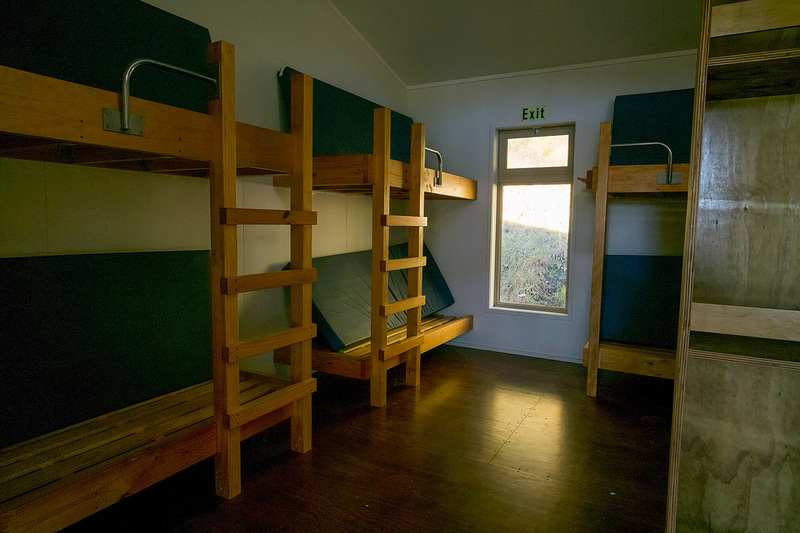 There are three Bunkrooms. 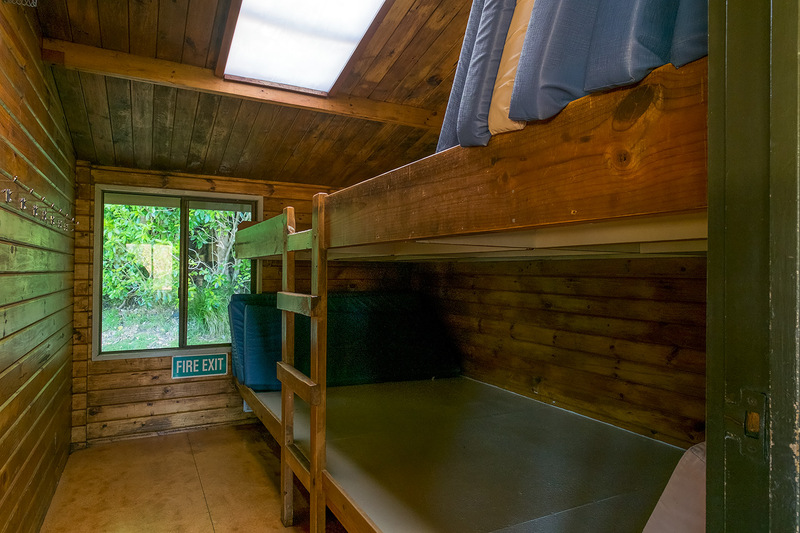 Most people only notice two Bunkrooms. 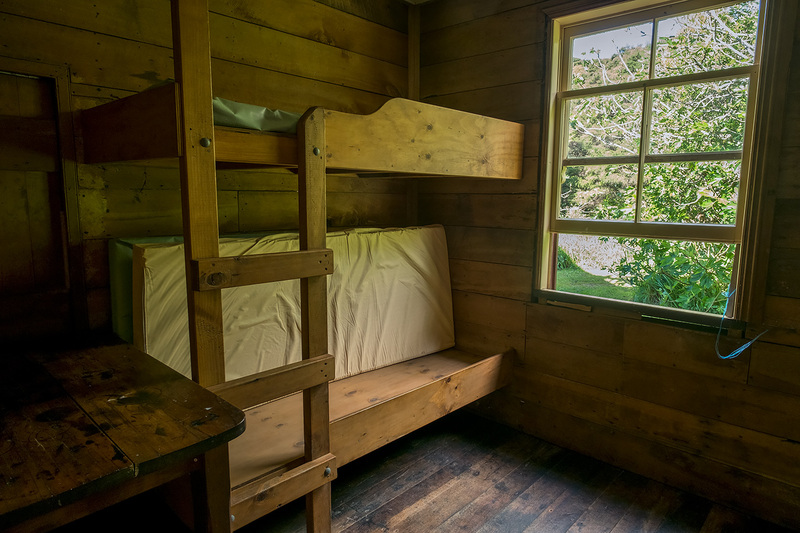 The third Bunkroom - known as "The Honeymoon Suite" is at the righthand end of the hut. 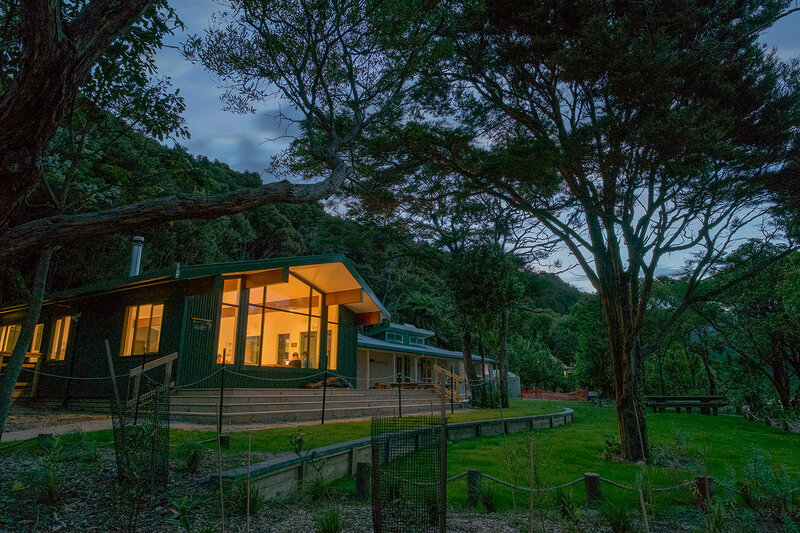 It has its own entrance door off the deck. 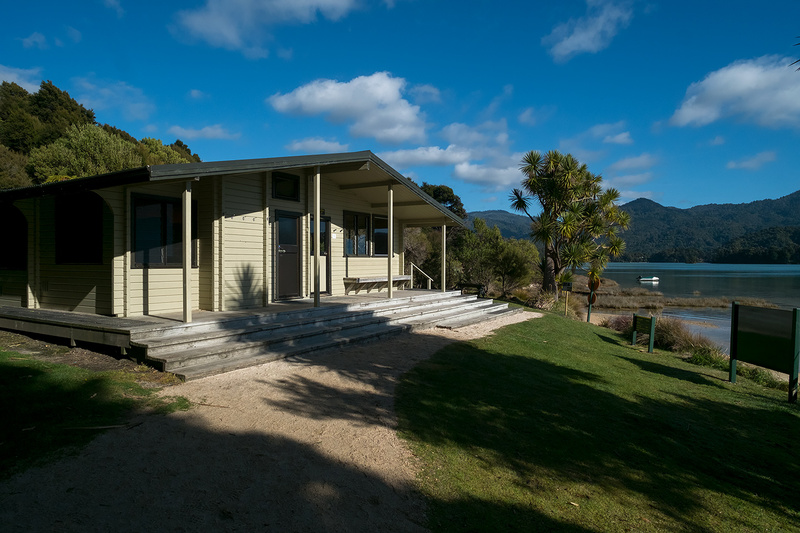 BARK BAY HUT - The Honeymoon Suite. 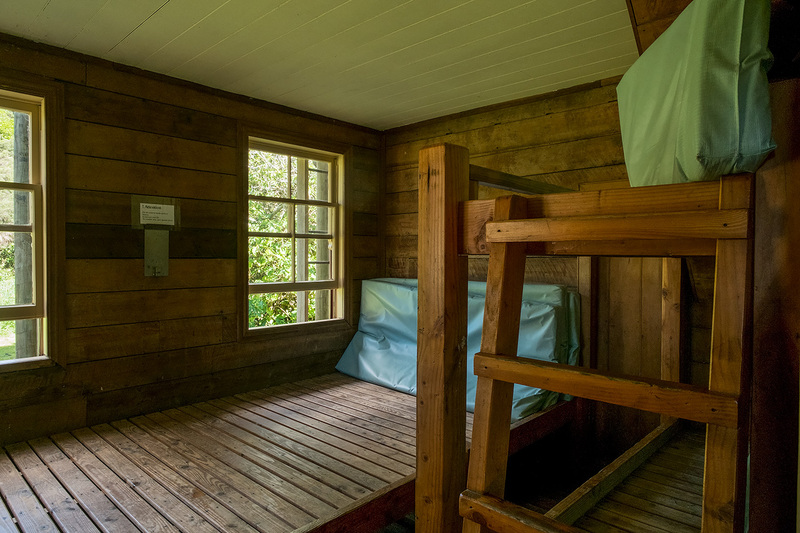 This small Bunkroom is the one to go for if we want peace and quiet, privacy - and less chance of snorers. 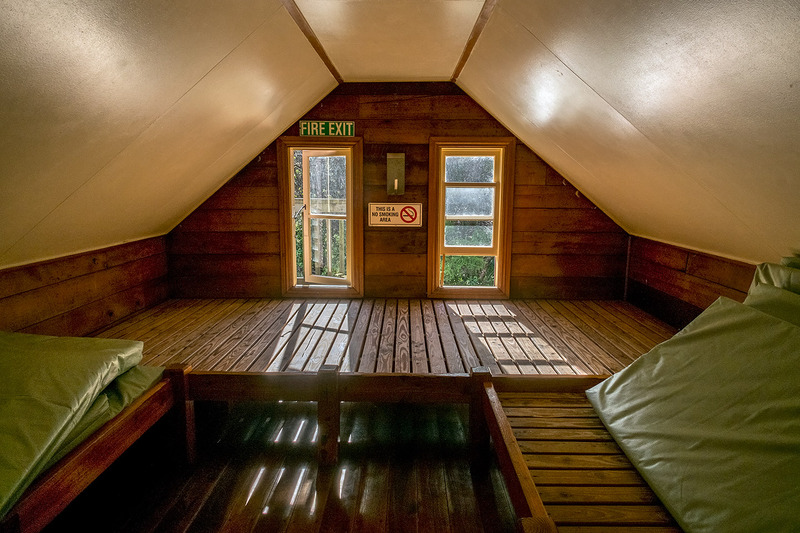 There is no heating in this room but it is well insulated. 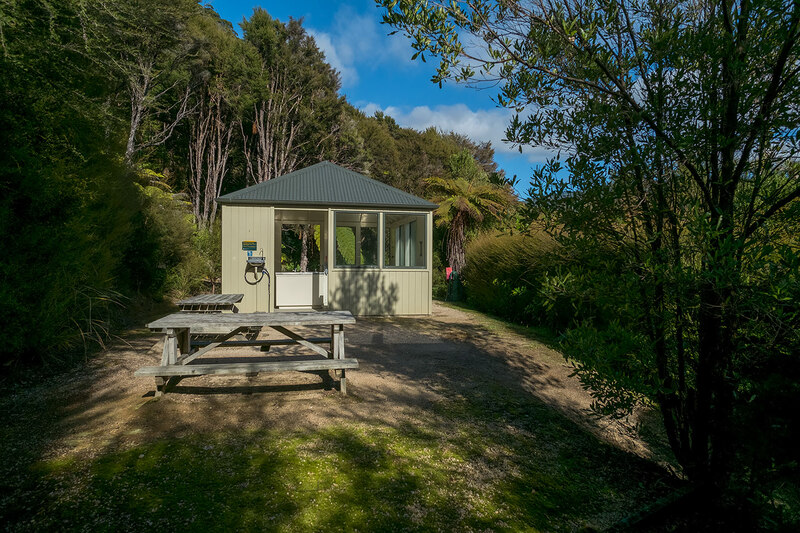 BARK BAY HUT - Dining Area and Entrance Door. 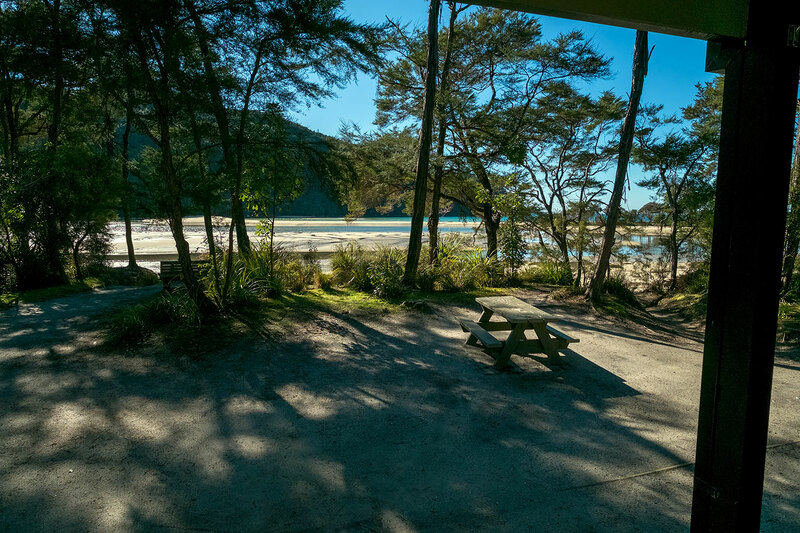 BARK BAY HUT - Dining Area. 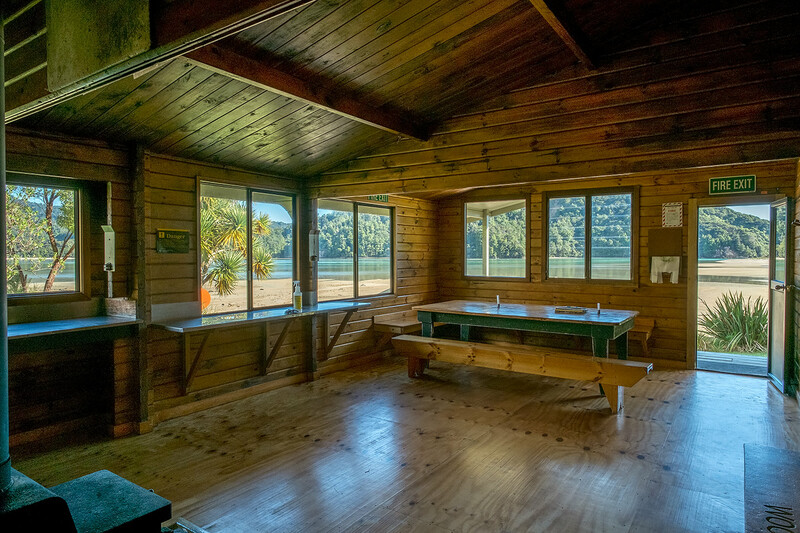 BARK BAY HUT - Main Bunkroom 1. 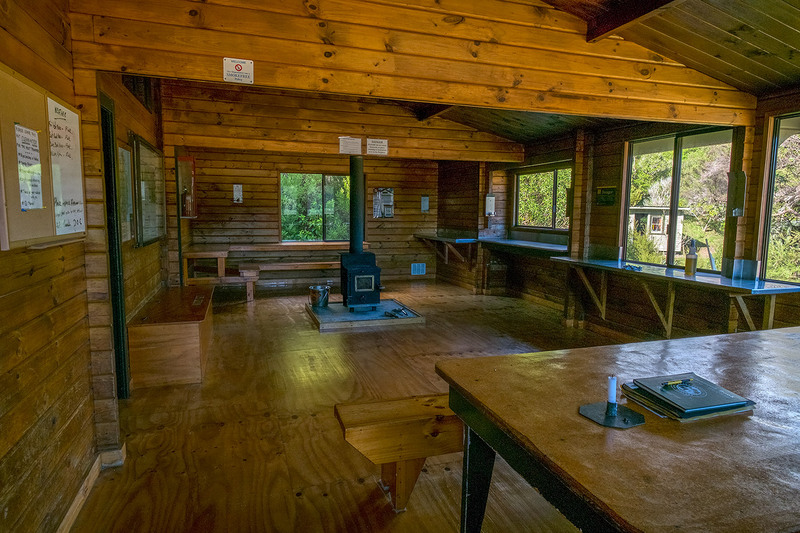 BARK BAY HUT - Main Bunkroom 2. 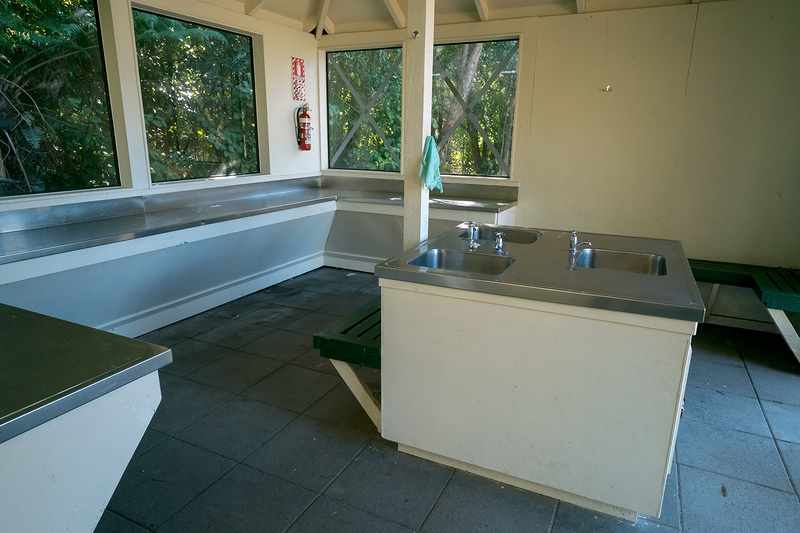 BARK BAY HUT - Toilets. 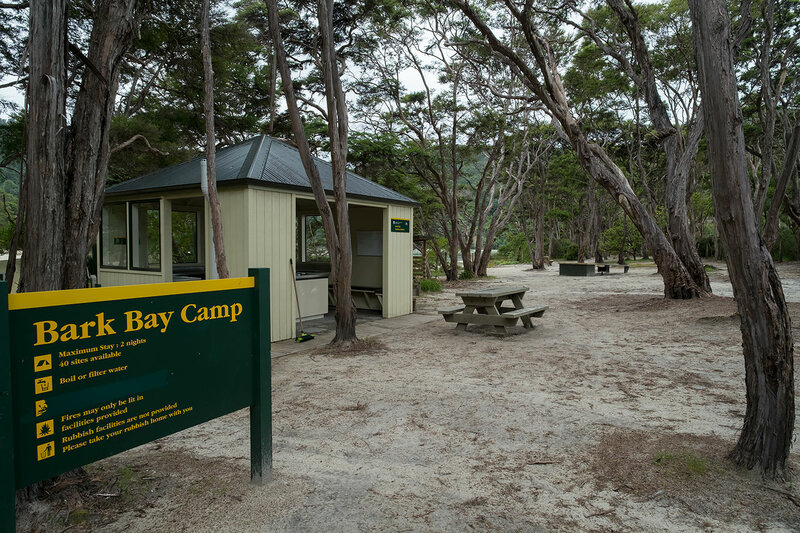 BARK BAY CAMPSITE - 40 nonpowered tent sites. 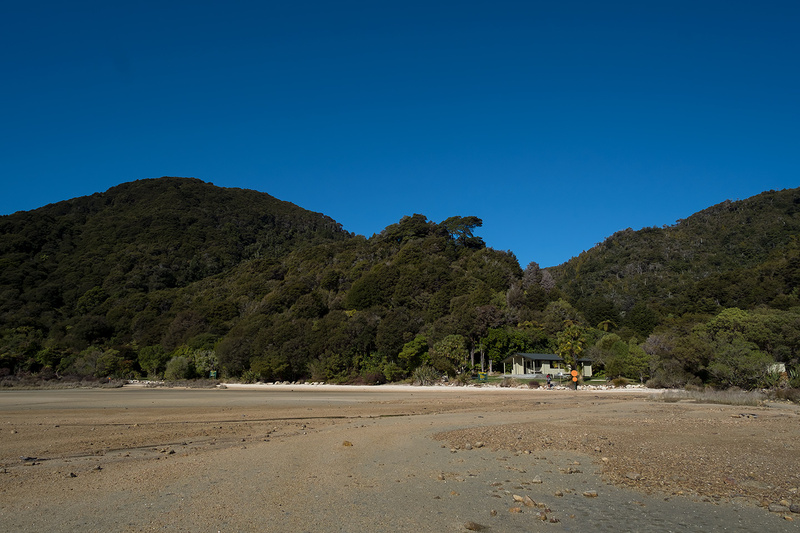 BARK BAY CAMPSITE - At Low Tide (as in this photo) we can walk across the sand to Bark Bay Hut. 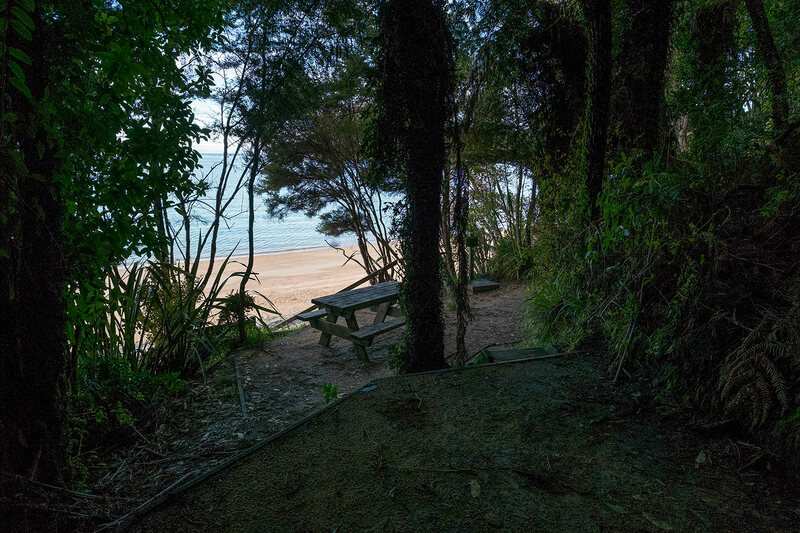 BARK BAY HUT - View from the deck of Bark Bay Hut. 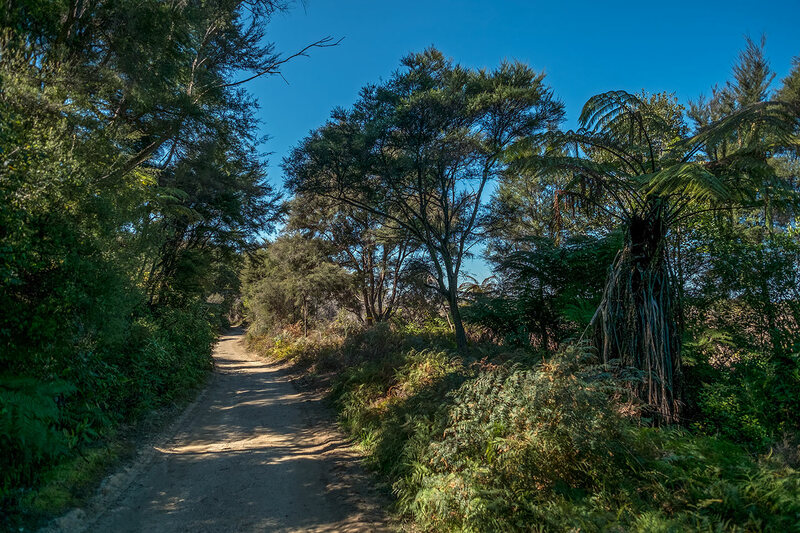 BARK BAY TO AWAROA - This fairly hilly 13.5 km walk takes 4 hours 30 minutes. 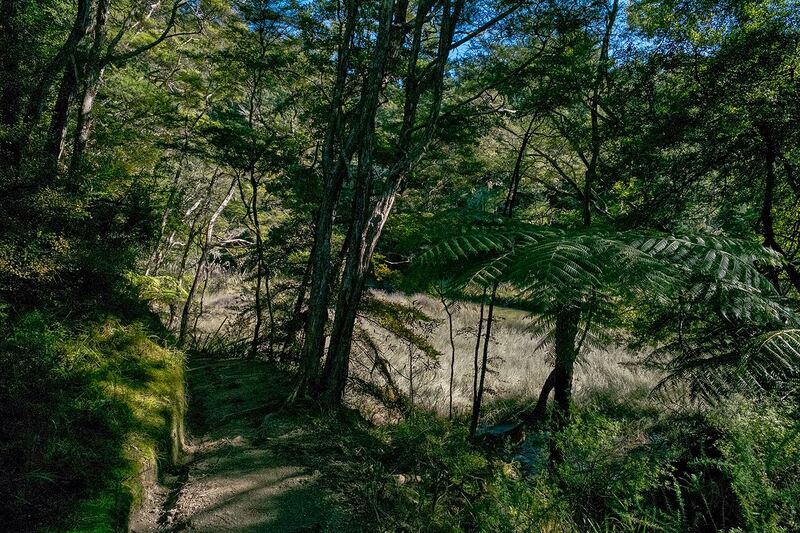 BARK BAY TO AWAROA - Huffam Stream. 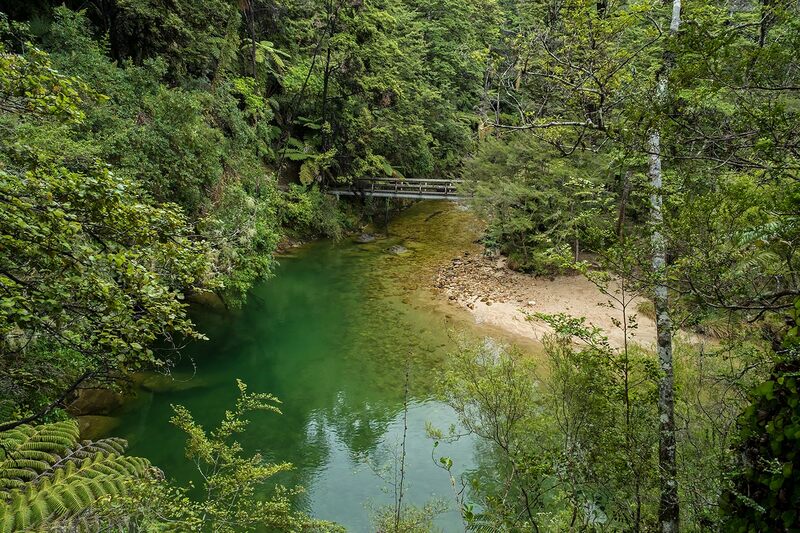 BARK BAY TO AWAROA - Suspension bridge over Huffam Stream. 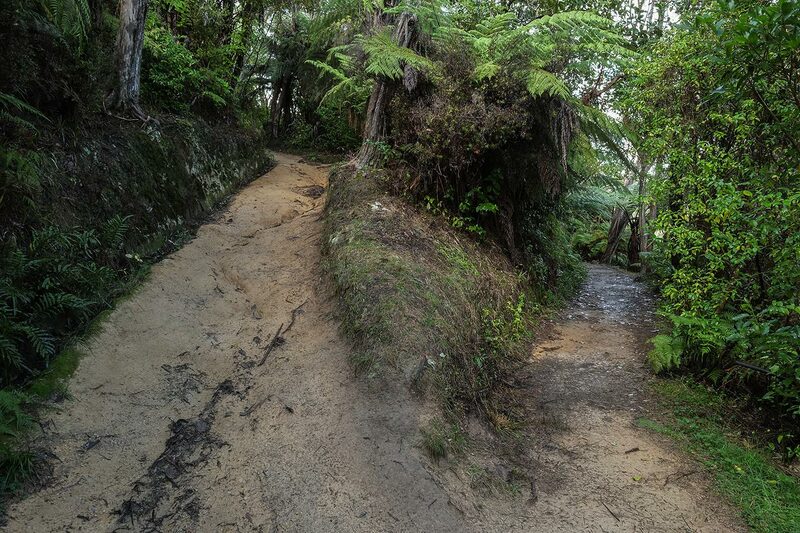 BARK BAY TO AWAROA - And then after Huffam Stream, there's a massive hill to climb. 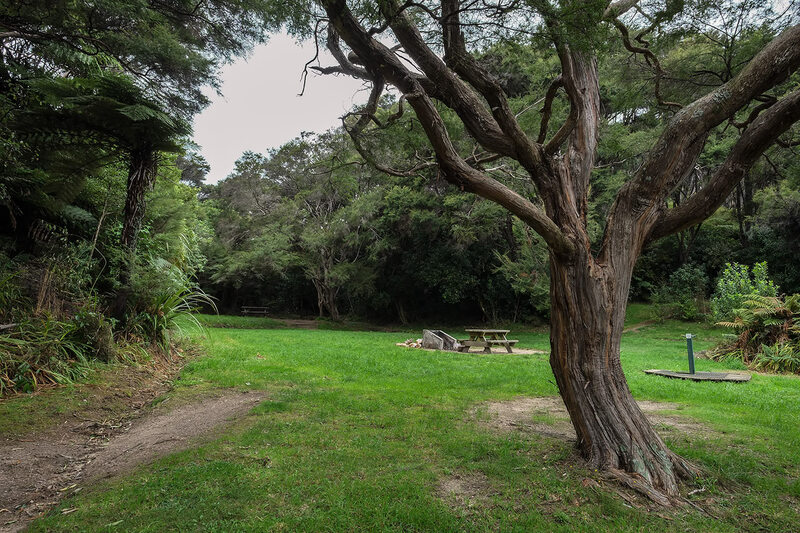 TONGA QUARRY CAMPSITE - 10 nonpowered tent sites. 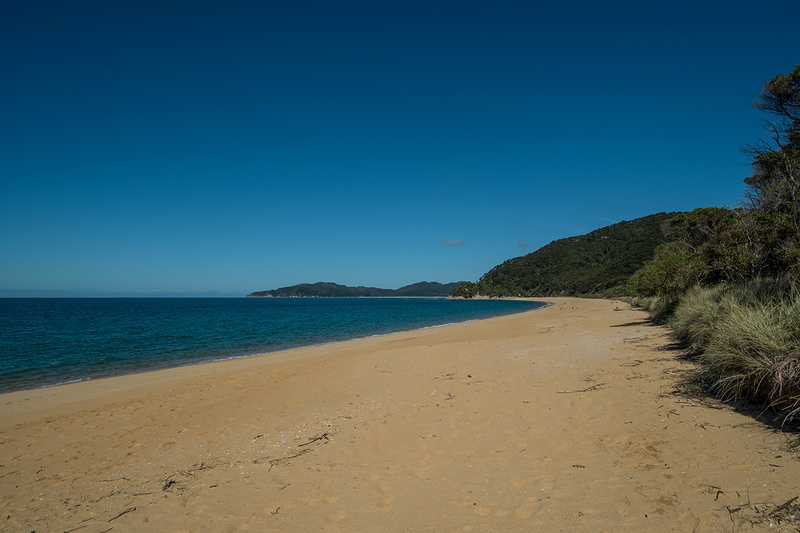 BARK BAY TO AWAROA - Tonga Quarry Beach. 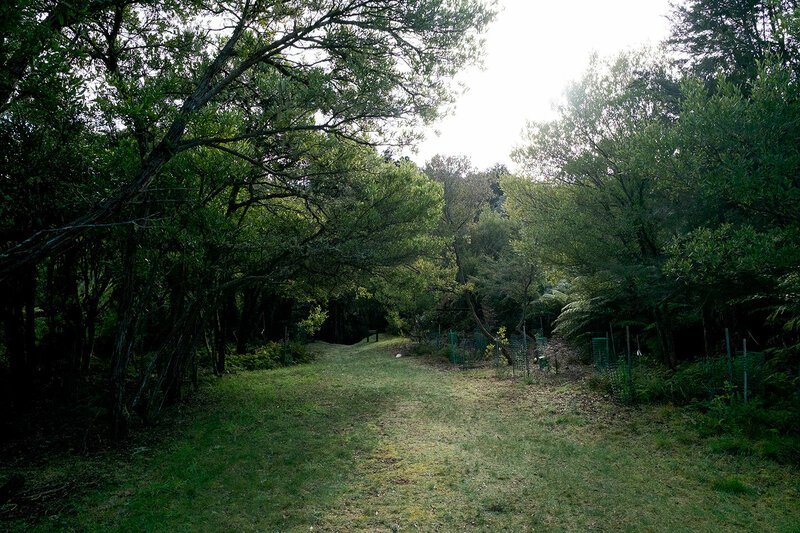 This was the site of an old limestone quarry. 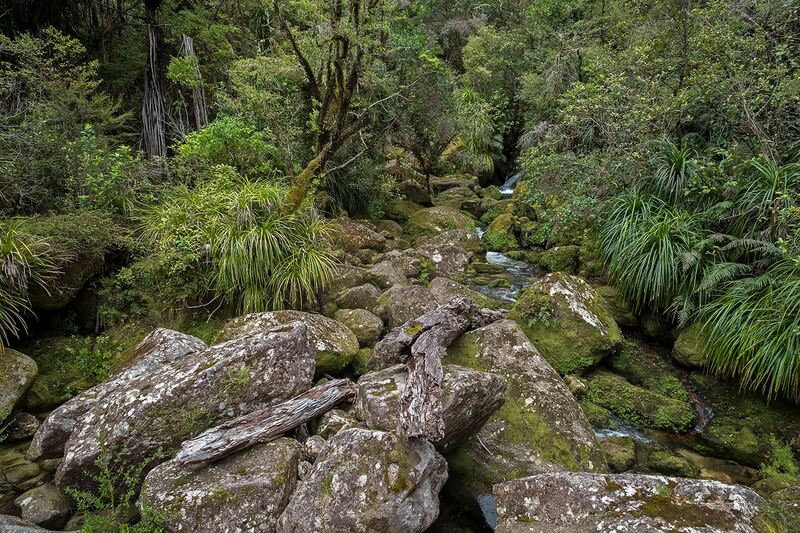 Stone from here was used in NZ's Parliament Buildings. 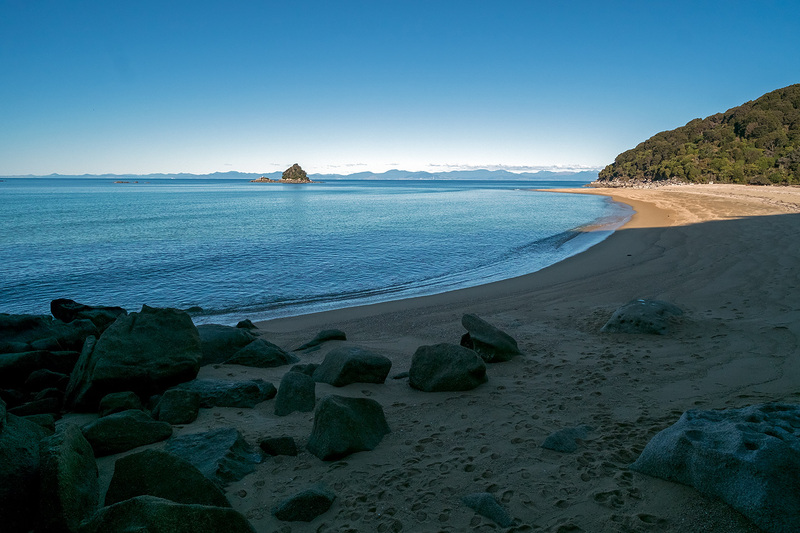 In this photo we can see limestone blocks, ready to be shipped, but abandoned on the beach when the quarry ceased business. 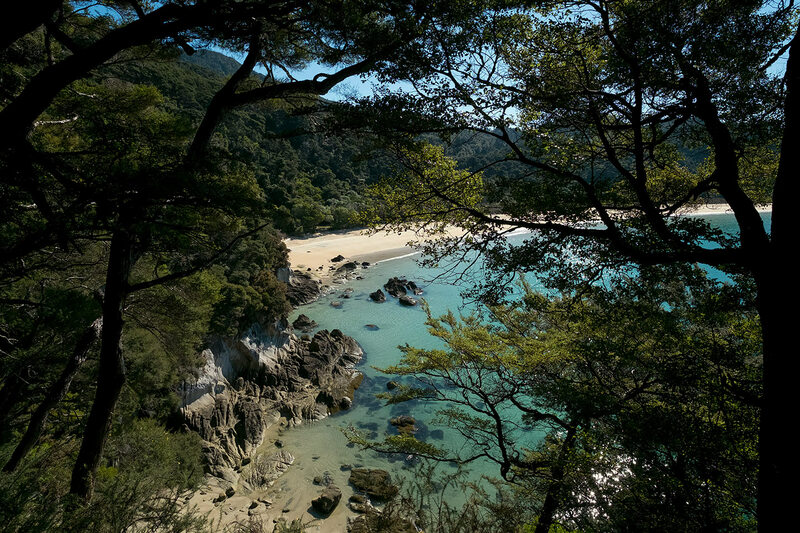 BARK BAY TO AWAROA - Looking down on Onetahuti Beach. 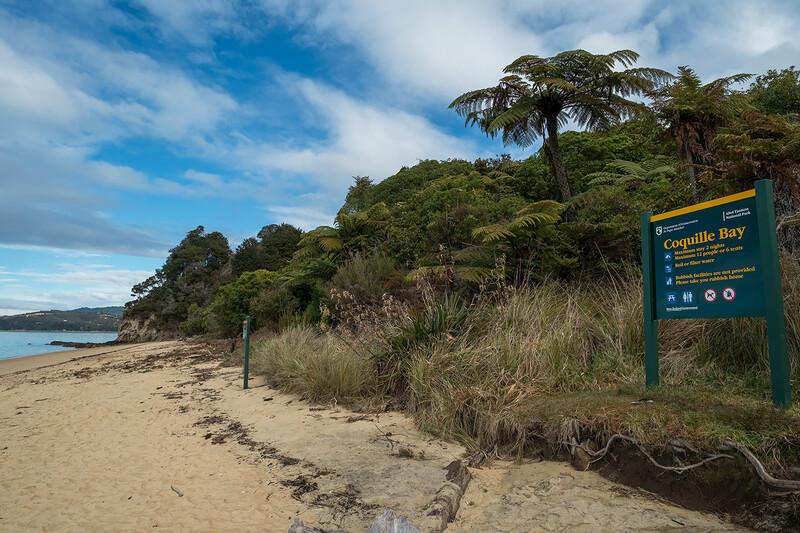 BARK BAY TO AWAROA - Onetahuti Beach. 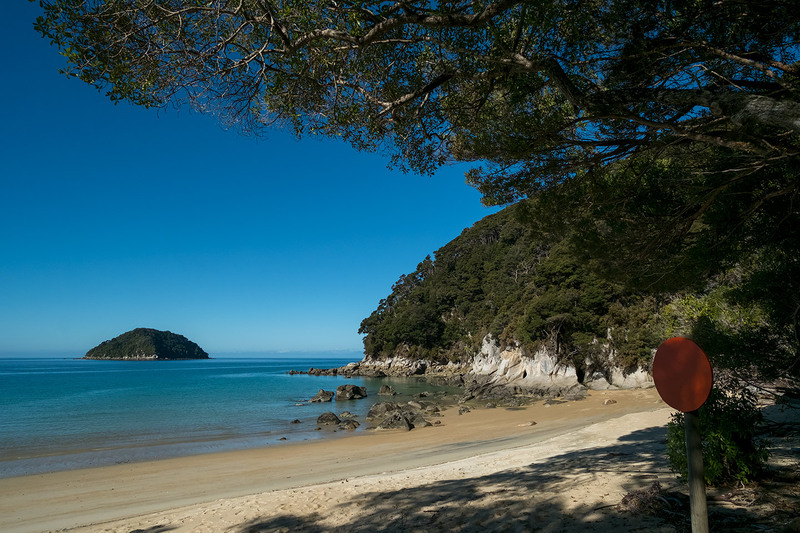 ONETAHUTI CAMPSITE - 20 nonpowered tent sites. 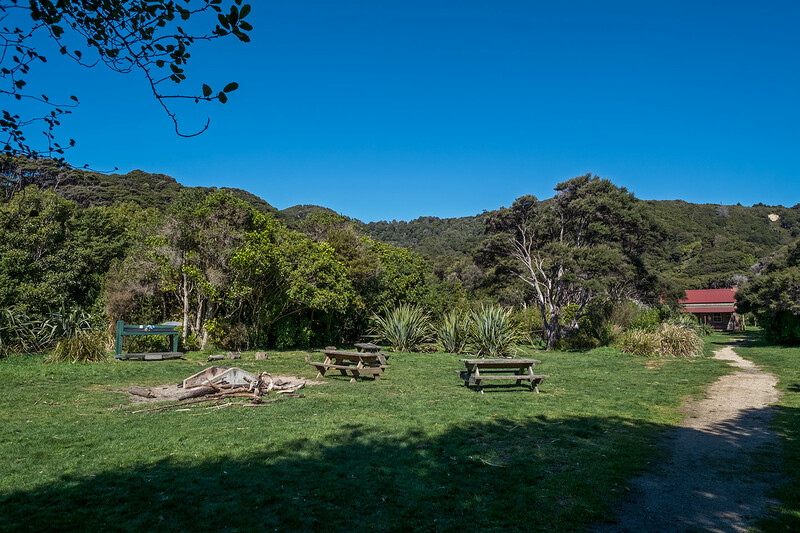 ONETAHUTI CAMPSITE - Cooking Shelter. 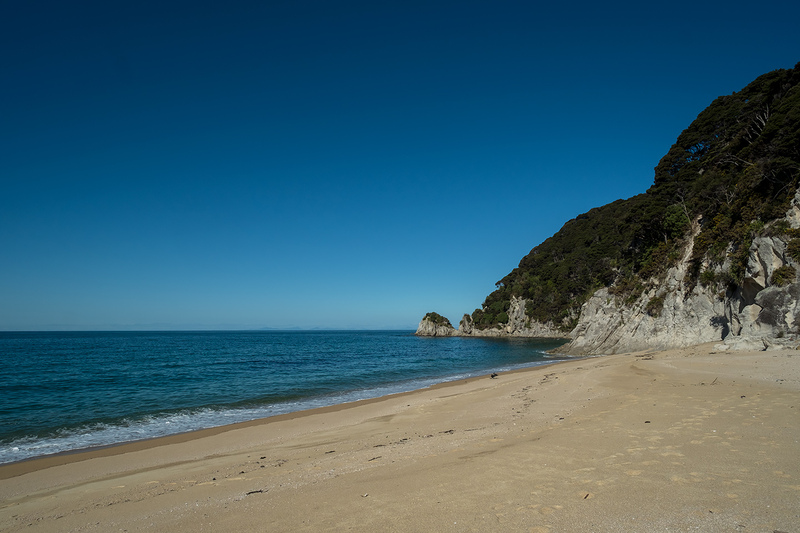 BARK BAY TO AWAROA - Onetahuti Beach. 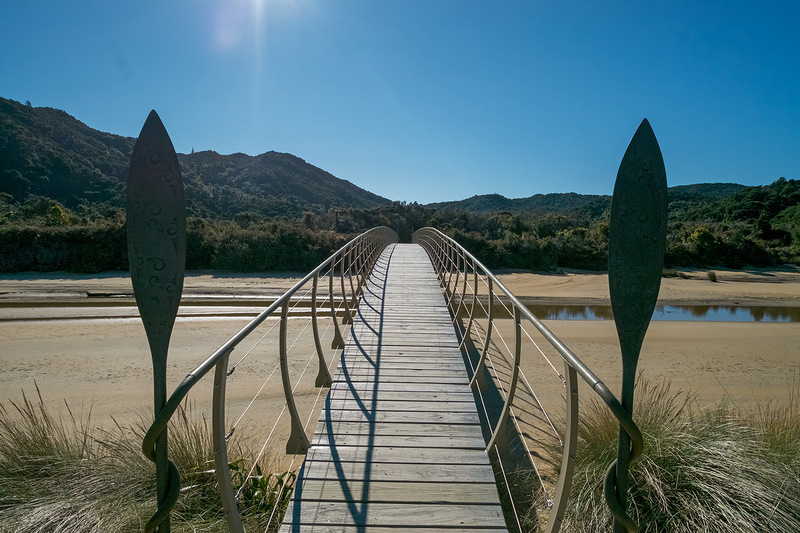 This beautiful bridge means we can cross here anytime we want to. 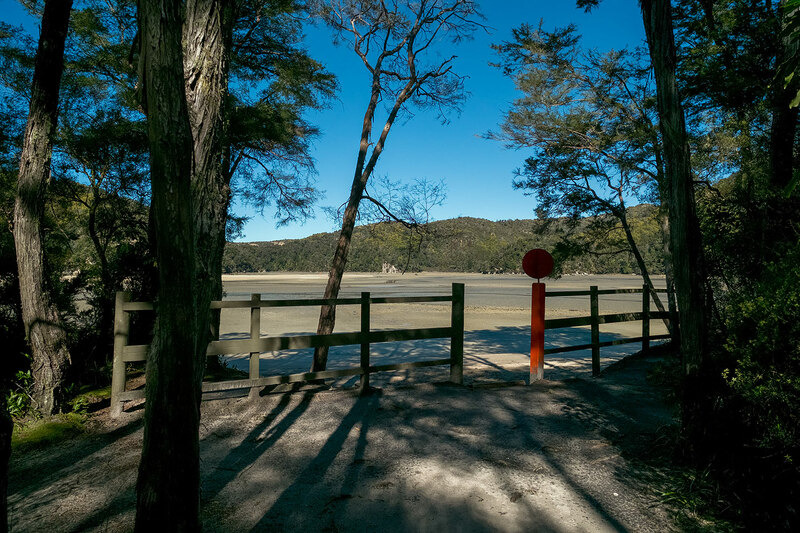 Previously it was a Low Tide Only crossing and that meant planning headaches. 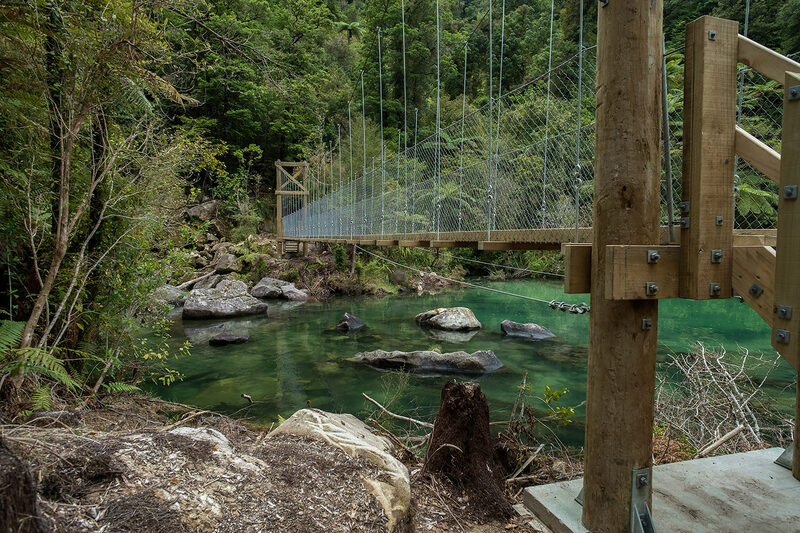 This bridge was a huge step forward. 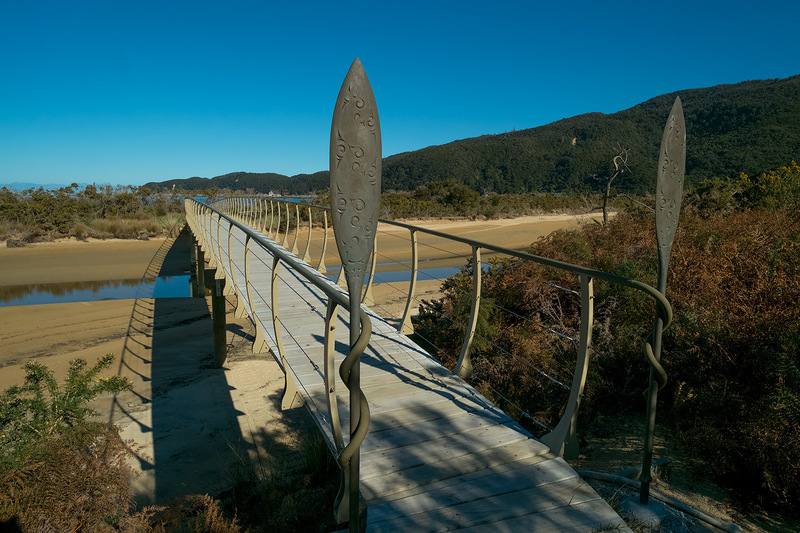 BARK BAY TO AWAROA - Onetahuti Bridge. 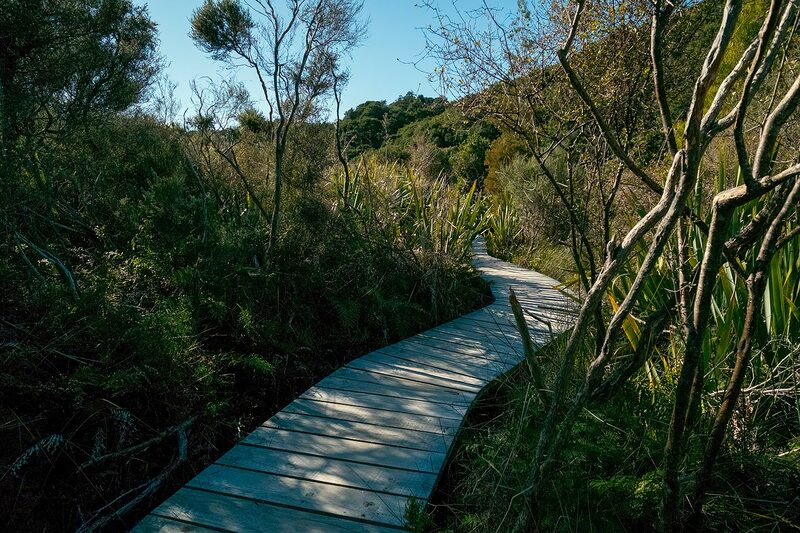 BARK BAY TO AWAROA - Onetahuti Boardwalk. 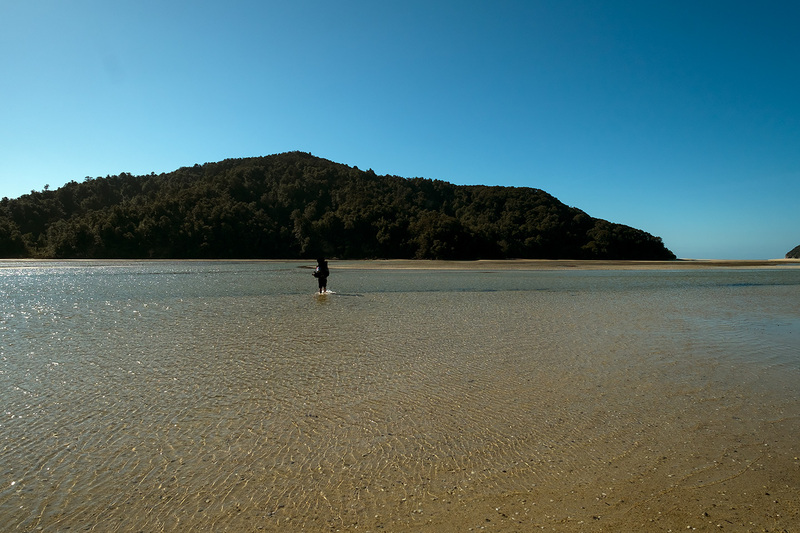 BARK BAY TO AWAROA - Onetahuti Low Tide Crossing. 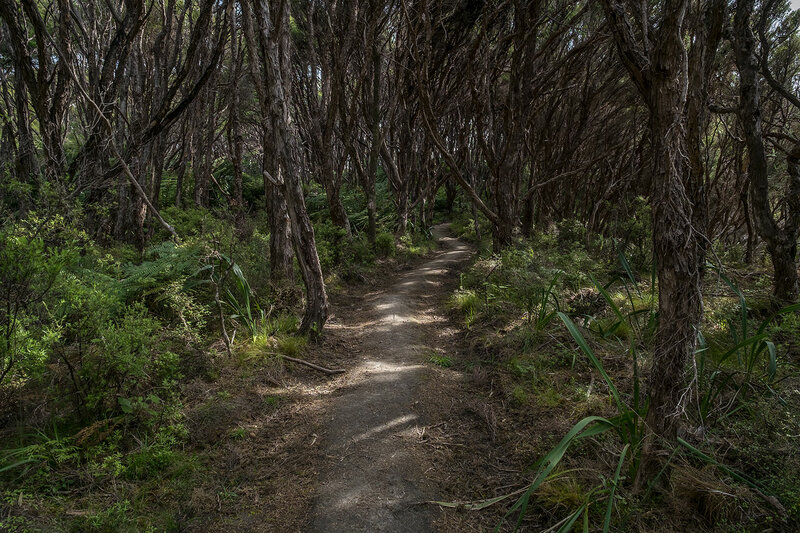 BARK BAY TO AWAROA - Now the track climbs again. 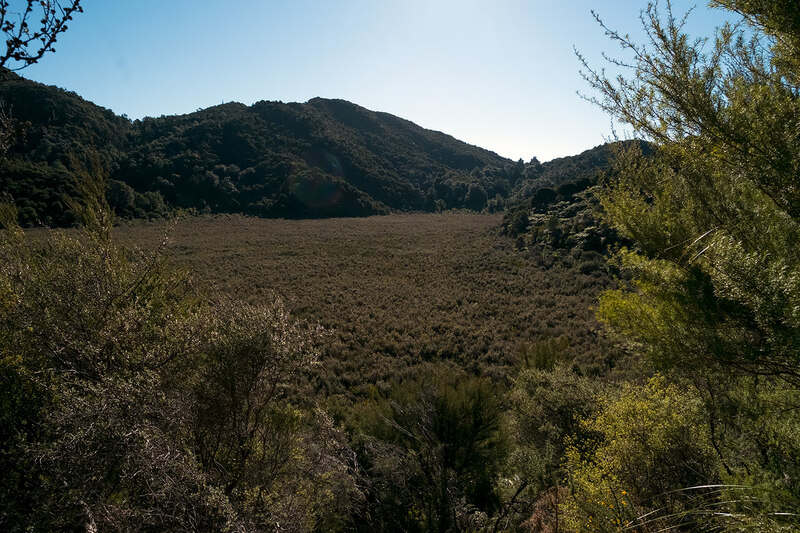 BARK BAY TO AWAROA - View over Onetahuti Wetlands. 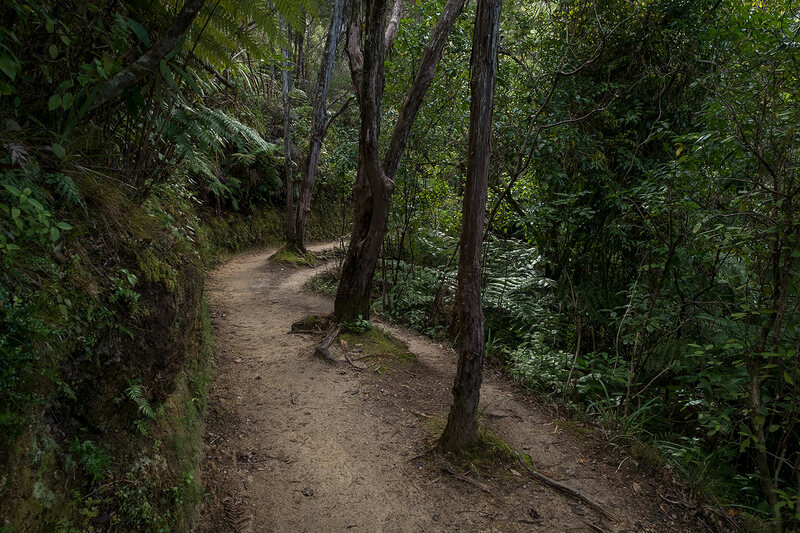 BARK BAY TO AWAROA - The track continues to climb. 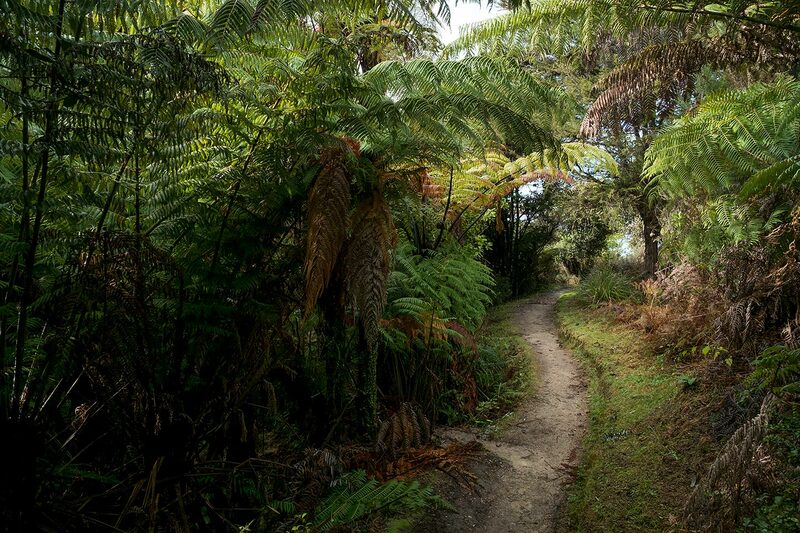 BARK BAY TO AWAROA - We carry on straight ahead here. 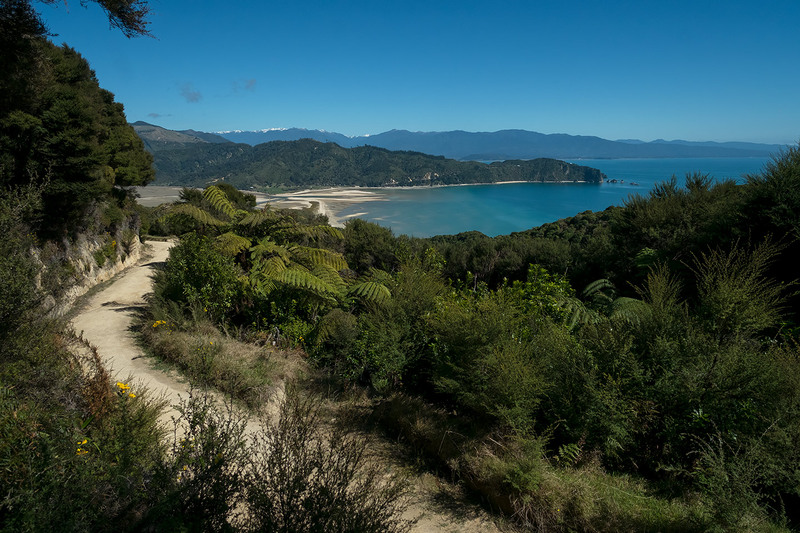 The track to the right is the turnoff to Awaroa Beach. 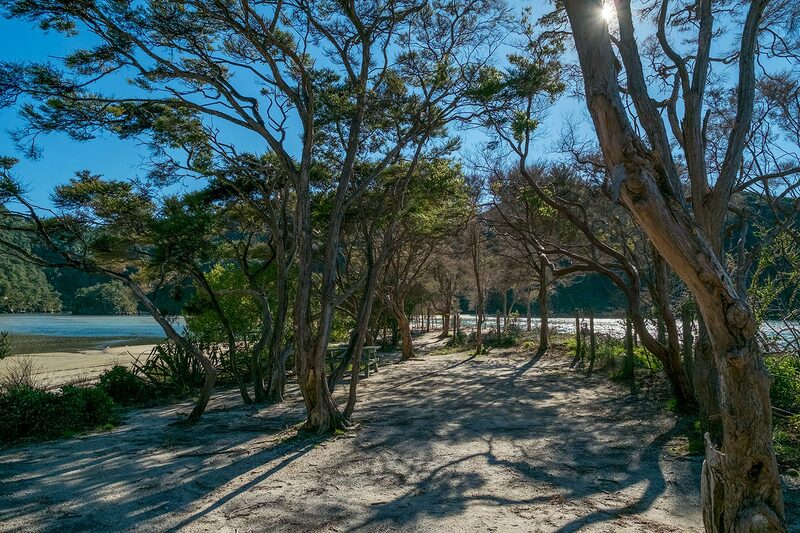 BARK BAY TO AWAROA - Awaroa Inlet. 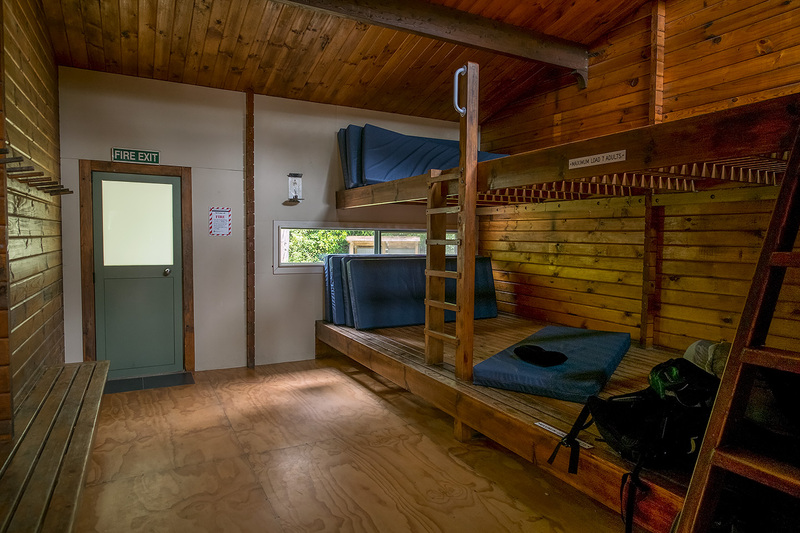 AWAROA HUT - 30 bunk beds, Woodburner for heating hut and 2 of 3 Bunkrooms. 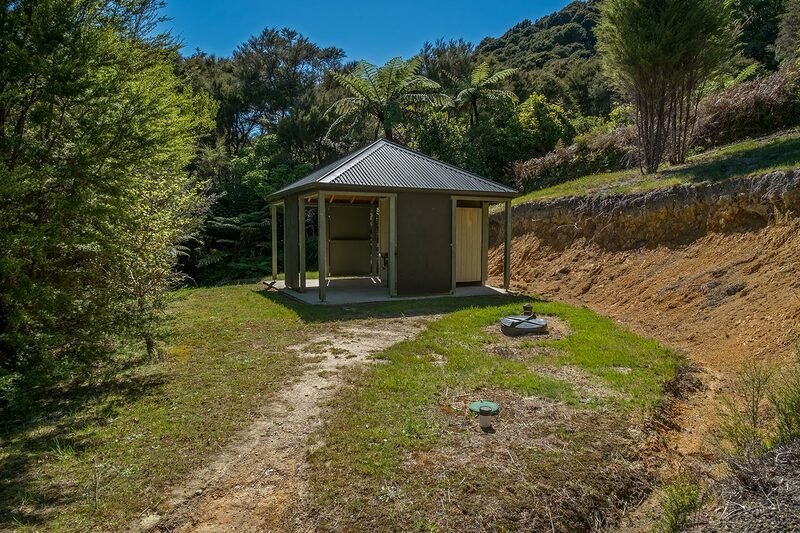 The big secret with Awaroa Hut is the small Bunkroom to the left of the main Entrance Door. 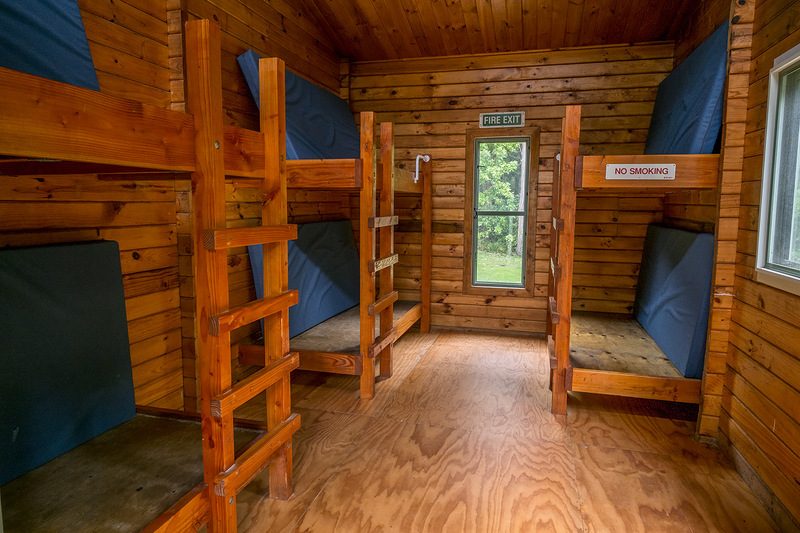 Compared to the other two Bunkrooms, the small one is peaceful and private. 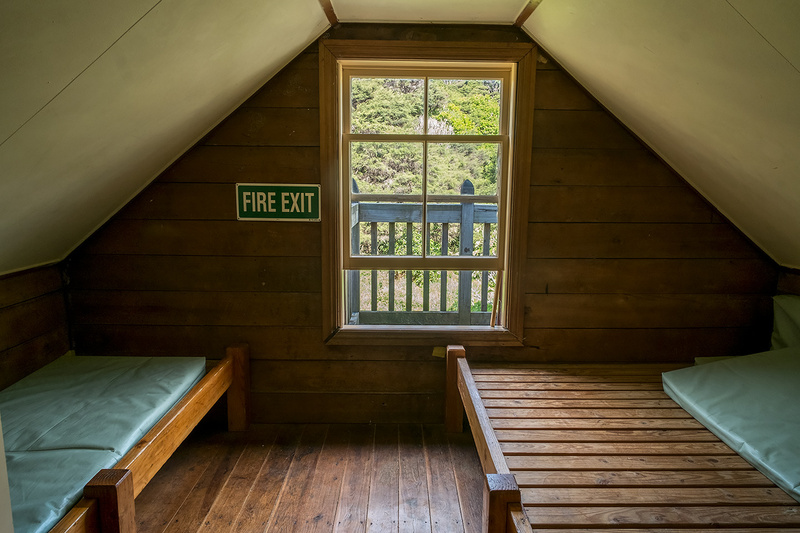 AWAROA HUT - Small Bunkroom. 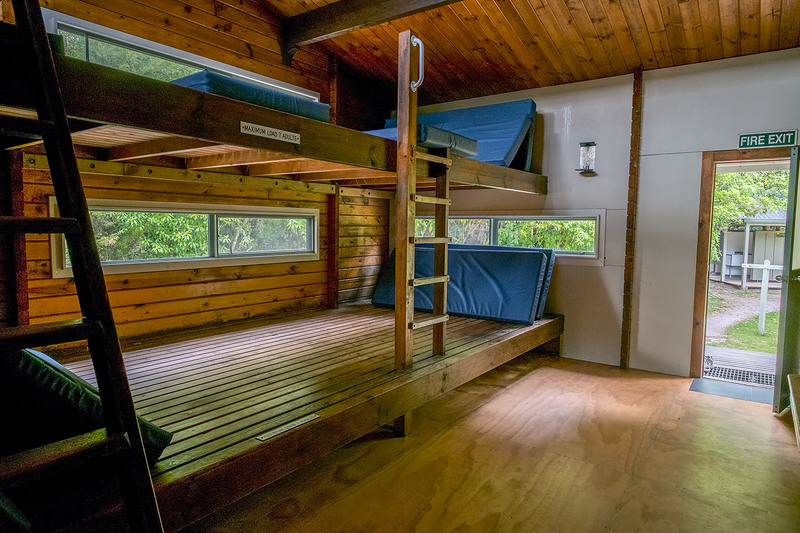 This Bunkroom has its own door onto the deck. 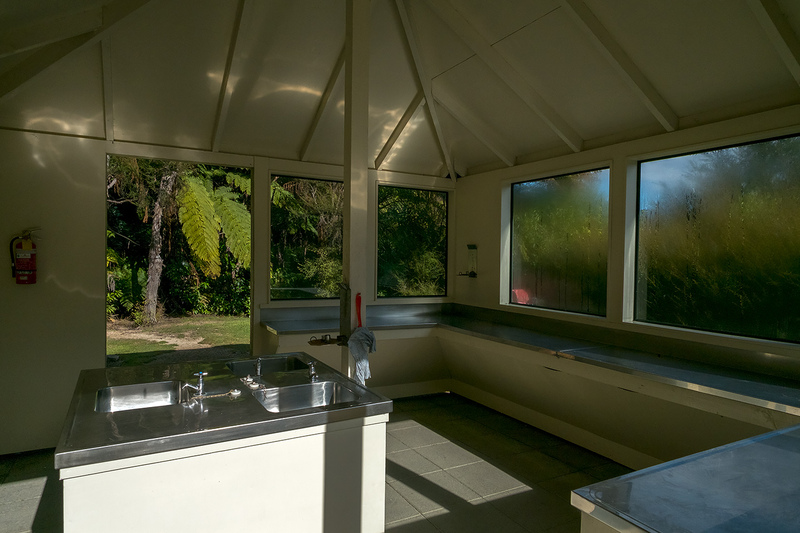 AWAROA HUT - Kitchen / Dining Room. 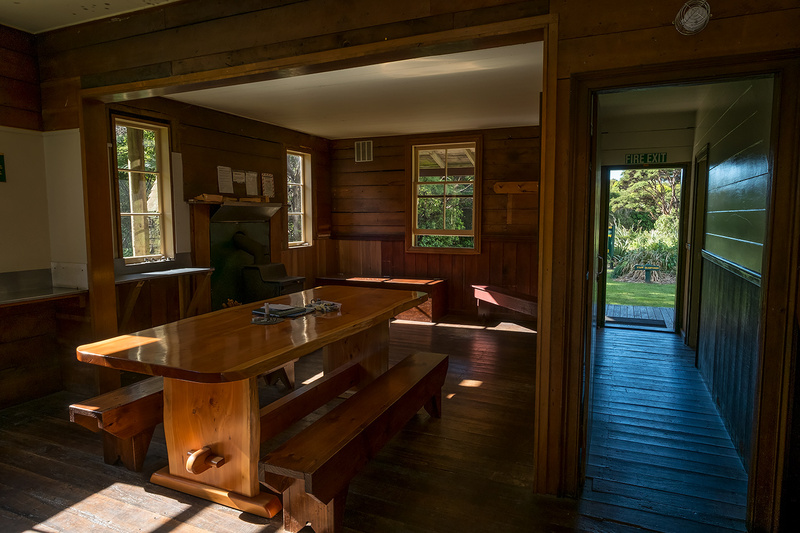 AWAROA HUT - Main Bunkroom 1. 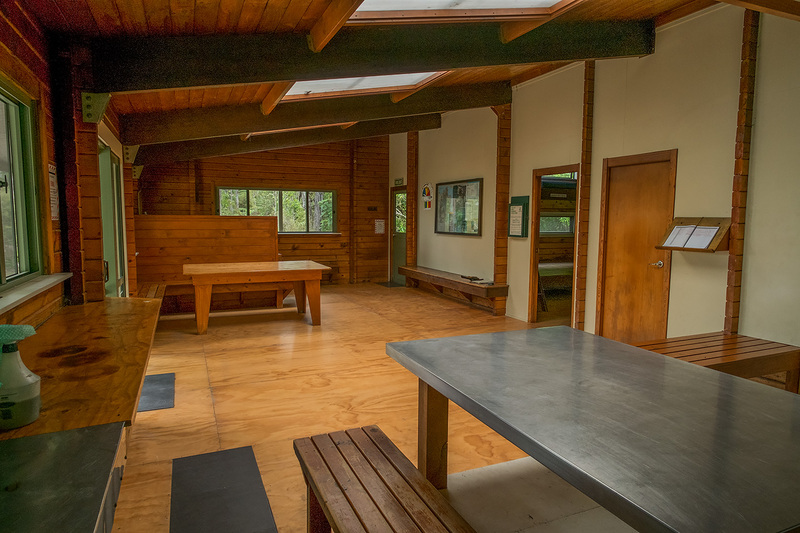 AWAROA HUT - Main Bunkroom 2. 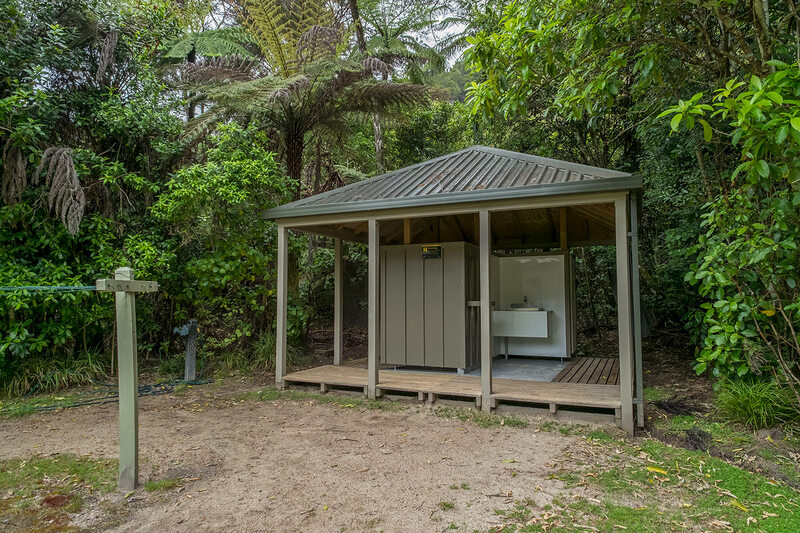 AWAROA HUT - Washing Facilities. 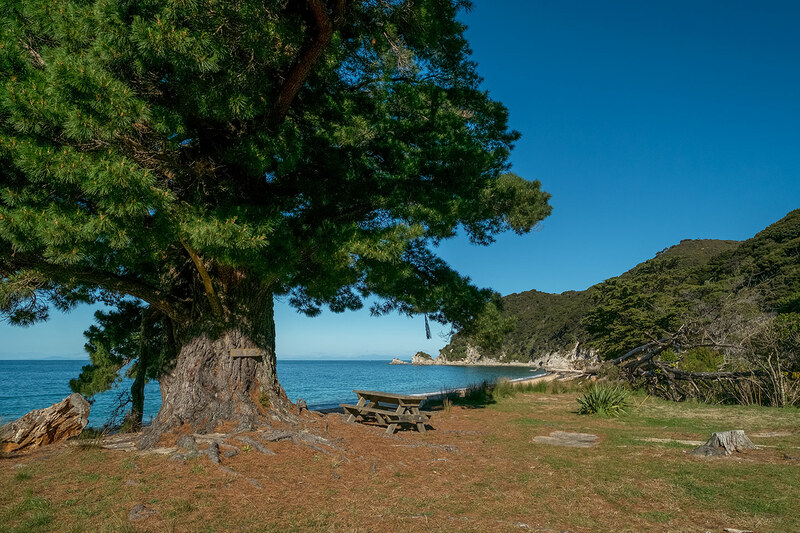 AWAROA CAMPSITE - 18 nonpowered tent sites. 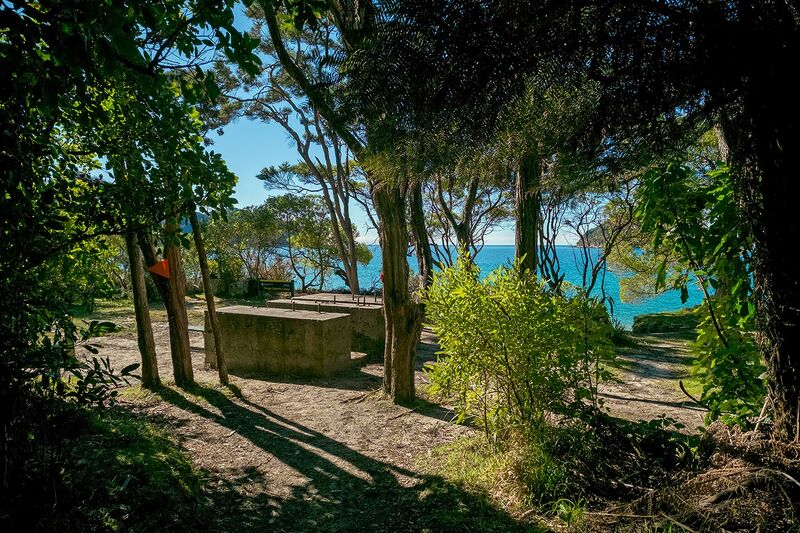 AWAROA CAMPSITE - Cooking Shelter. 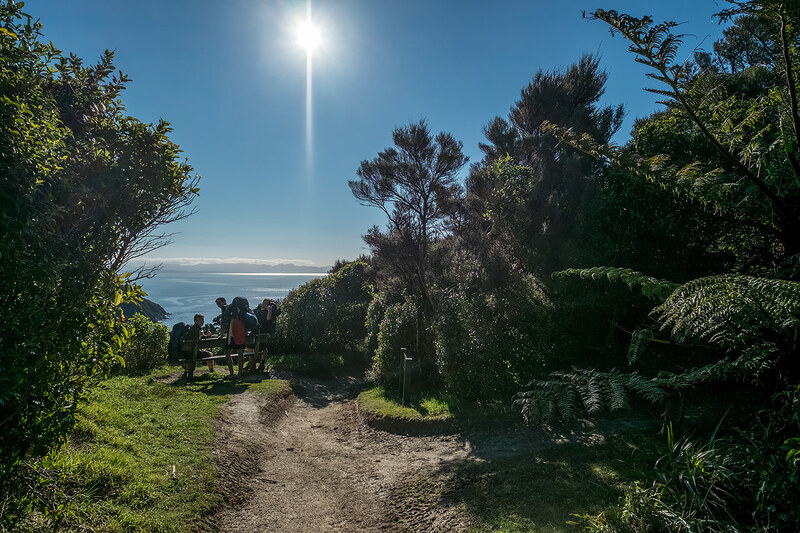 The fairly easy but long 17 km walk from Awaroa Hut to Whariwharangi Hut, stopping at Totaranui for lunch, takes 5 hours 35 minutes. 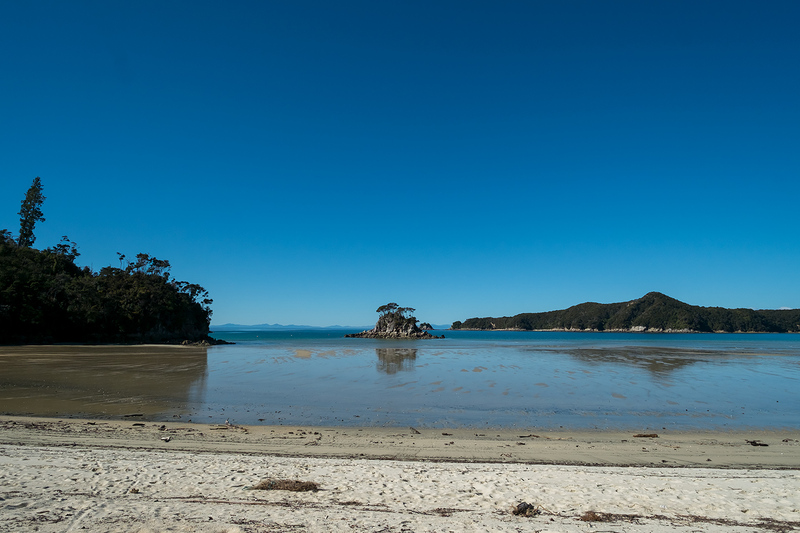 The crucial factor is the Low Tide Time for the crossing at Awaroa. 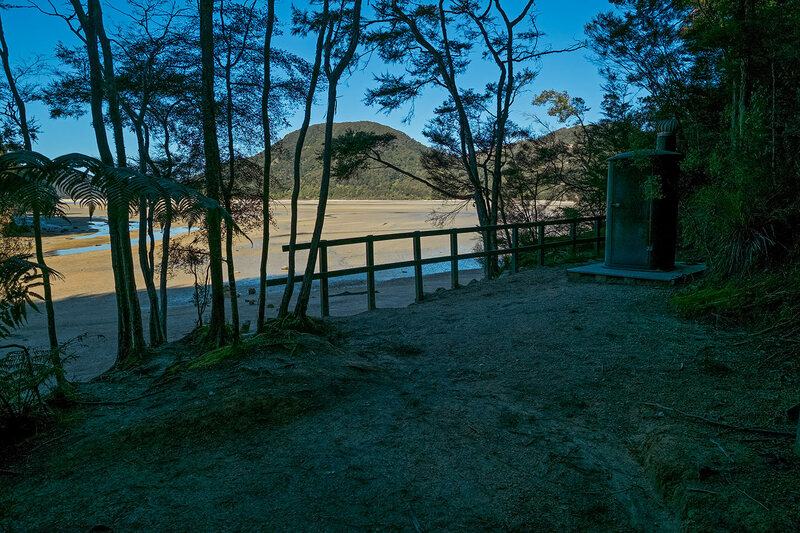 Awaroa Inlet can only be crossed within 1 hour 30 minutes before and 2 hours after low tide. 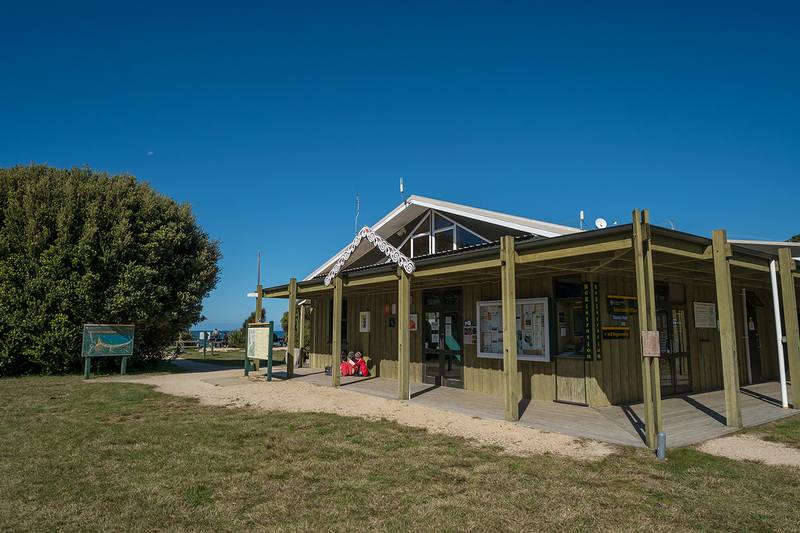 AWAROA HUT - Waiting for Low Tide so we can cross. 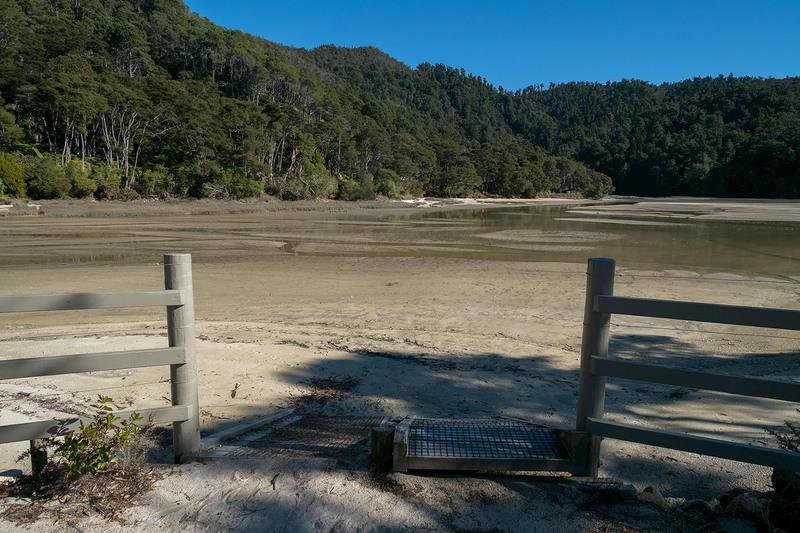 AWAROA TO TOTARANUI - Crossing Awaroa Inlet. 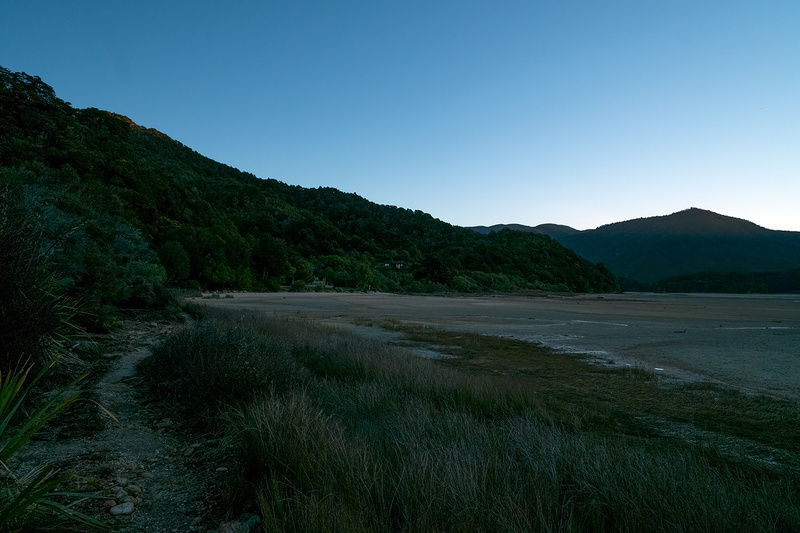 AWAROA TO TOTARANUI - Crossing Awaroa Inlet. 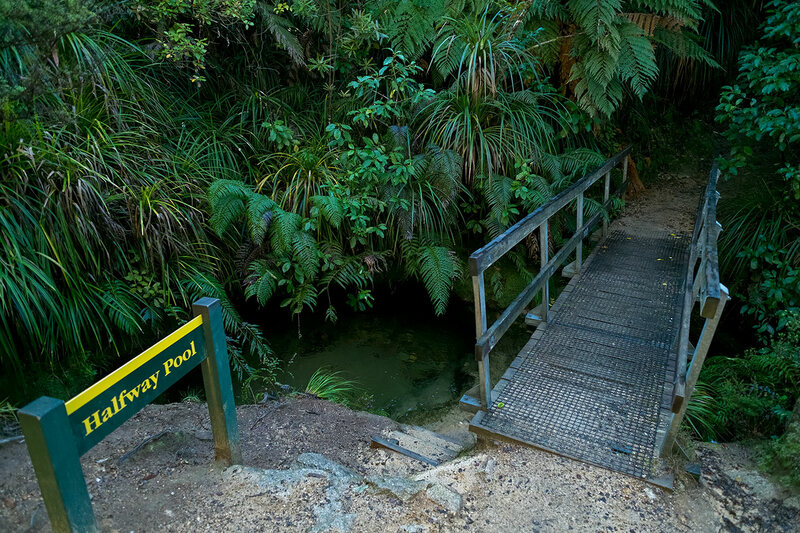 On this crossing the water was only thigh deep. 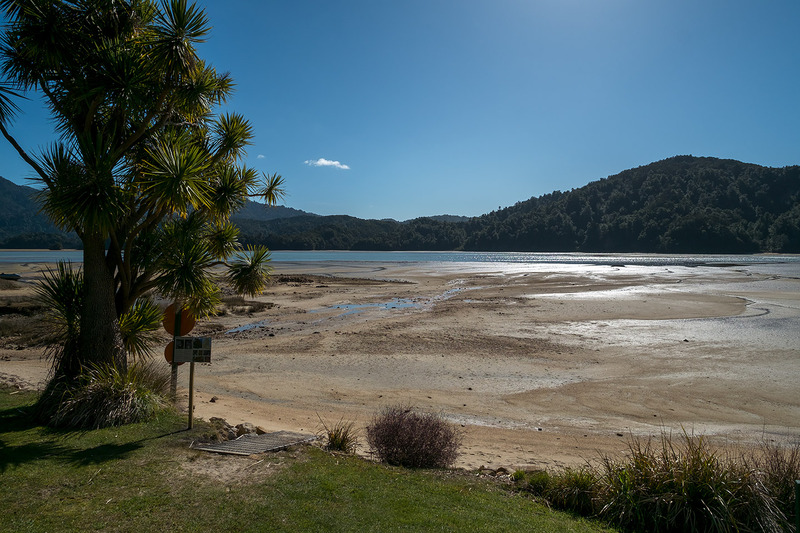 AWAROA TO TOTARANUI - The far side of Awaroa Inlet. 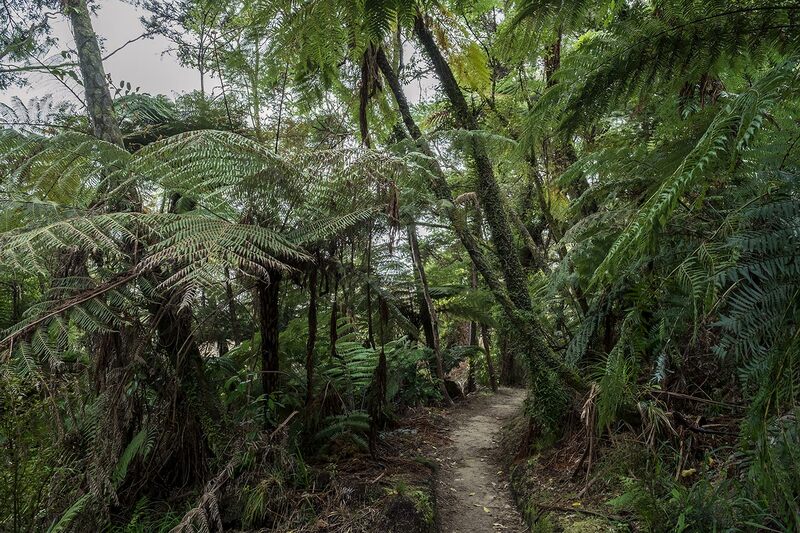 AWAROA TO TOTARANUI - Now the track enters lush forest. 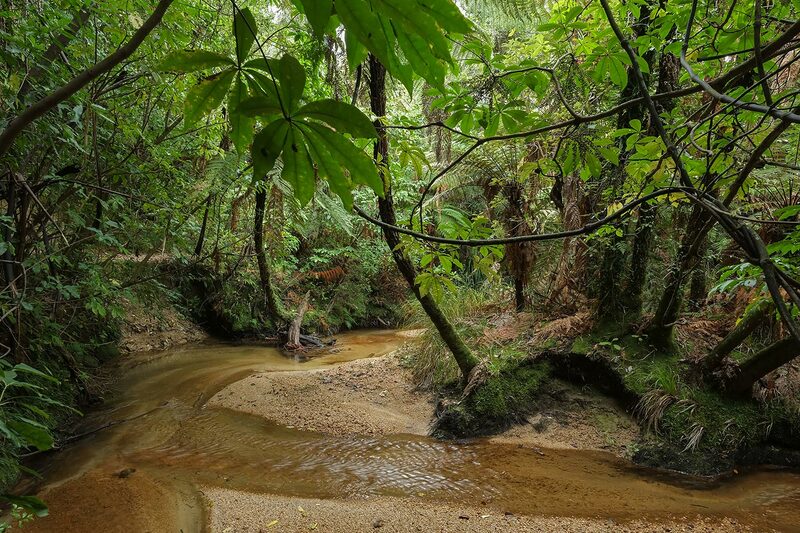 AWAROA TO TOTARANUI - Waiharakeke Stream. 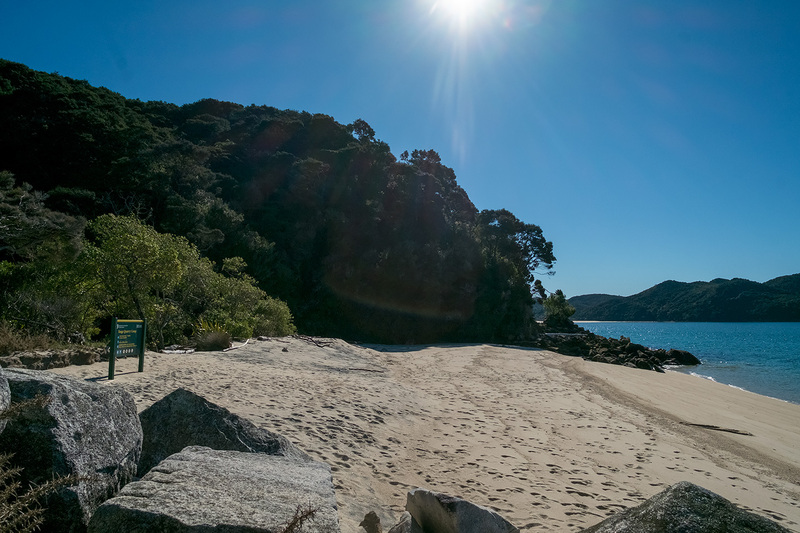 WAIHARAKEKE BAY CAMPSITE - 10 nonpowered tent sites. 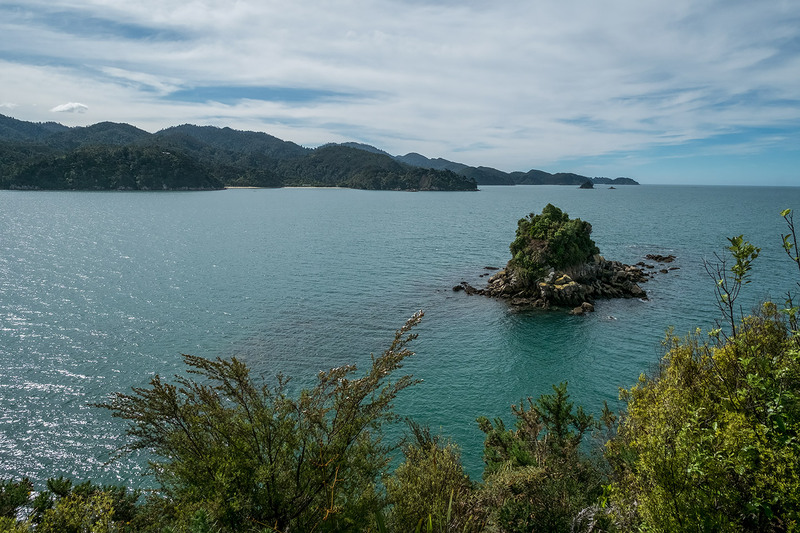 AWAROA TO TOTARANUI - Waiharakeke Bay. 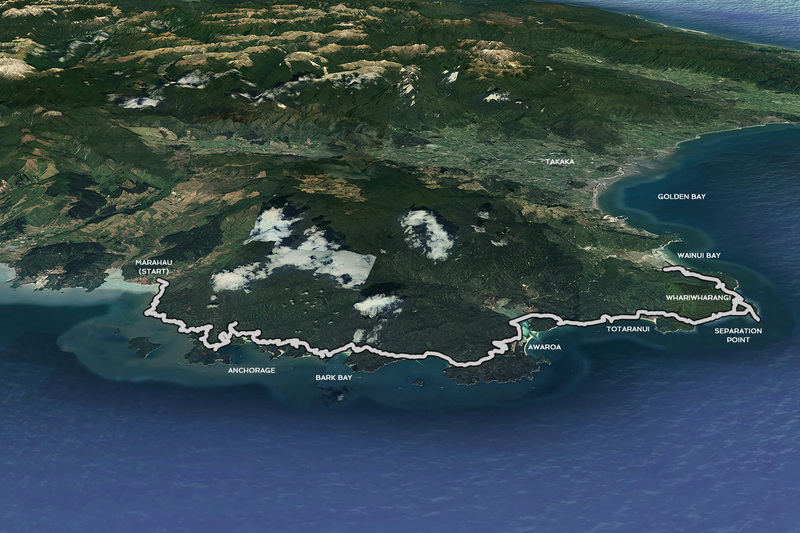 AWAROA TO TOTARANUI - Goat Bay. 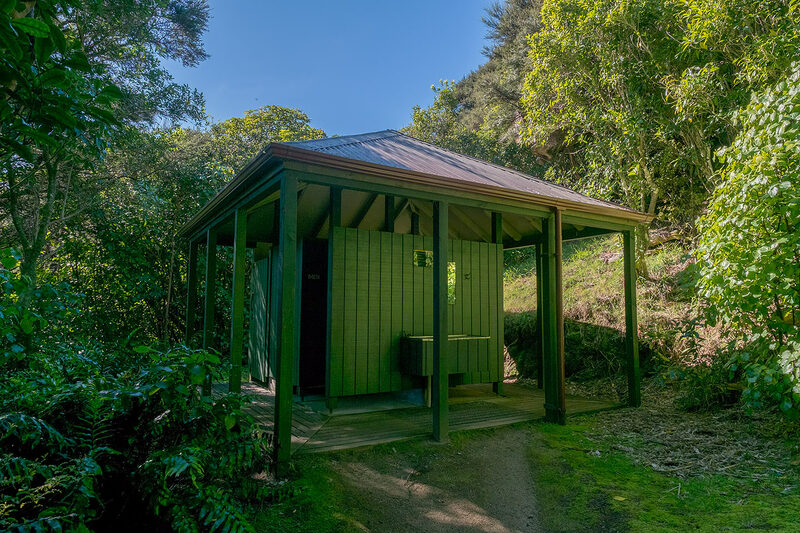 AWAROA TO TOTARANUI - Goat Bay has a toilet but no camping. 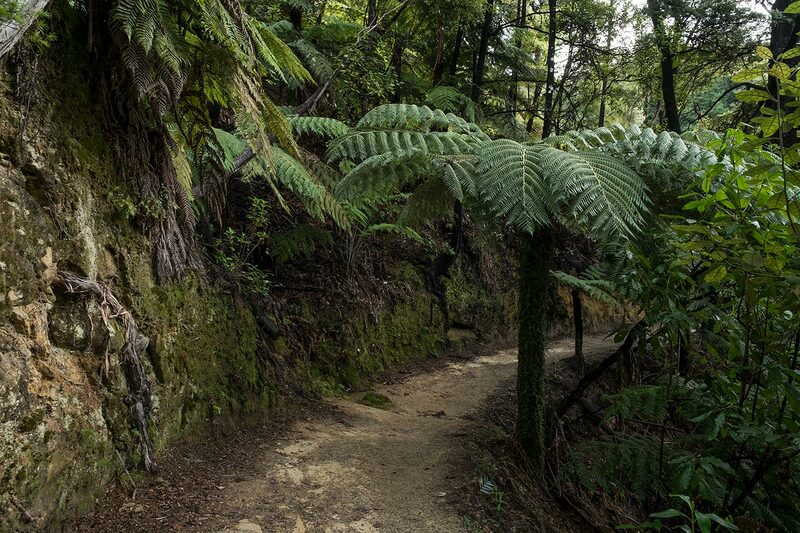 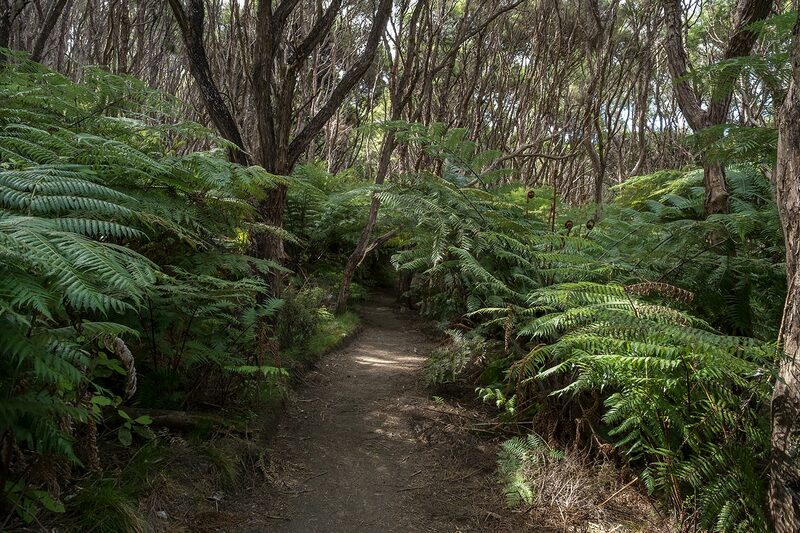 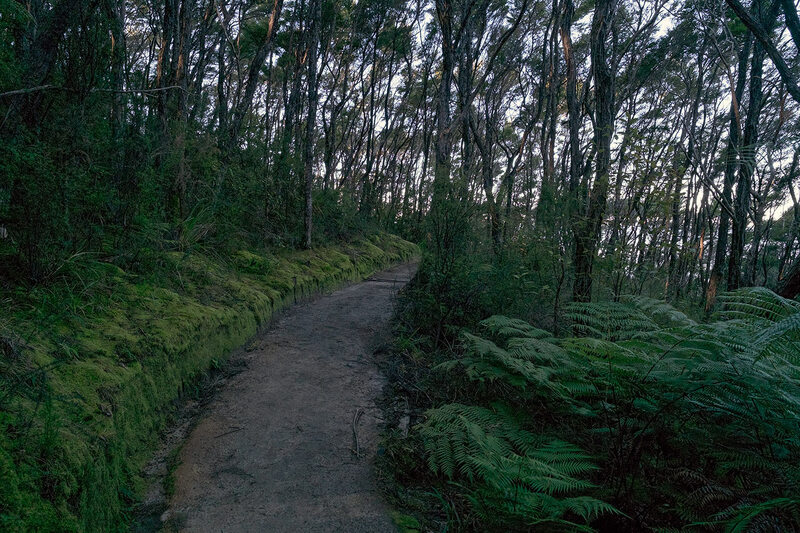 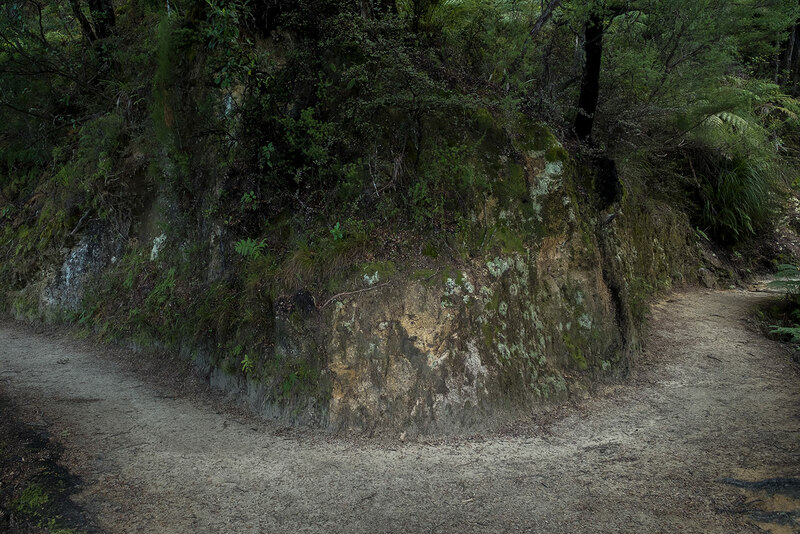 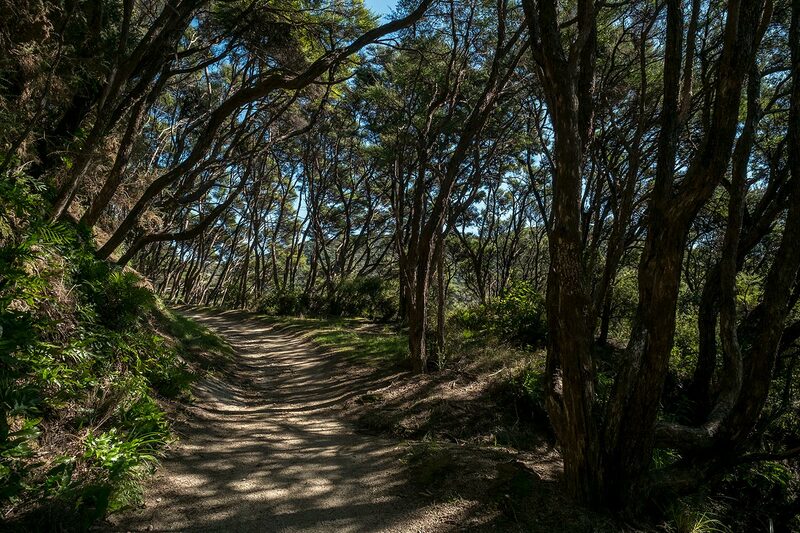 AWAROA TO TOTARANUI - The climb up from Goat Bay takes us through some beautiful forest. 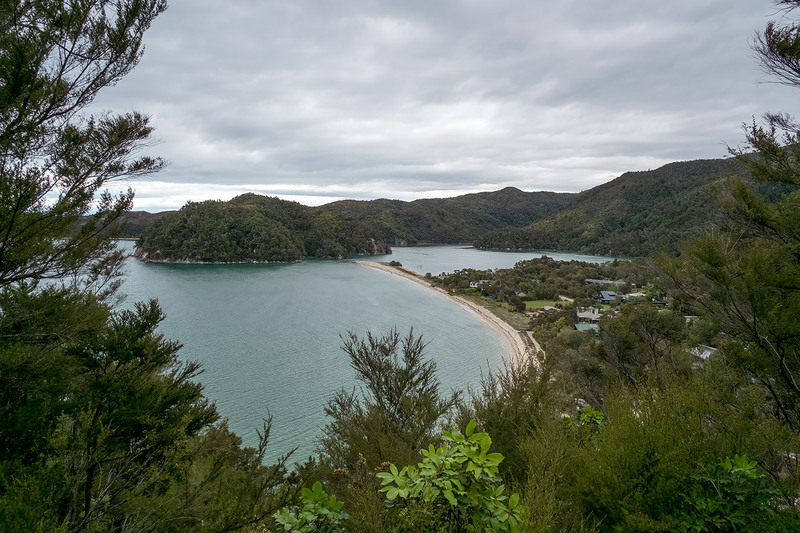 AWAROA TO TOTARANUI - At the bottom of the big hill we've climbed over from Goat Bay to Totaranui, we come to the side track to Skinner Point - a few minutes walk to a viewpoint overlooking Totaranui Beach. 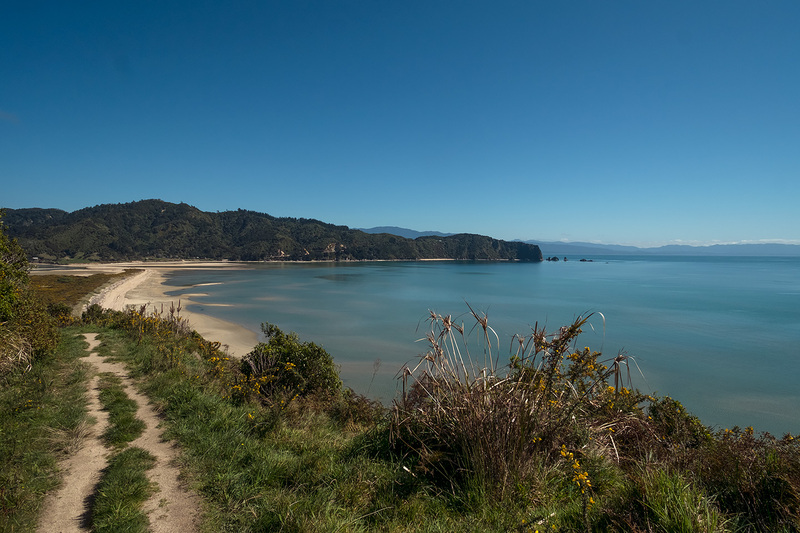 AWAROA TO TOTARANUI - View of Totaranui Beach from Skinner Point. 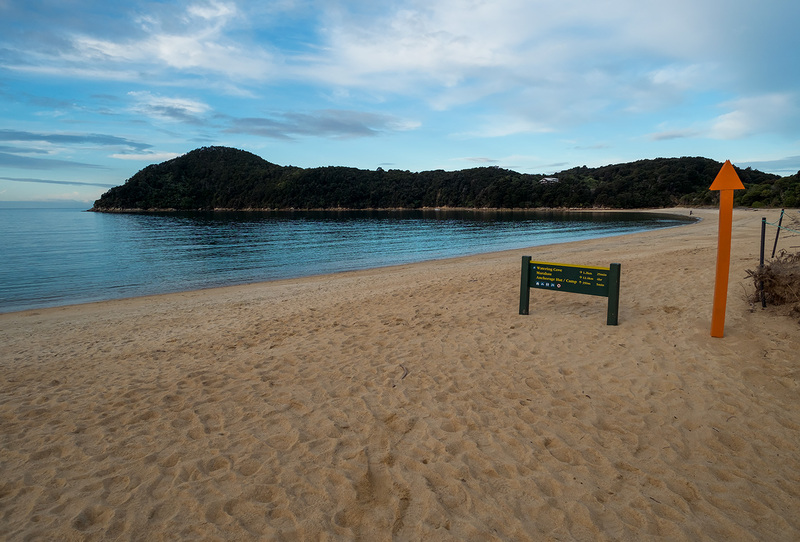 AWAROA TO TOTARANUI - The start of Totaranui Beach. 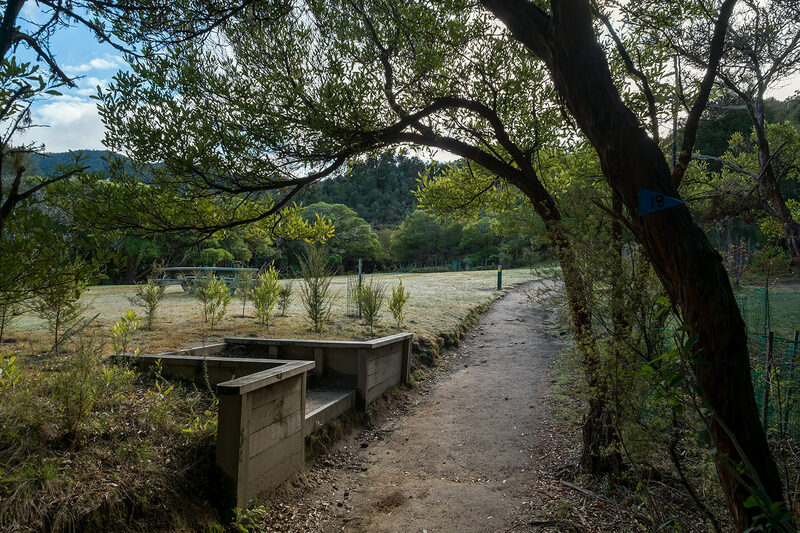 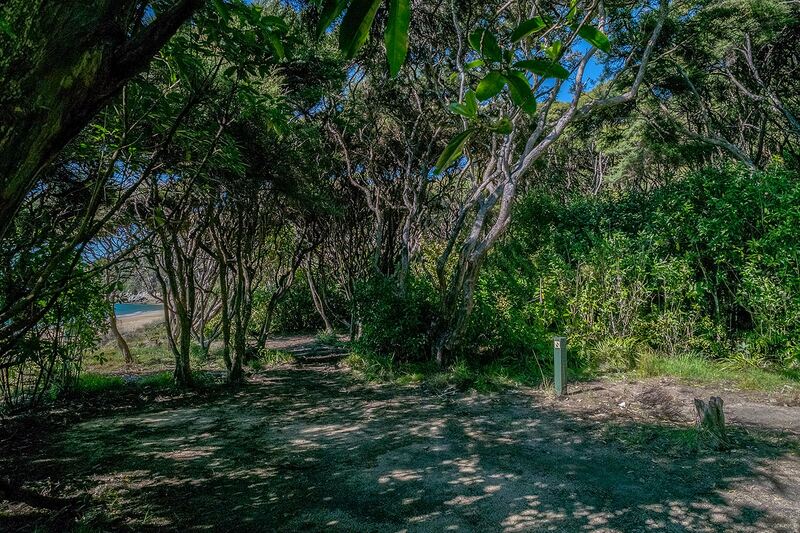 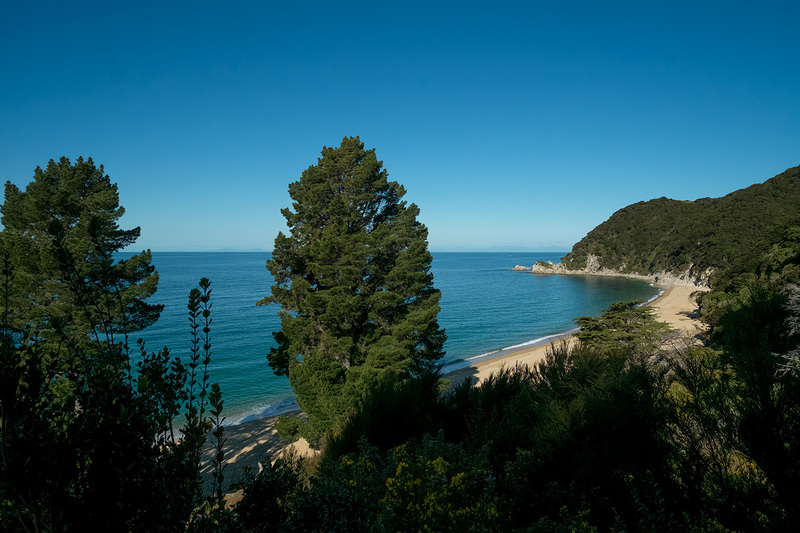 TOTARANUI CAMPGROUND - 269 nonpowered tent sites plus 20 nonpowered tent sites especially for Great Walk campers. 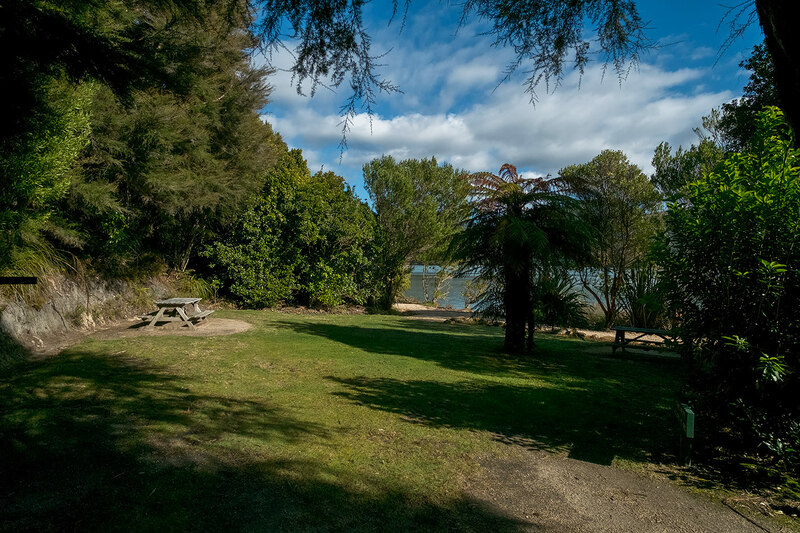 TOTARANUI CAMPGROUND - "A" Block. 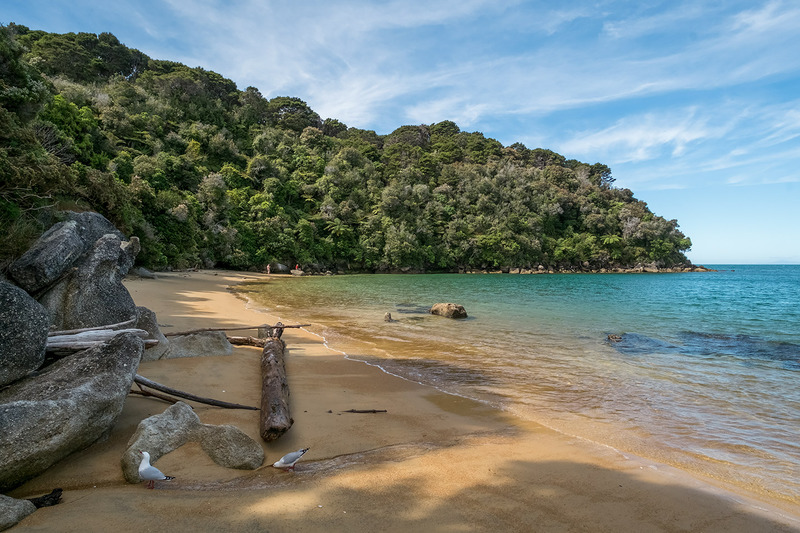 The fairly easy 3 hr 15 min, 9.8 km walk from Totaranui to Whariwharangi takes us through what most visitors describe as "the best part of the Abel Tasman". 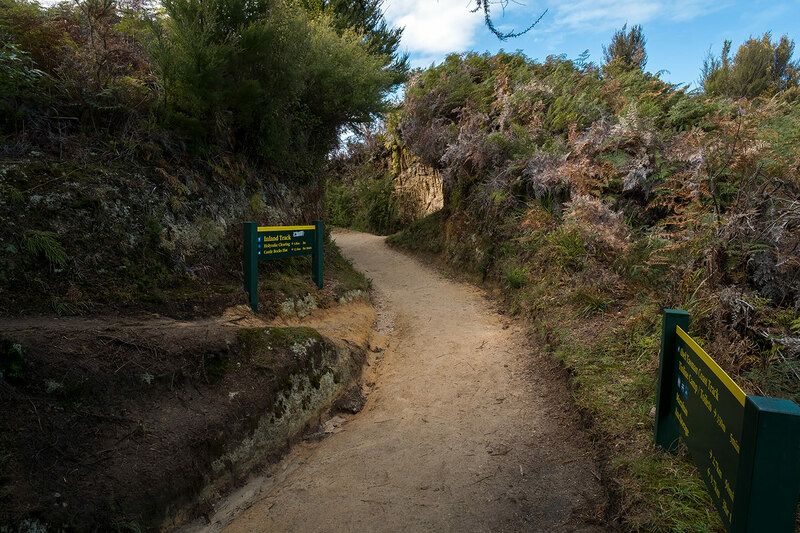 Comparatively few people explore this northern part of the park because of the way the park is marketed by business operators at the Marahau end of the track. 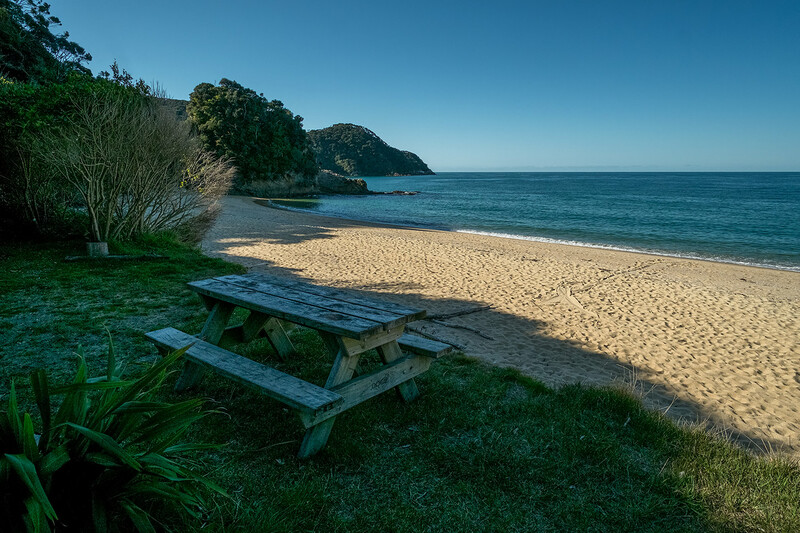 Aside from the fact that that this end of the park is more beautiful, the fact that so few people come north of Totaranui is undoubtedly part of its appeal. 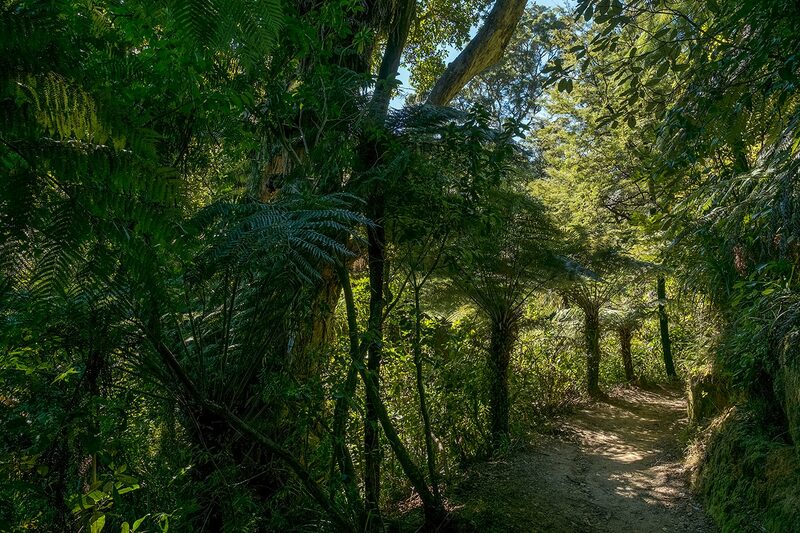 TOTARANUI - The avenue of London Plane trees at Totaranui was planted by the Gibbs family, in 1865. 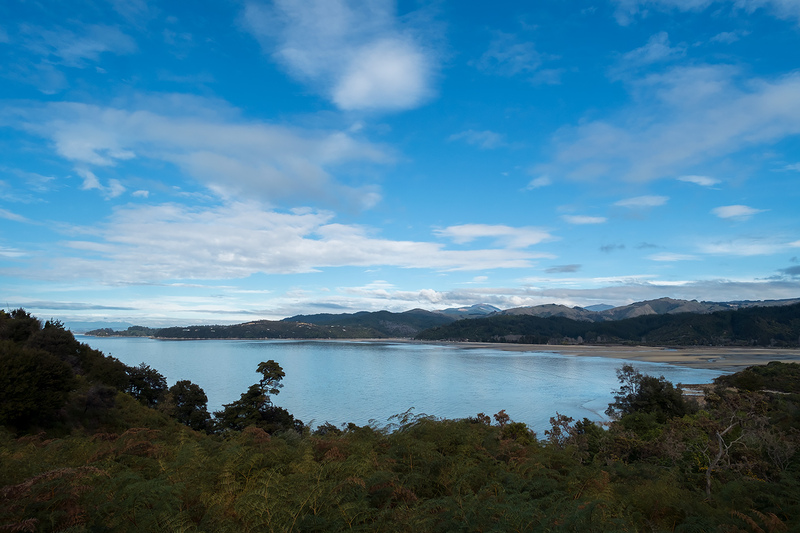 TOTARANUI - Ngarata Homestead and the start of the Abel Tasman Coast Track from Totaranui to Whariwharangi. 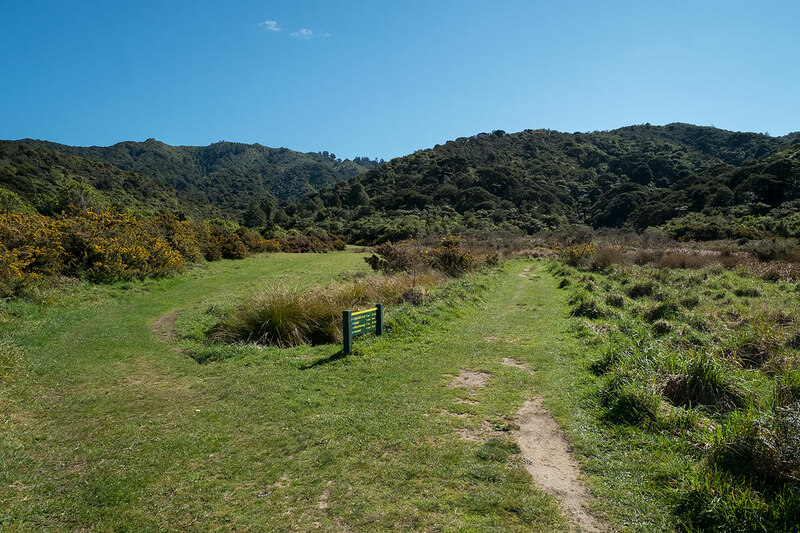 TOTARANUI TO WHARIWHARANGI - The track skirts the edge of the Totaranui Estuary then crosses this field. 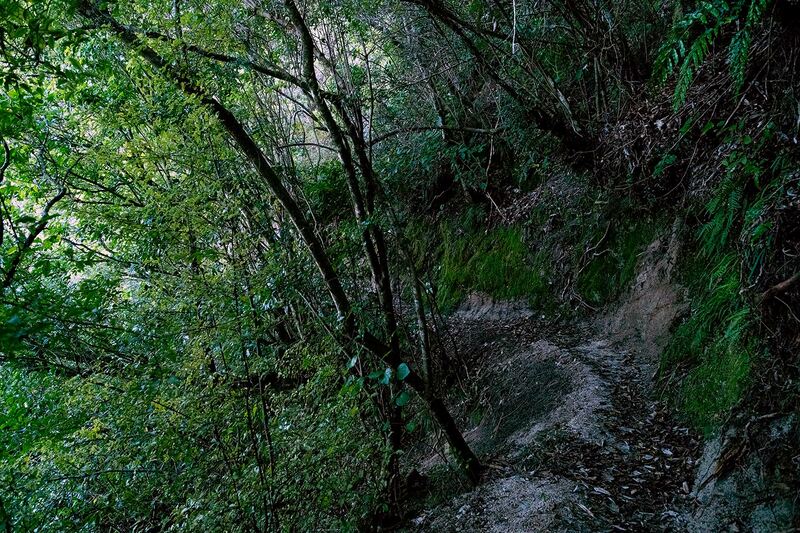 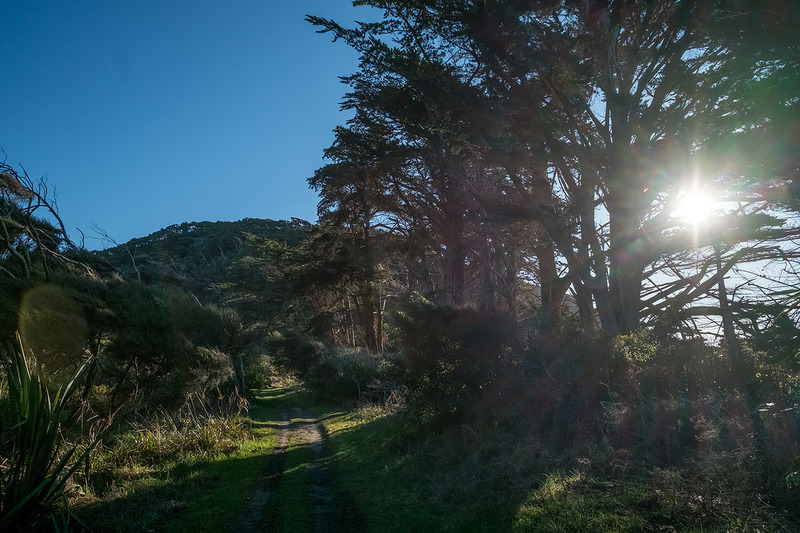 TOTARANUI TO WHARIWHARANGI - Here we take the lefthand track and climb over the hill. 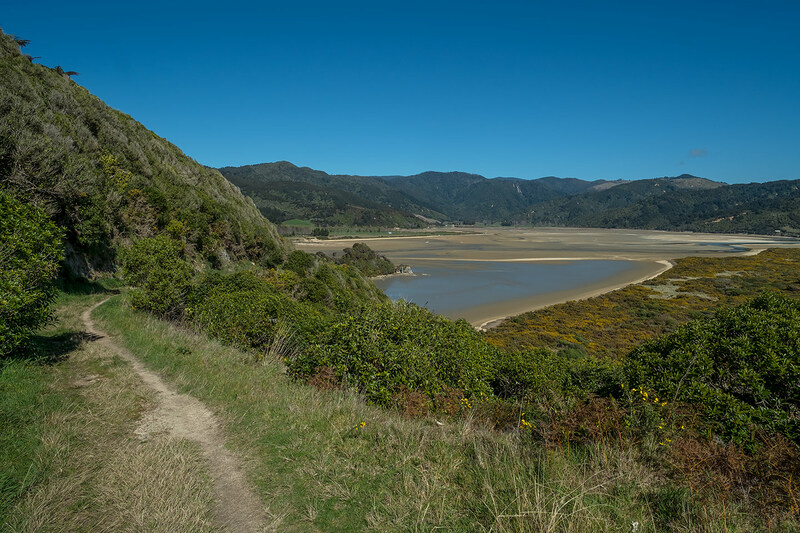 The track on the right goes around the edge of the estuary and leads to the beautiful Pukatea Track - an excellent side trip. 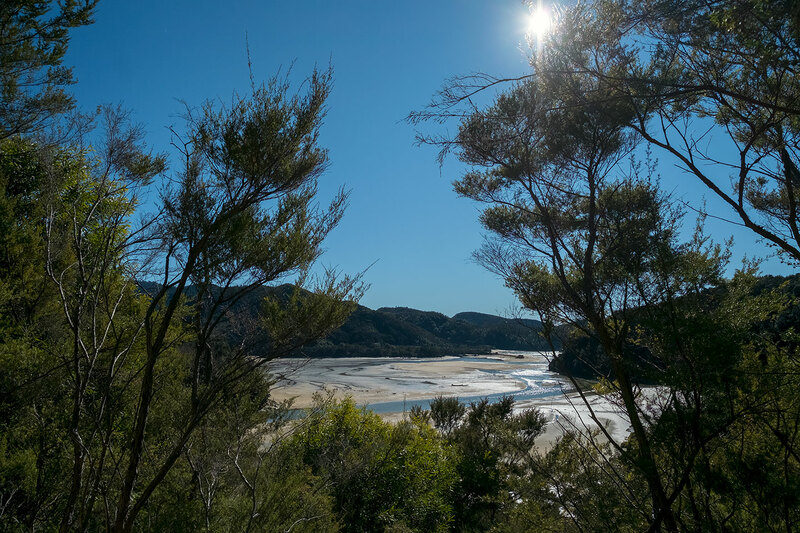 TOTARANUI TO WHARIWHARANGI - Looking back over Totaranui Estuary. 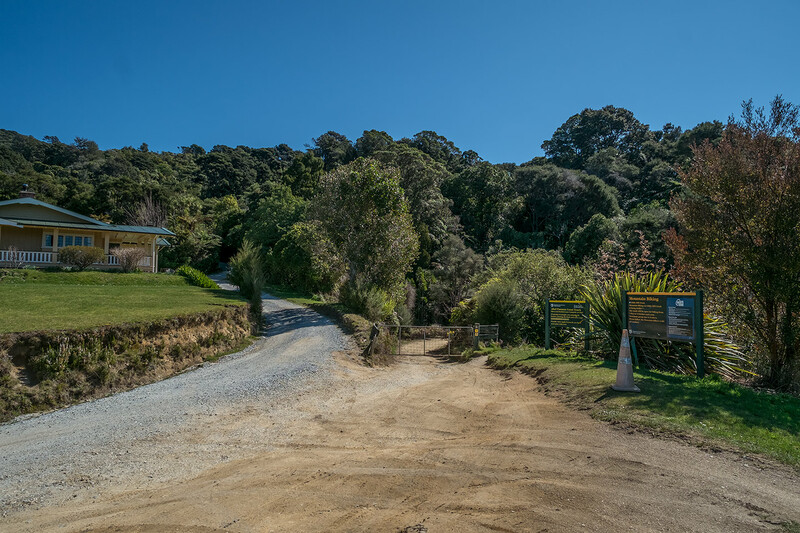 TOTARANUI TO WHARIWHARANGI - Nearing the top of the hill we come to this intersection. 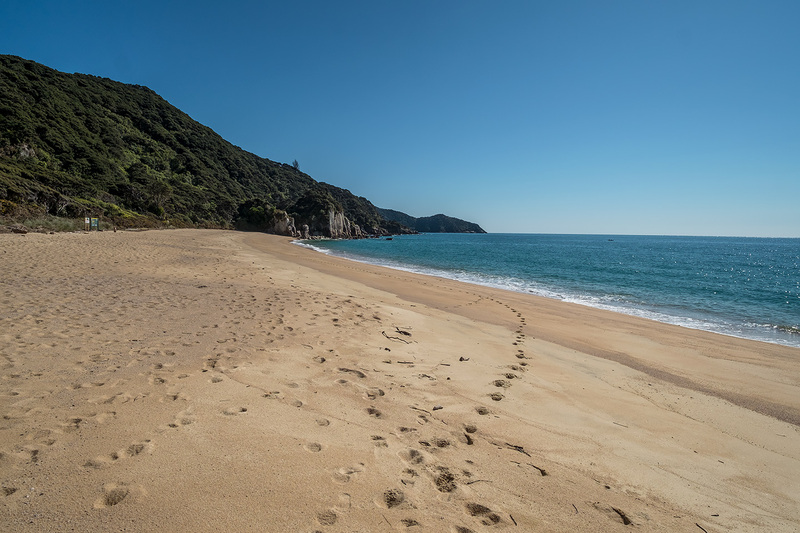 We take the track on the left towards Anapai Bay. 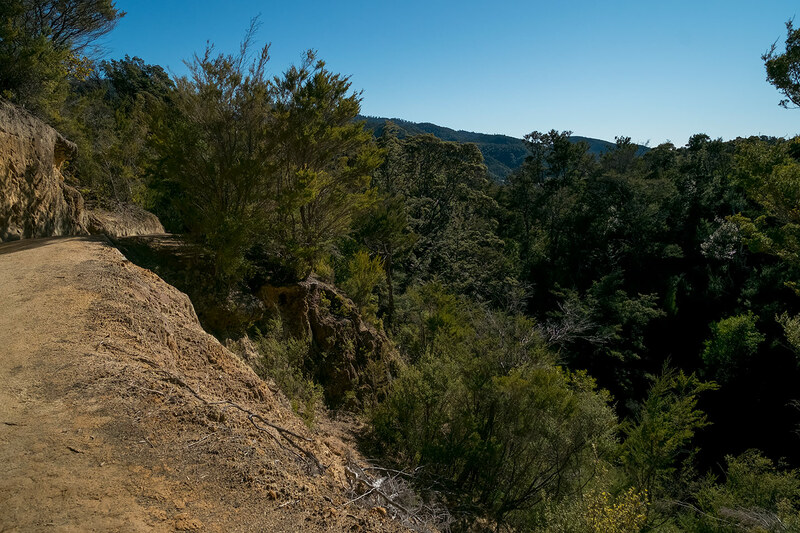 The track on the right is the Headlands Track which heads along the ridgeline and back down to Totaranui. 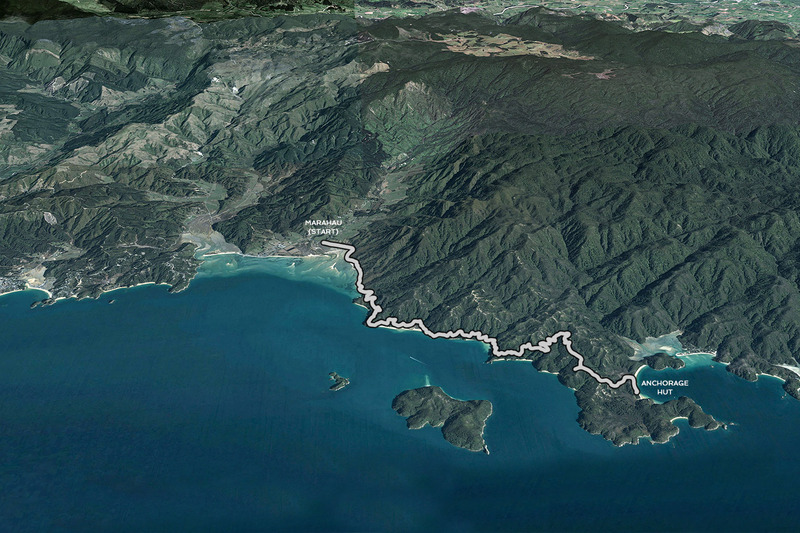 TOTARANUI TO WHARIWHARANGI - Heading downhill to Anapai Bay. 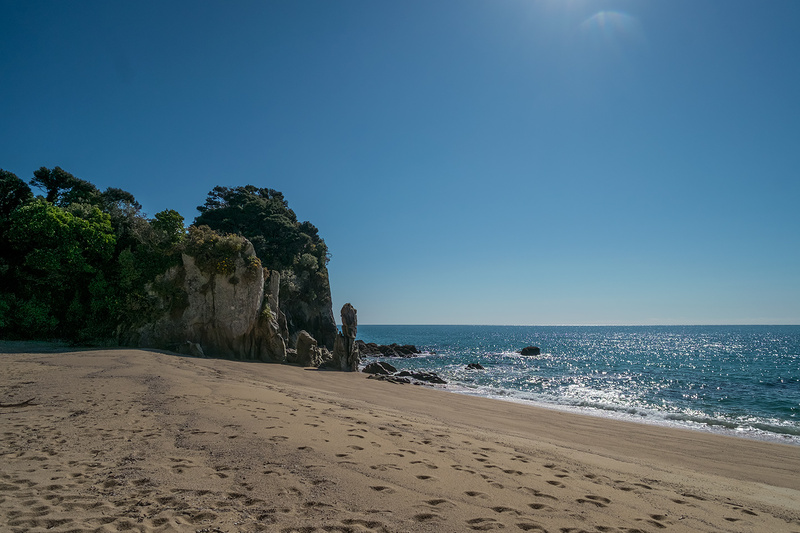 TOTARANUI TO WHARIWHARANGI - Anapai Bay. 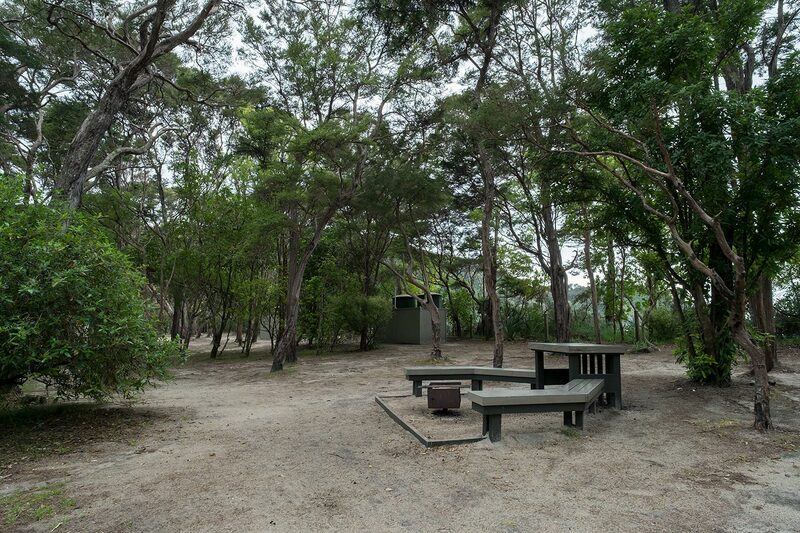 ANAPAI CAMPSITE - 6 nonpowered tent sites. 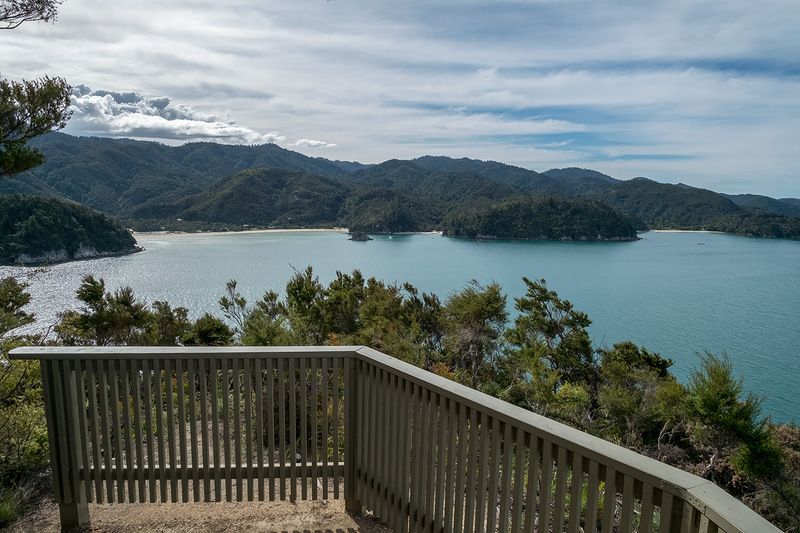 TOTARANUI TO WHARIWHARANGI - View overlooking Anatakapau Bay and Mutton Cove with Separation point in the distance. 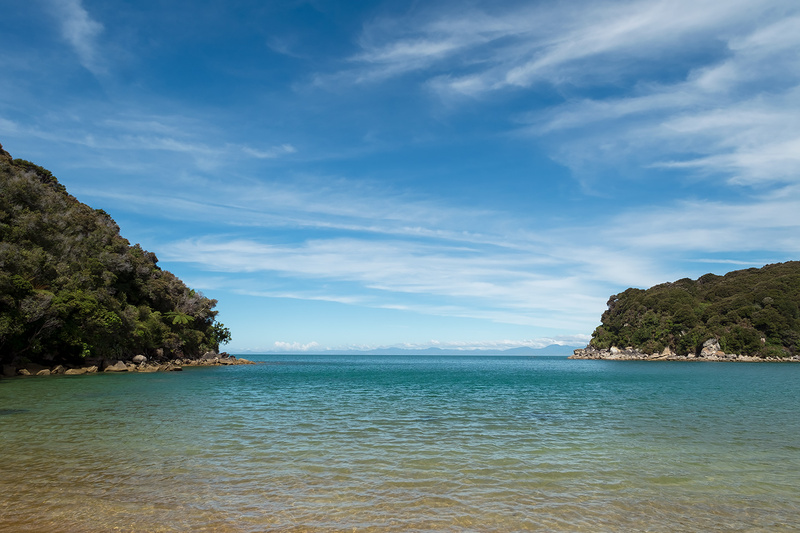 TOTARANUI TO WHARIWHARANGI - Anatakapau Bay. 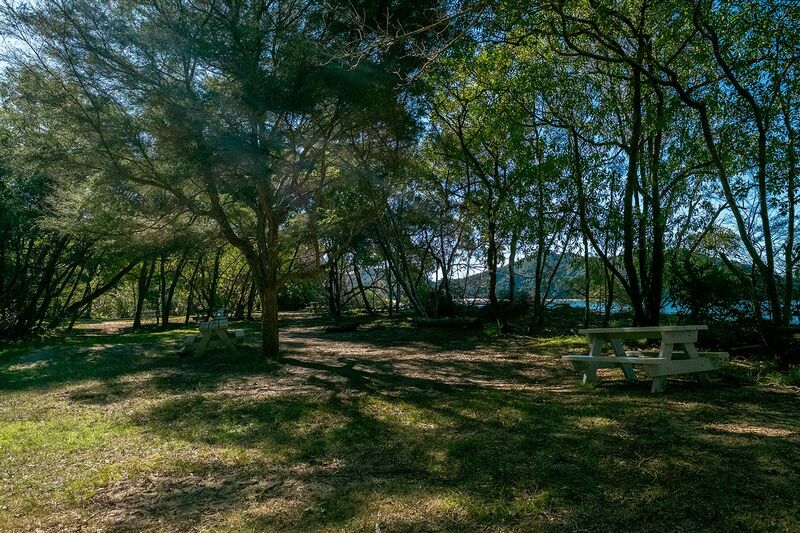 MUTTON COVE CAMPSITE - 20 nonpowered tent sites. 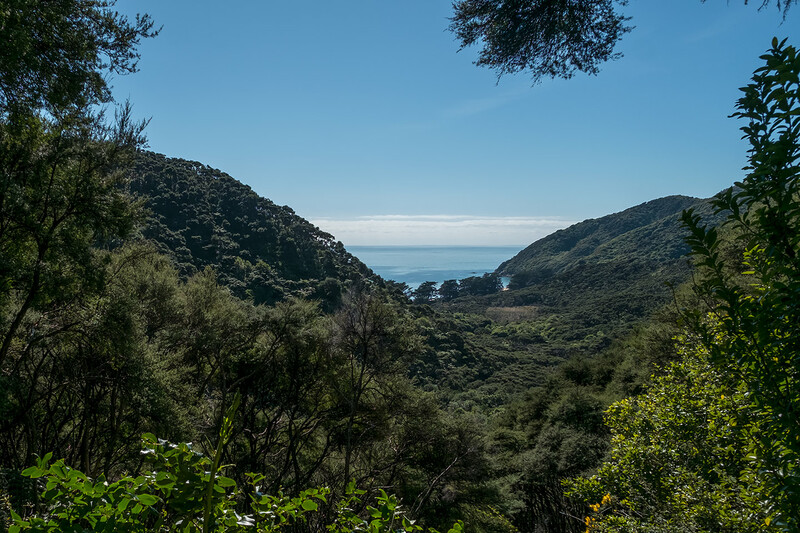 TOTARANUI TO WHARIWHARANGI - View over Mutton Cove Campsite and Anatakapau Bay. 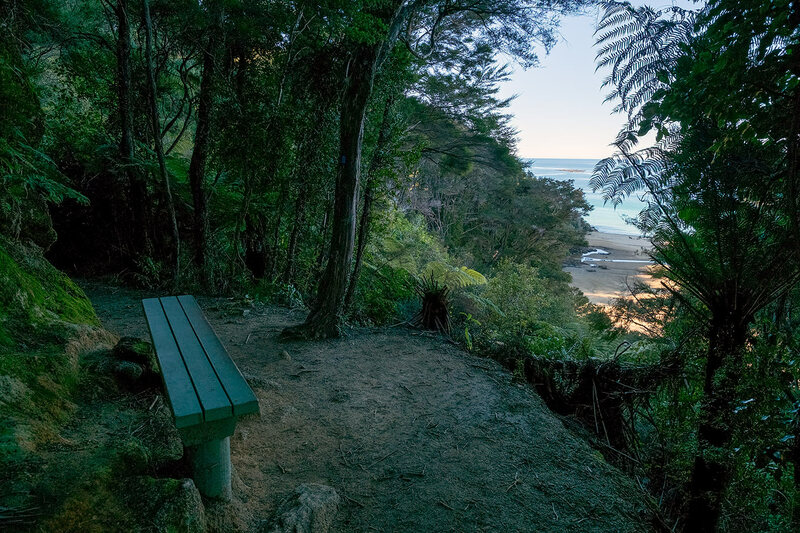 TOTARANUI TO WHARIWHARANGI - Seat overlooking Whariwharangi Bay. 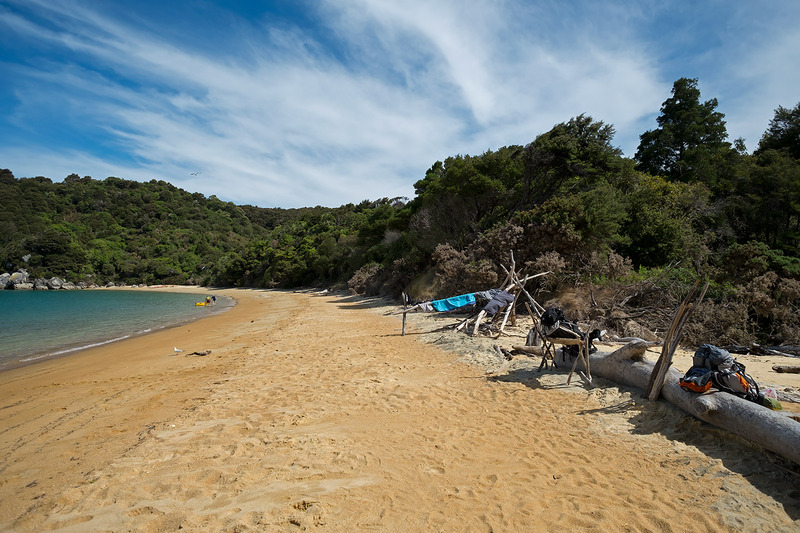 TOTARANUI TO WHARIWHARANGI - Whariwharangi Bay. 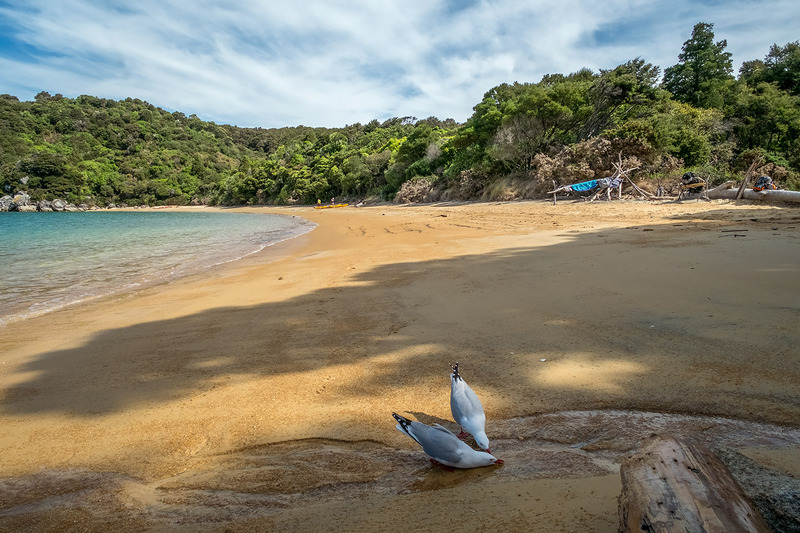 TOTARANUI TO WHARIWHARANGI - Walking along Whariwharangi Bay. 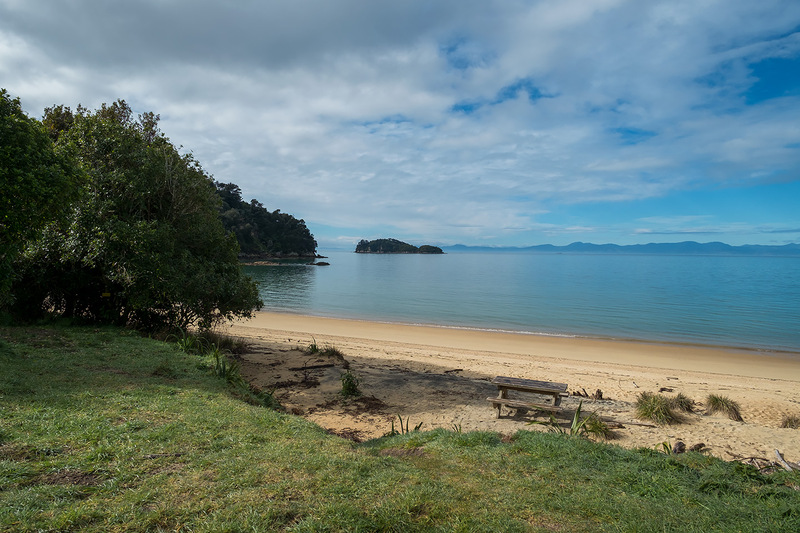 TOTARANUI TO WHARIWHARANGI - Whariwharangi Beach. 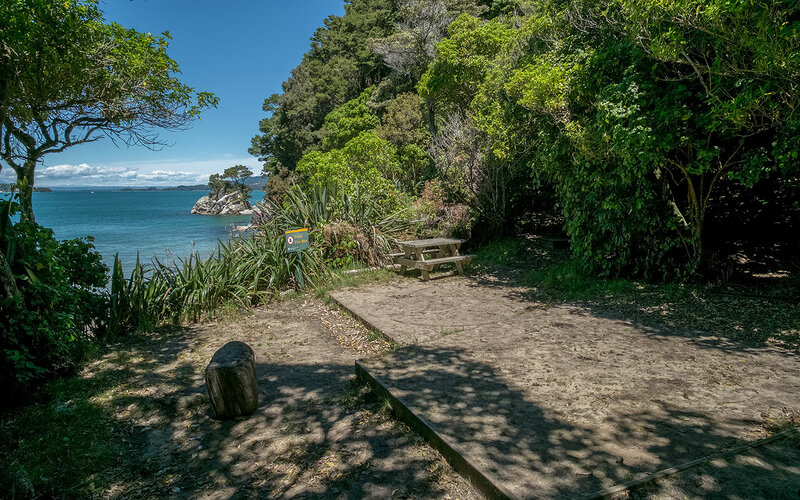 TOTARANUI TO WHARIWHARANGI - The track from Whariwharangi Beach to Whariwharangi Hut. 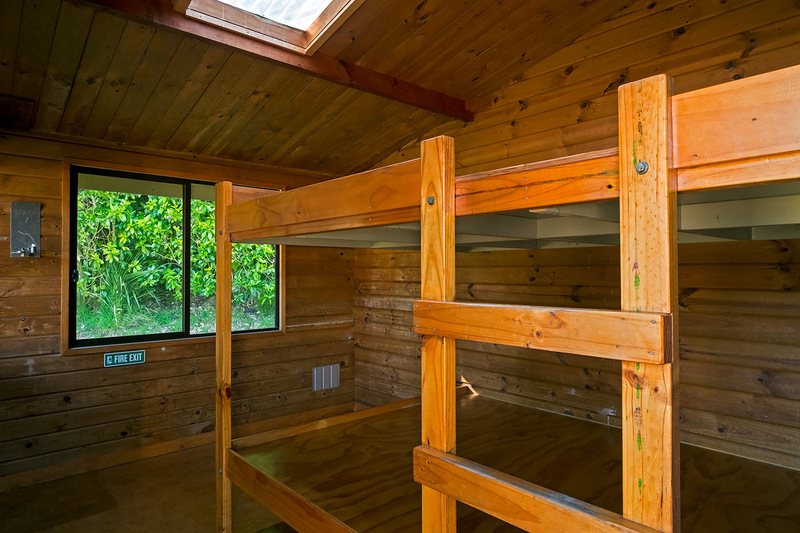 WHARIWHARANGI HUT - 20 bunk beds, Woodburner for heating hut. 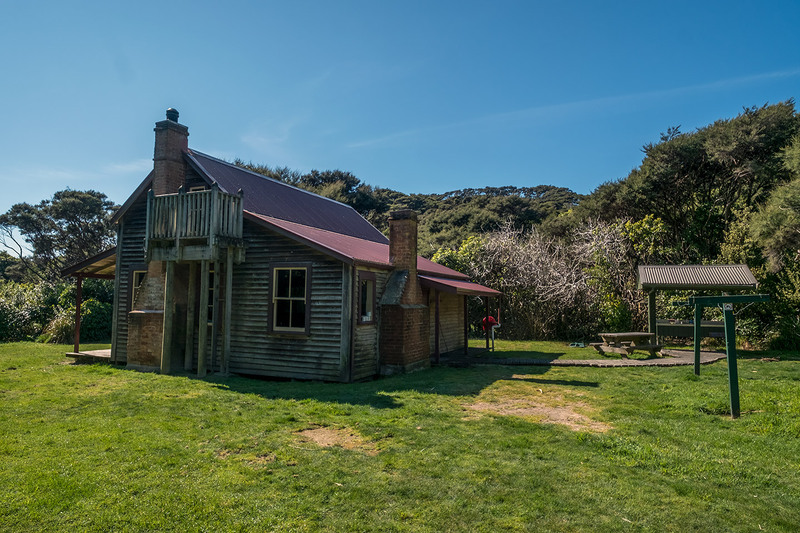 WHARIWHARANGI HUT - Lawn and Washing Facilities (right). 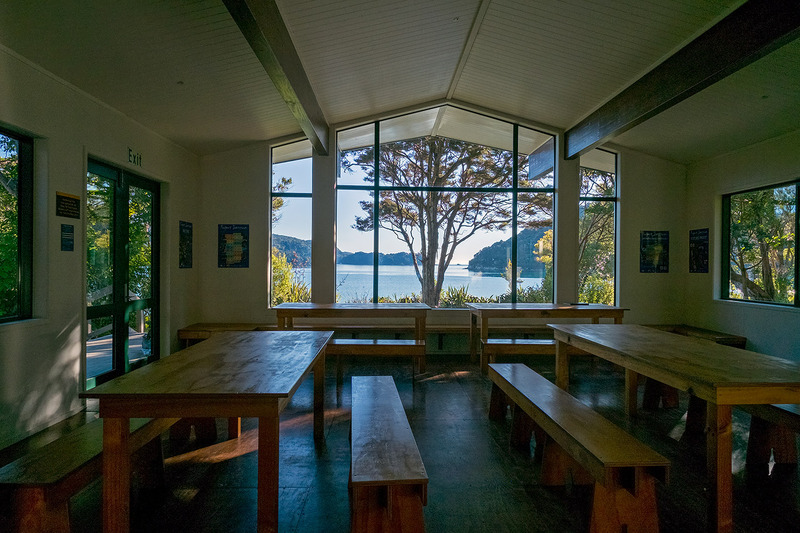 WHARIWHARANGI HUT - Dining Area. 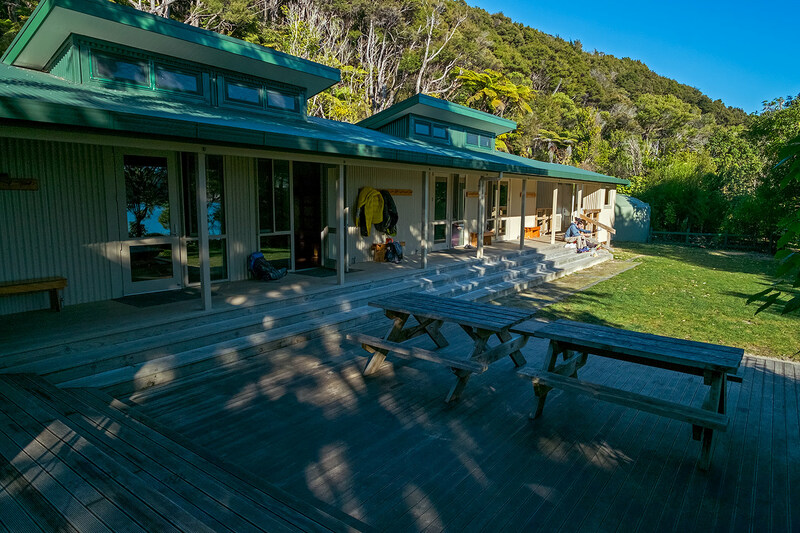 WHARIWHARANGI HUT - Small Downstairs Bunkroom (sleeps 2). 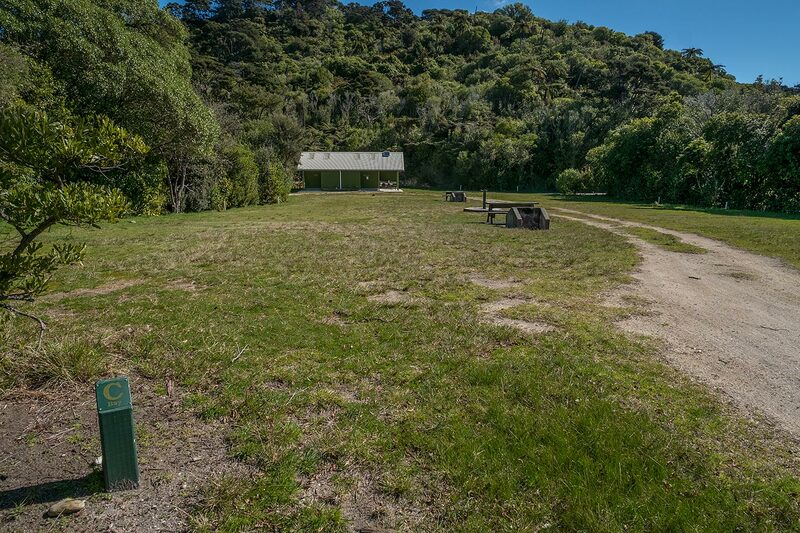 WHARIWHARANGI HUT - Large Downstairs Bunkroom. 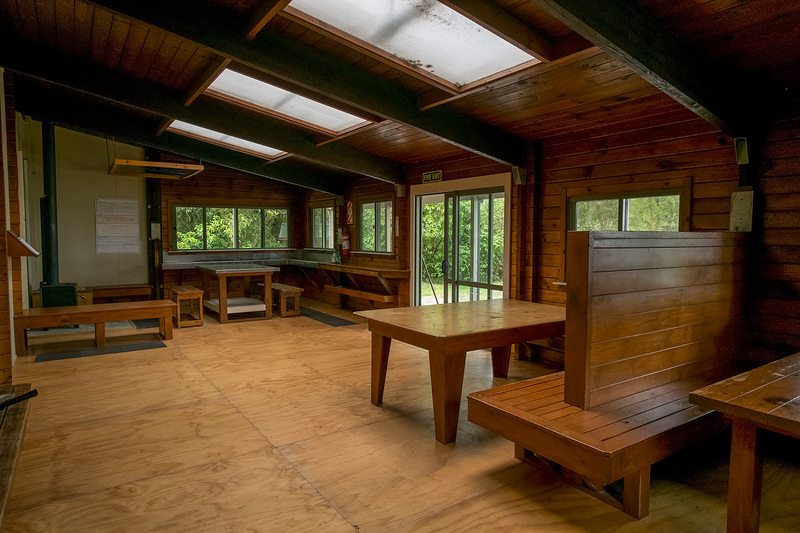 WHARIWHARANGI HUT - Large Upstairs Bunkroom. 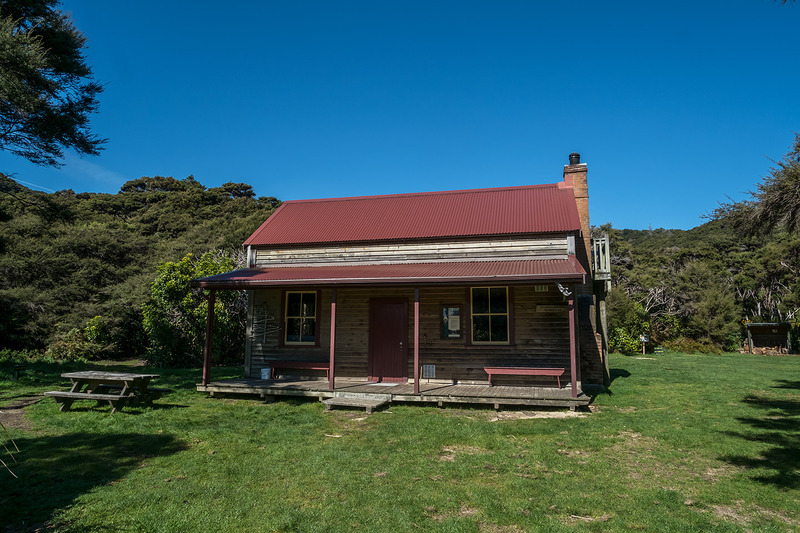 WHARIWHARANGI HUT - Small Upstairs Bunkroom. 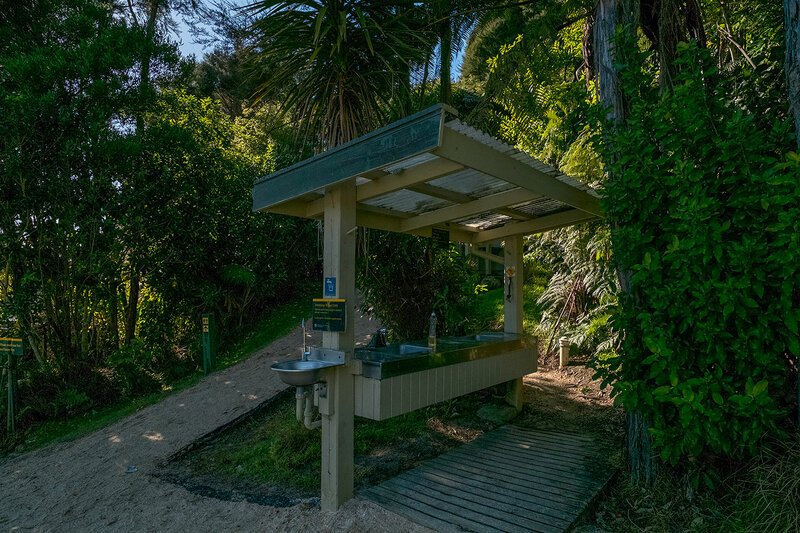 WHARIWHARANGI HUT - Washing Facilities. 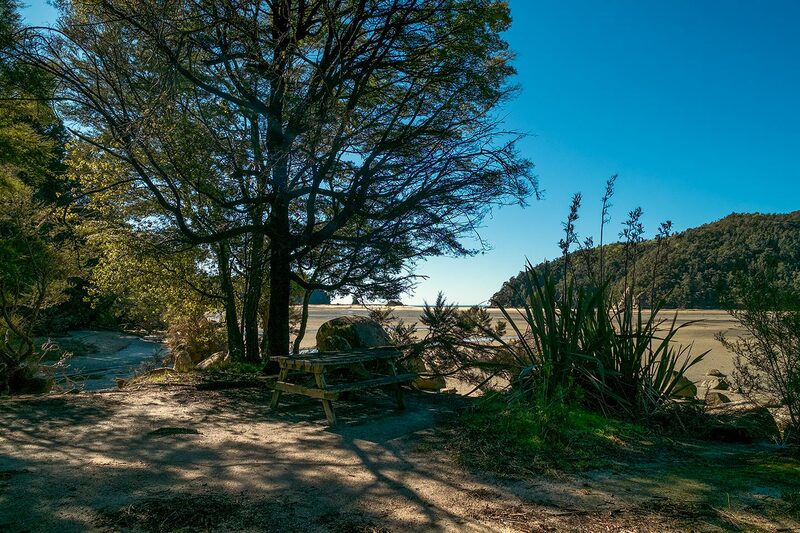 WHARIWHARANGI CAMPSITE - 20 nonpowered tent sites. 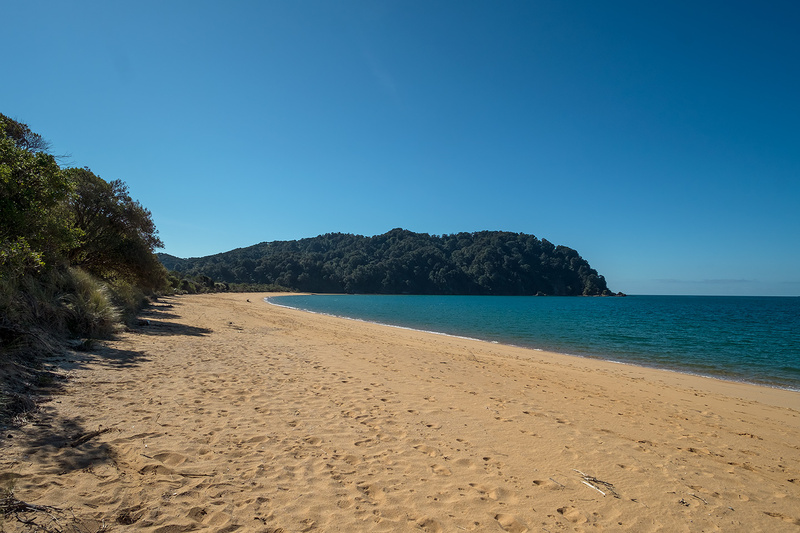 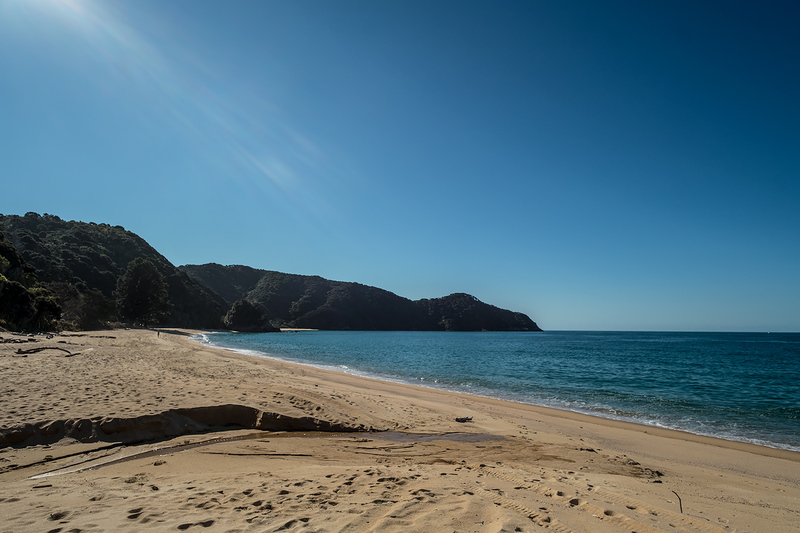 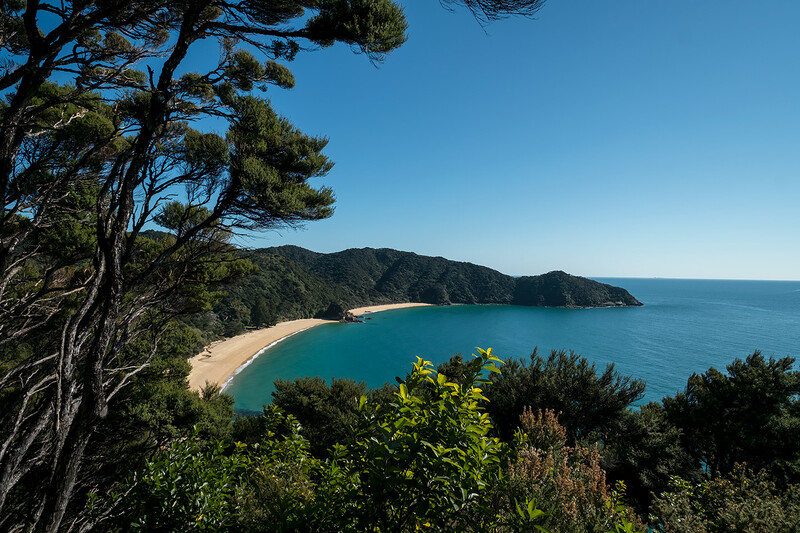 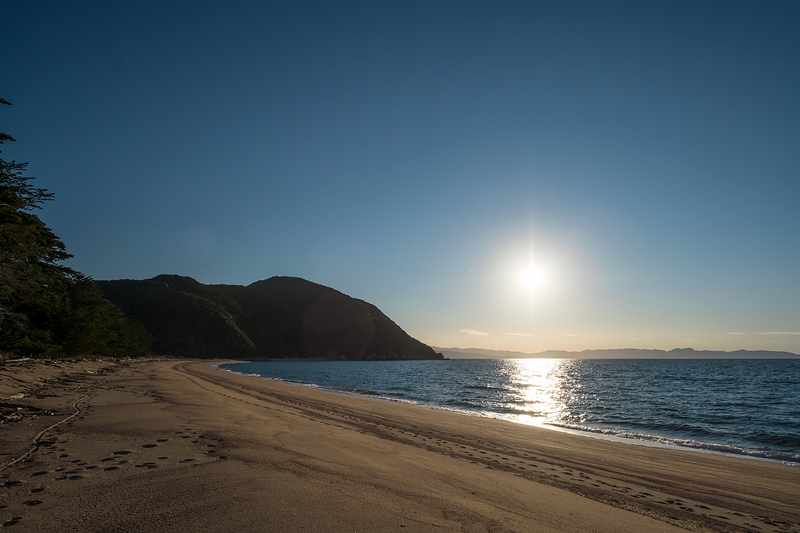 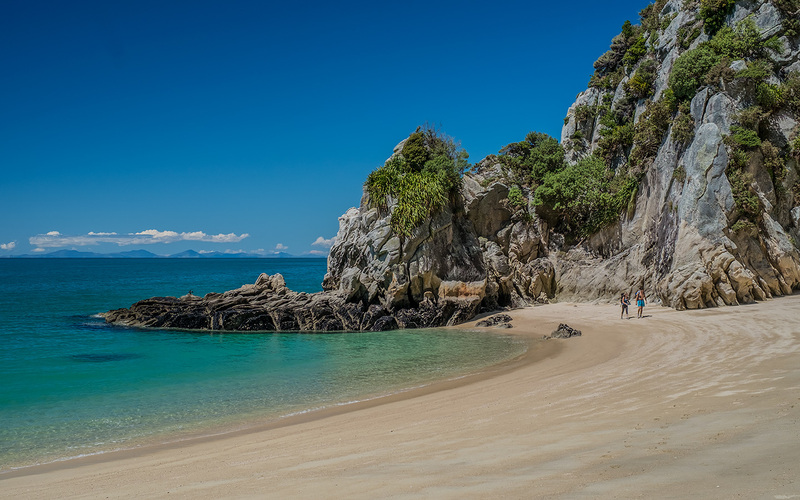 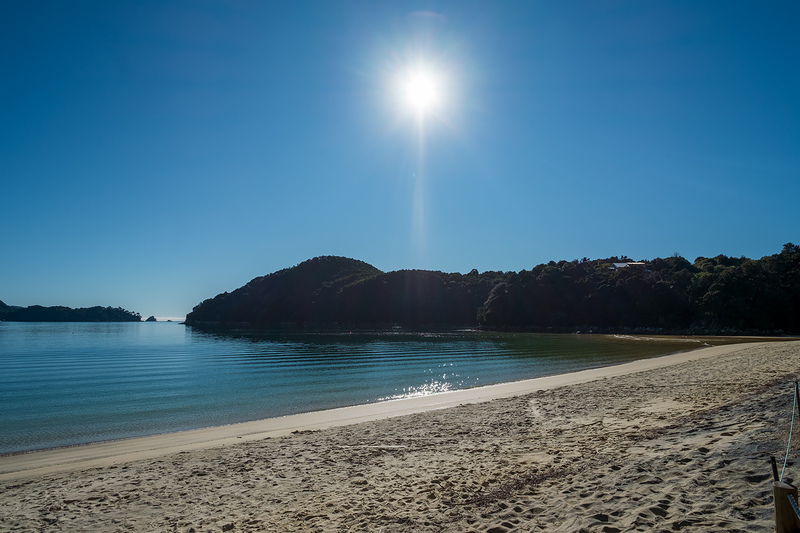 WHARIWHARANGI TO WAINUI - The easy 5.7 km walk from Whariwharangi Hut to the end of the Abel tasman Coast track at Wainui Bay takes 2 hours. 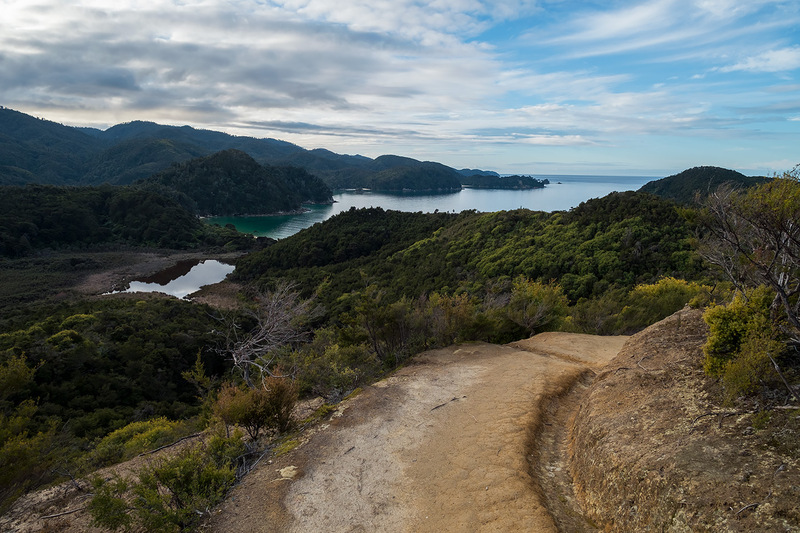 WHARIWHARANGI TO WAINUI - A steady climb brings us to this point where we can see Whariwharangi Hut down there in the foreground. 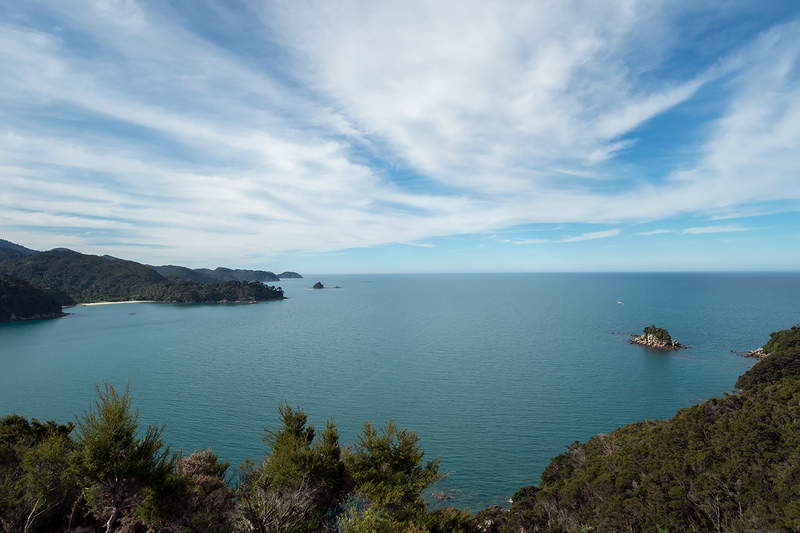 WHARIWHARANGI TO WAINUI - At the summit of our day's climb, we look down on Wainui Bay. 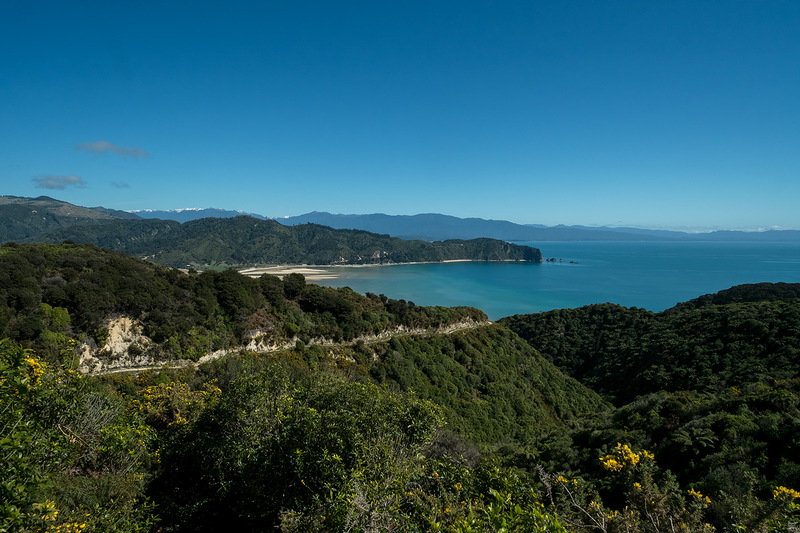 WHARIWHARANGI TO WAINUI - Zig-zagging our way down into Wainui Bay. 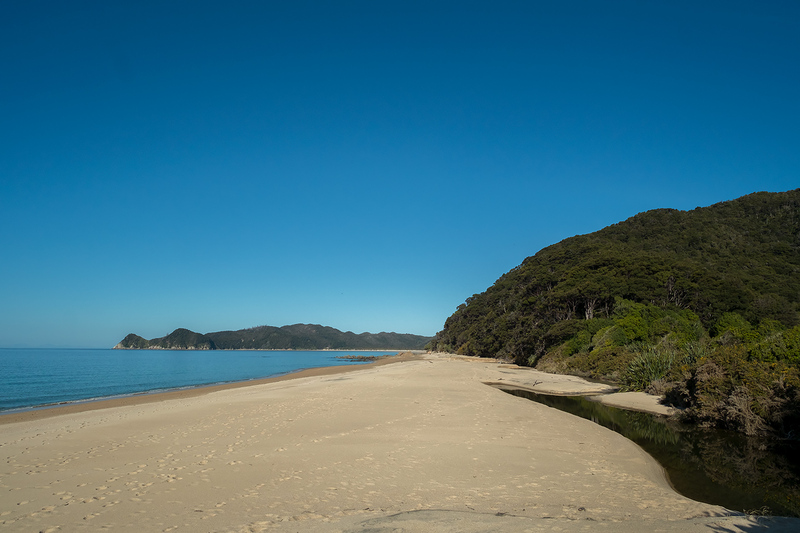 WHARIWHARANGI TO WAINUI - Beautiful Wainui Bay with Uarau Point on the right. 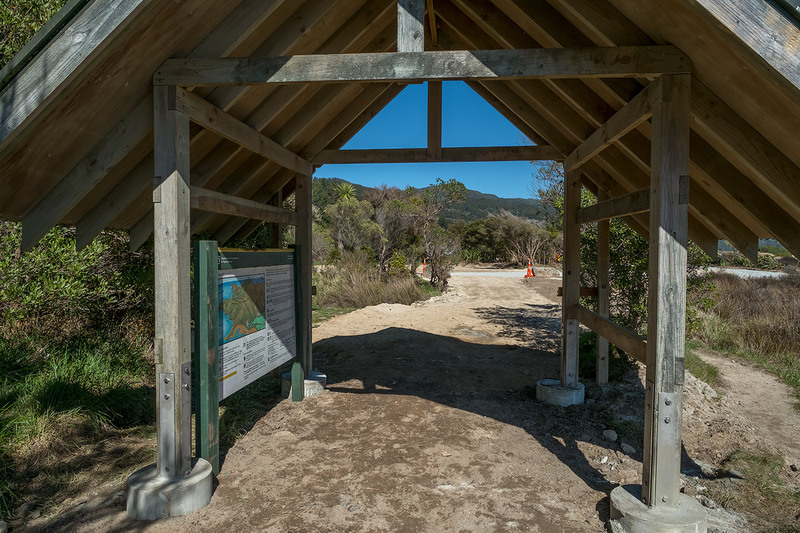 WHARIWHARANGI TO WAINUI - End of the track.